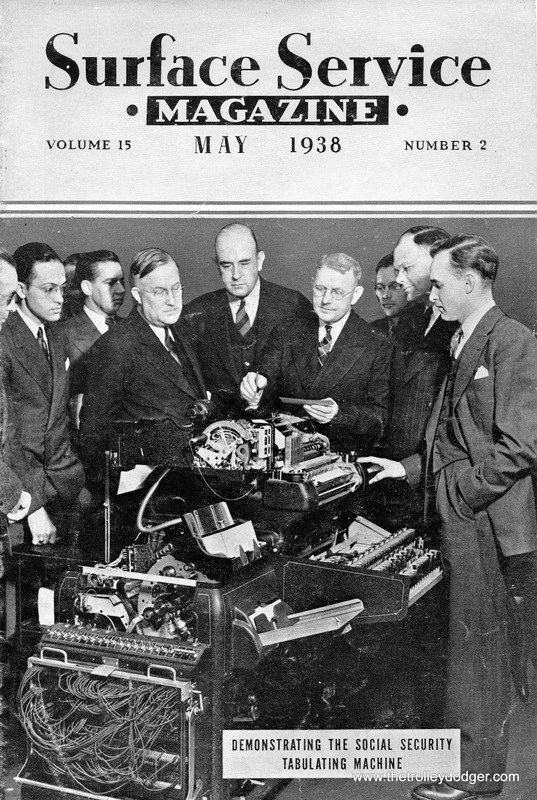 Kenneth Gear, author of today’s post, has long been a friend of this blog. 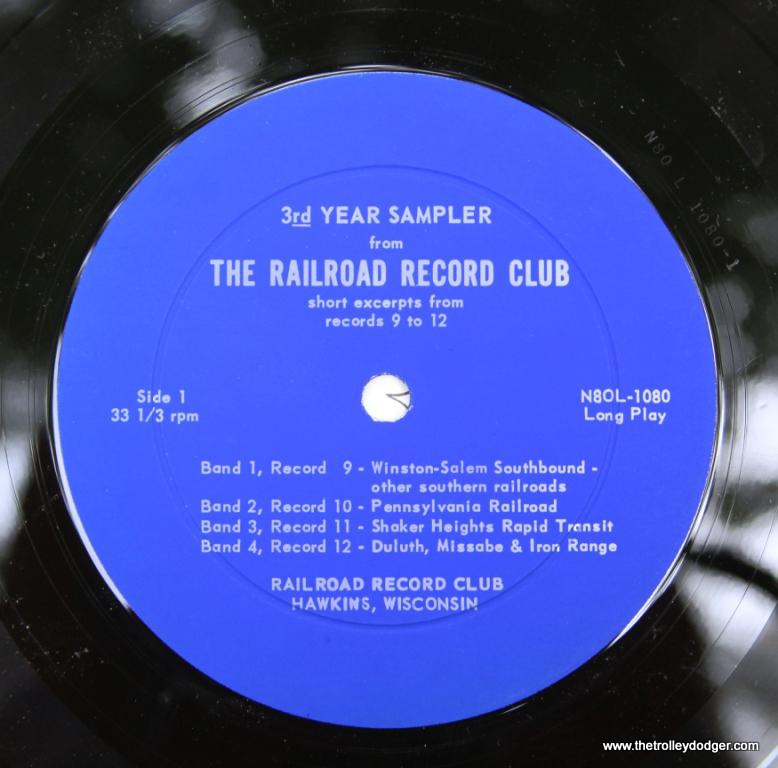 Since we began writing about William A. Steventon and the Railroad Record Club of Hawkins, Wisconin (see our previous posts A Railroad Record Club Discography and Revisiting the Railroad Record Club), Ken has been very helpful in obtaining recordings in our quest to reissue the entire RRC oeuvre for the digital age. Recently, following up on a lead for some RRC material, Ken traveled from New Jersey to the Midwest. The discoveries he is sharing with you today are the result. This represented a tremendous investment of time and money for Ken who, like myself is of very modest means. 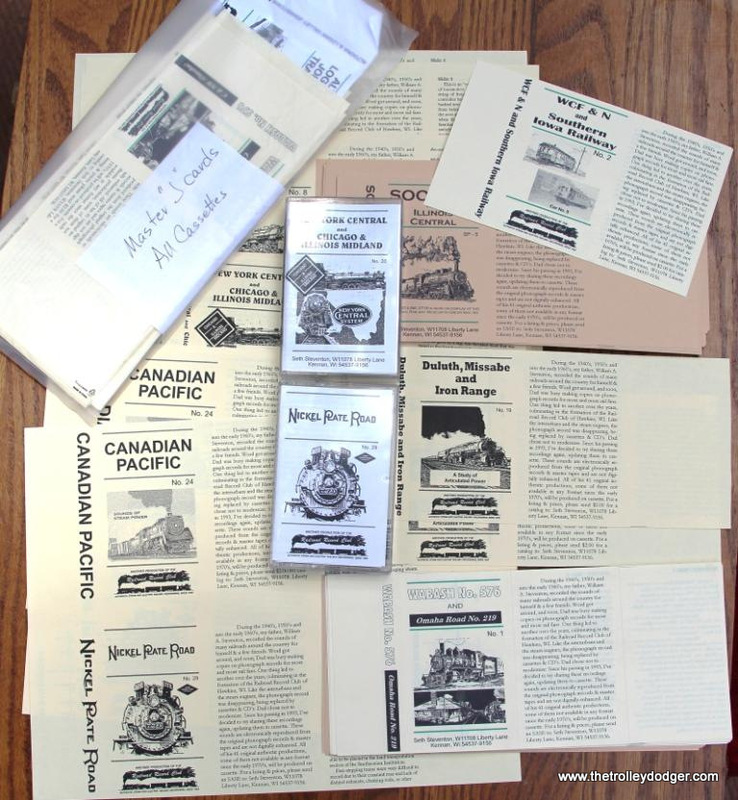 Since there is only a very limited market for railroad audio (the whole world, apparently, being transfixed with video), chances are we will never be able to recoup Ken’s costs. He does not care about that, since his main interest is in preserving these historic recordings for future generations. Ken is doing this for the love of it, not the money. 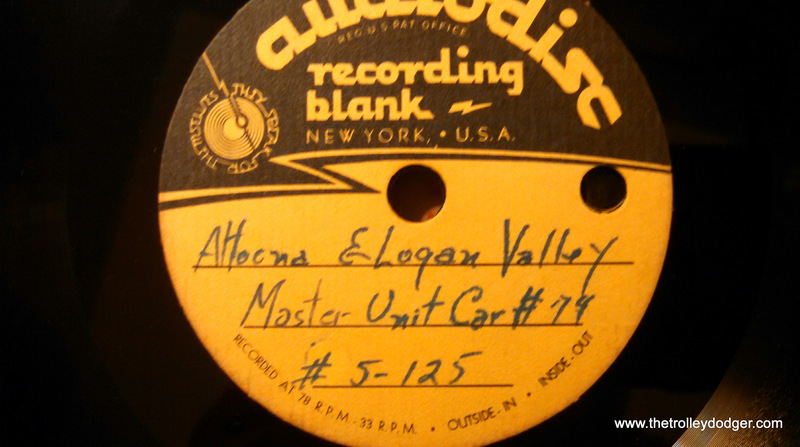 Thanks to Ken, we will now be able to reach our goal of remastering all 41 issued Railroad Record Club recordings onto compact discs. We will let you know when that work is done. The only ones we don’t have now are some of the samplers. 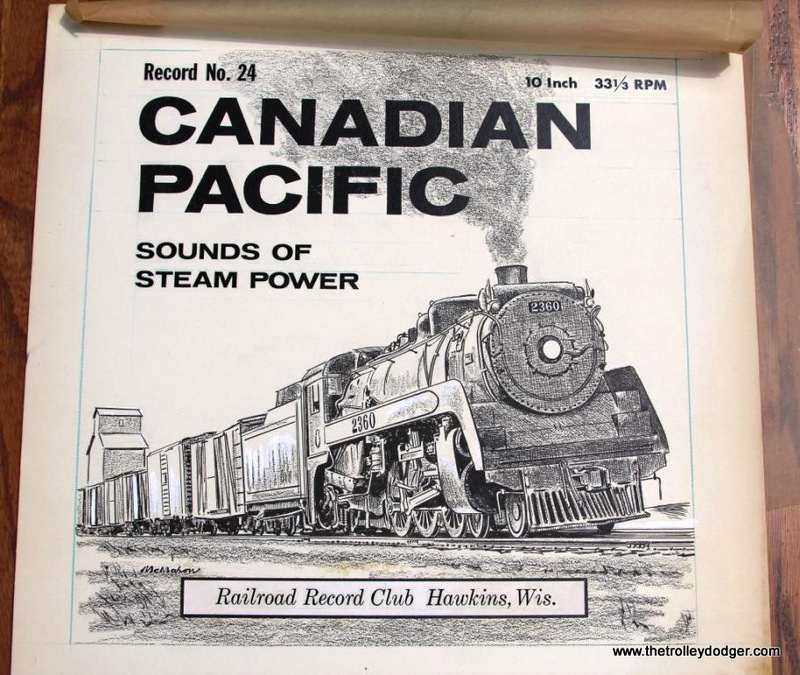 One unexpected benefit of his quest is the discovery of additional unissued steam and electric RRC recordings, detailed below. 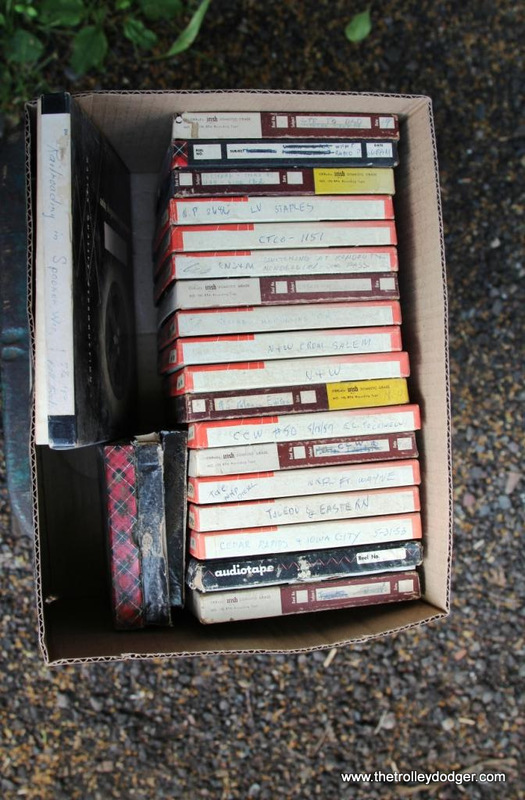 Due to the limits of Ken’s budget, he was unfortunately not yet able to purchase what appear to be the original RRC master tapes. If you are interested in making a contribution to that worthwhile effort, please let us know. 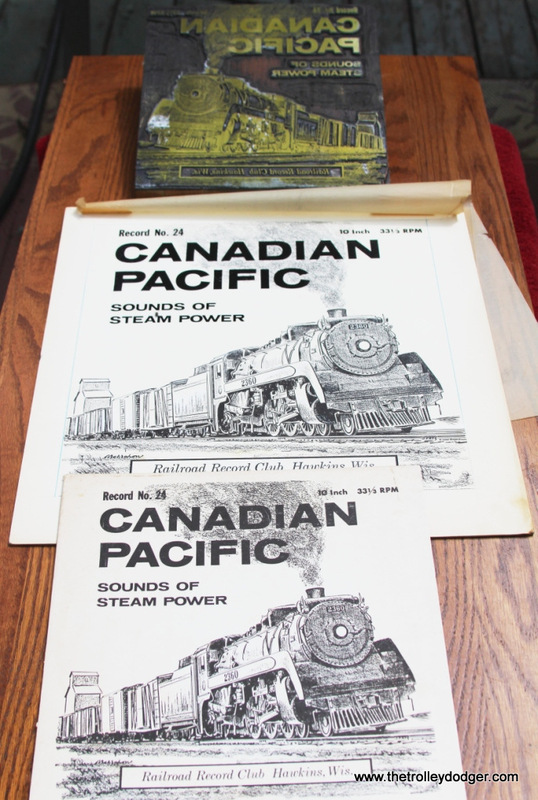 Any donations received will help Ken negotiate for their purchase, and make it possible to preserve these fine recordings for future generations of railfans. They are currently at risk of being lost forever. It is remarkable that this collection somehow managed to stay intact for 24 years after Steventon’s death. 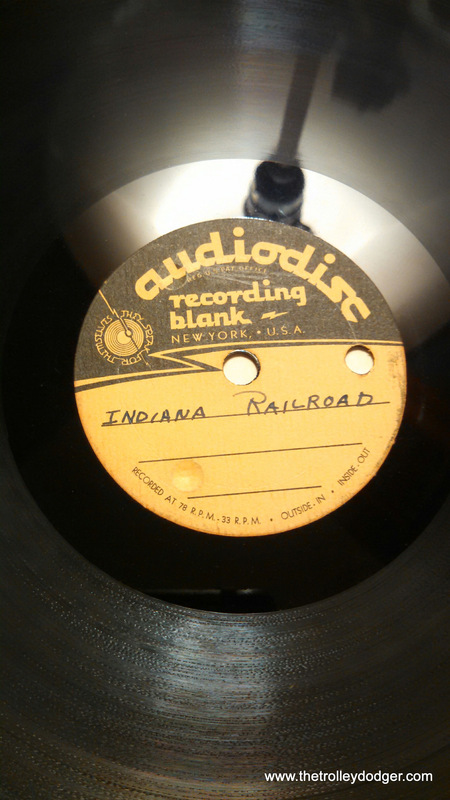 PS- The disc labeled Indiana Railroad is actually Steventon reciting a history of the Hoosier interurban. 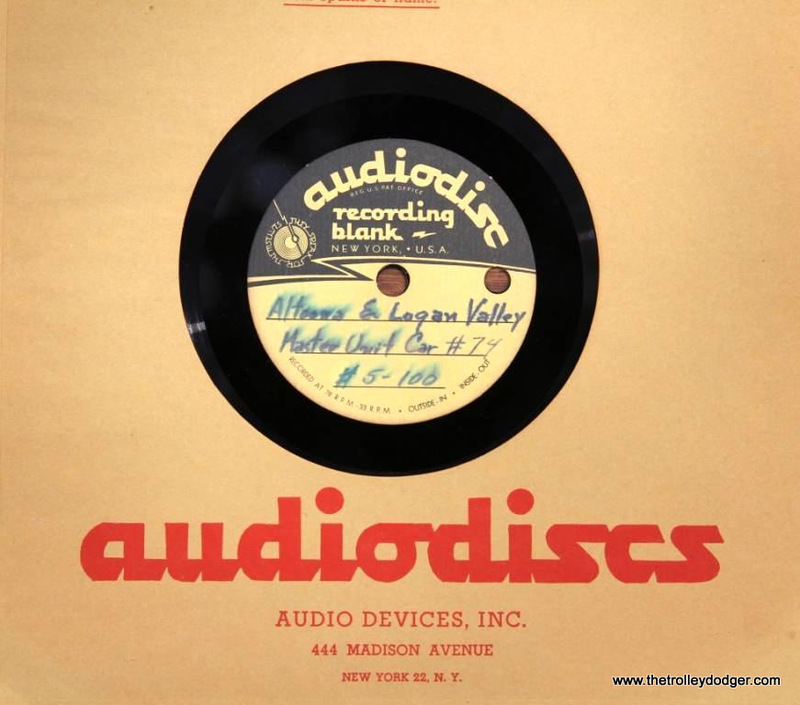 Since it quit in 1941, that predates the development of audio tape recorders in the early 1950s. 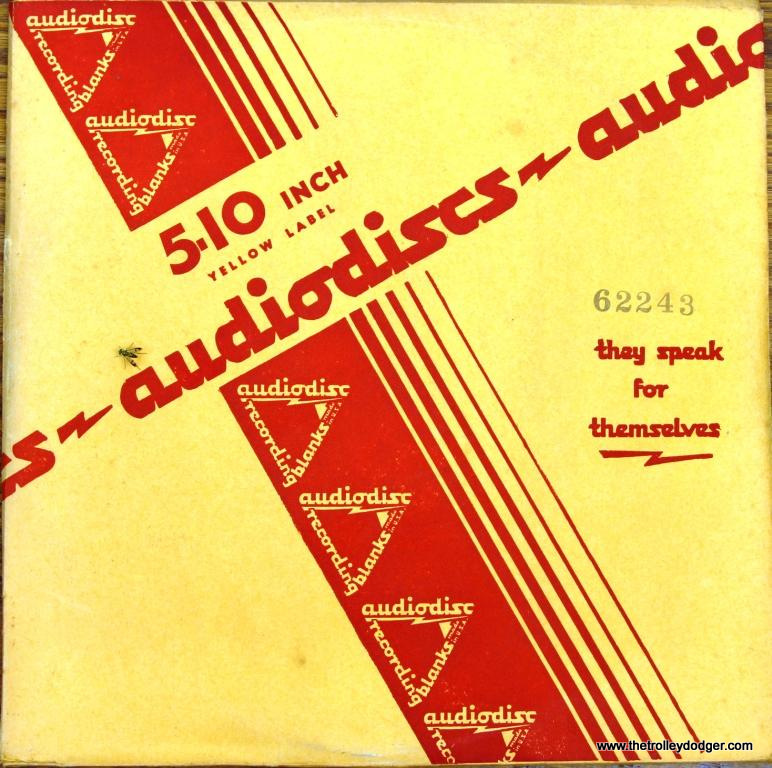 A few fans had wire recorders in the late 1940s (these were developed in Germany prior to the war). 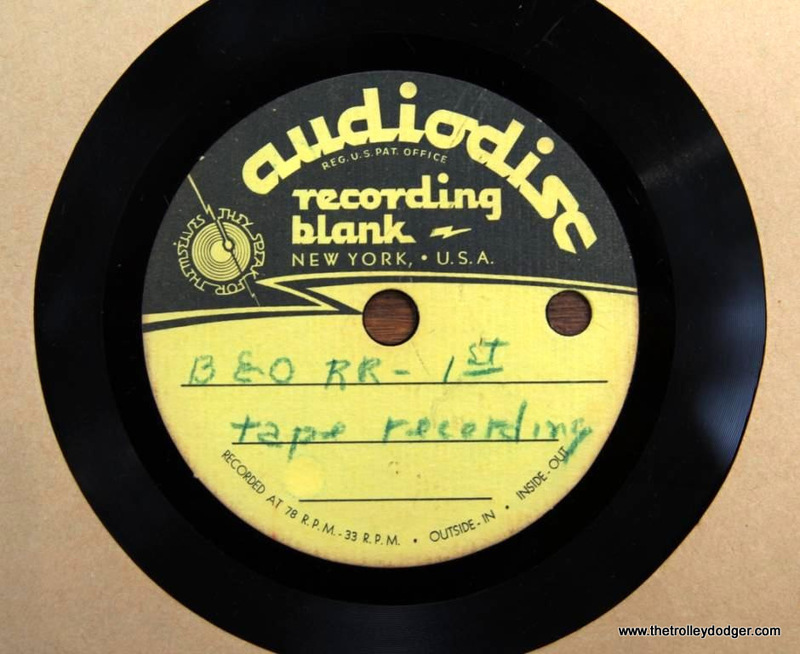 Prior to that time, the only way to make a “field recording” was with a portable disc cutter. 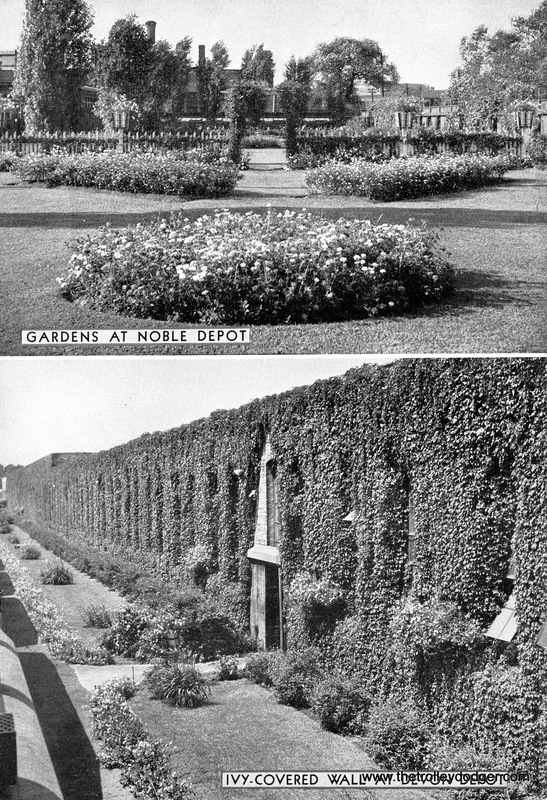 Those were available starting around 1929. Some months ago David received a very intriguing email. 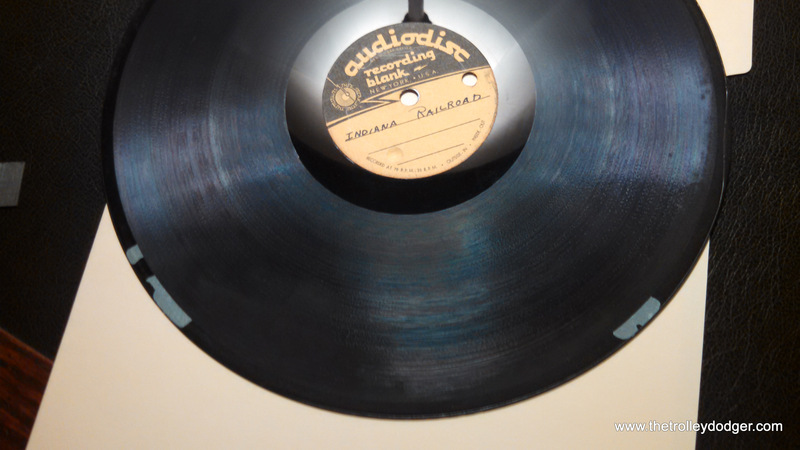 It came from an estate auctioneer who wrote that he was in possession of a large collection of items from the estate of William Steventon, founder of the Railroad Record Club. He had seen the Trolley Dodger CDs for sale online and figured David would be interested in the collection. 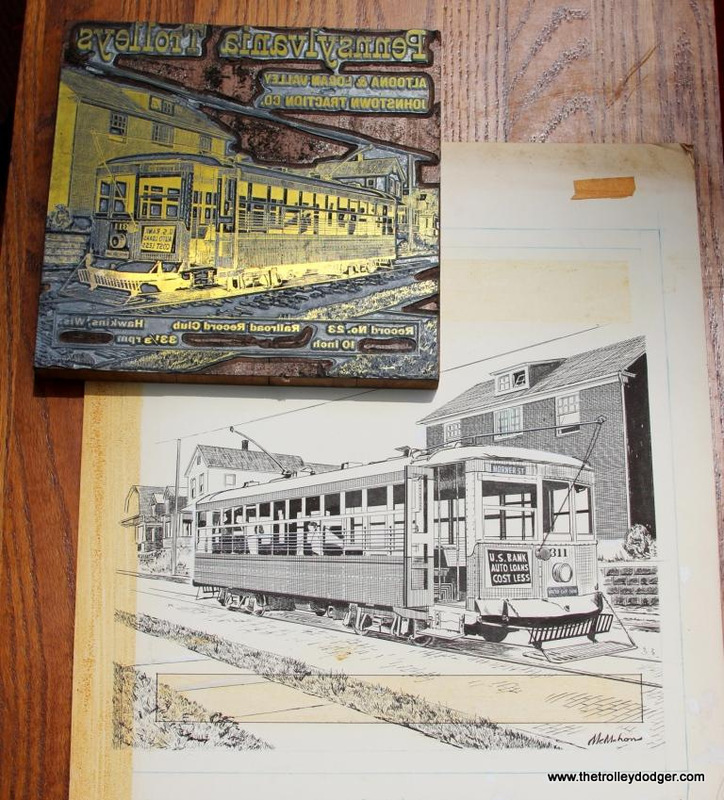 The auctioneer had these items in storage, where they had been for many years, and he now wanted to dispose of them. He asked David if he would be interested in buying these items or if he knew of anyone who might. Knowing my keen interest in all things related to the RRC, David forwarded the email to me. We were quite excited about the offer. What could this collection consist of? 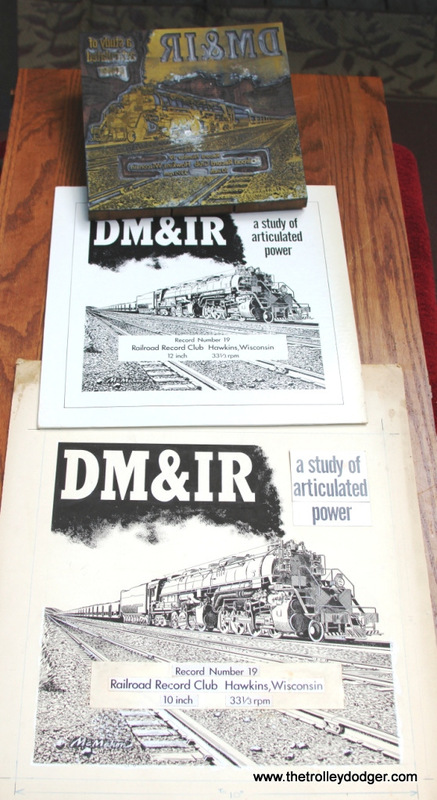 Had we hit the mother lode of RRC material? The possibilities were almost endless- photos, art work, even movies! 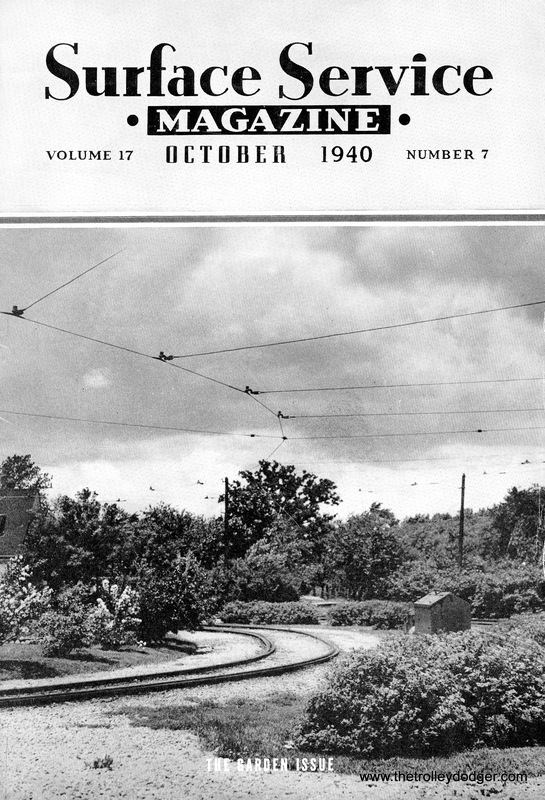 The most satisfying find for me would be, of course, coming across some unreleased Steventon railroad audio. 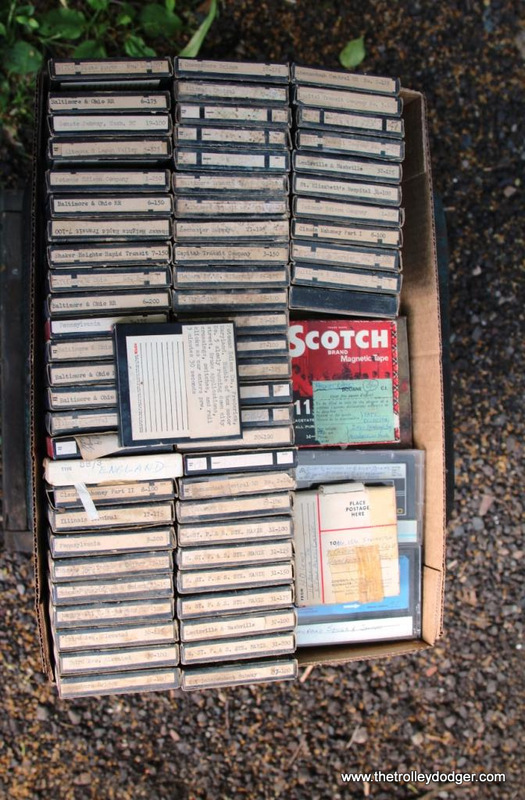 If there were some, would the 60 plus year old tapes be salvageable? Were they stored properly? As endless as the possibilities for great finds were, it was equally possible that disappointment could lie ahead. 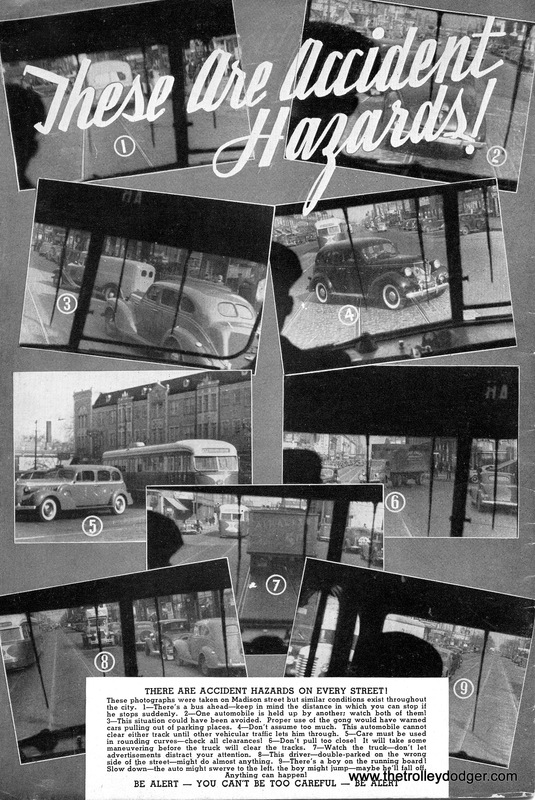 At the very least it seemed very likely that we would be able fill the holes in the Trolley Dodger CD reissuing catalog. We were still in need of records 22, 31 & 32 plus the elusive sampler records. Emails went back and forth between the three of us and eventually concrete plans were hammered out. 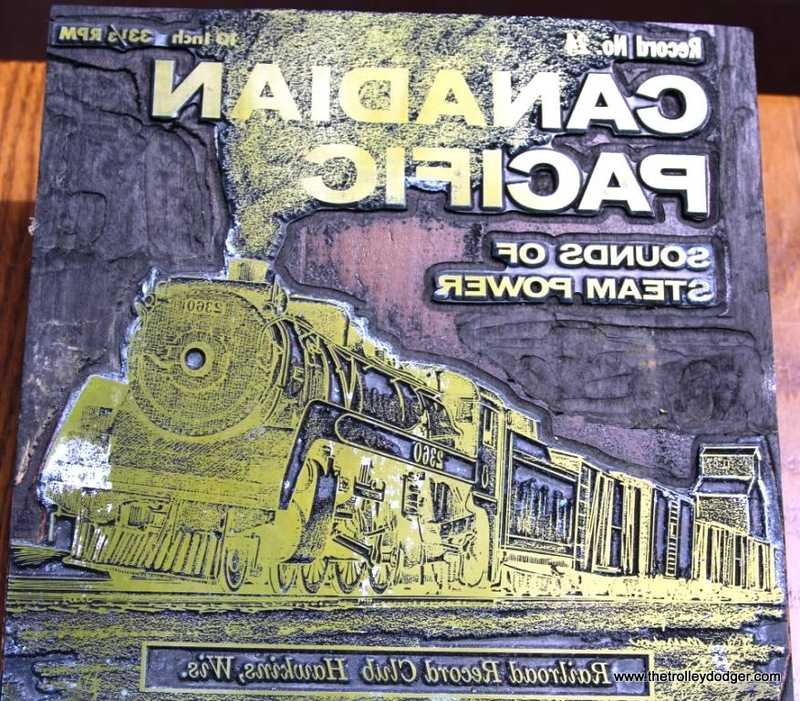 My friend and fellow railfan photographer Chris Hughes and I usually make several road trips a year in pursuit of short line railroads to photograph. 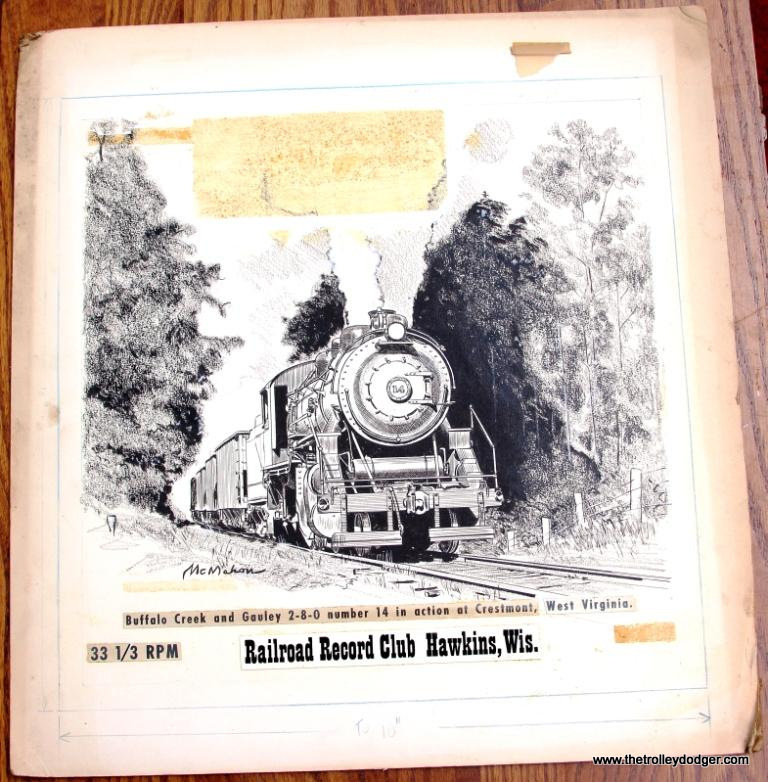 This year, and as a favor to me, it was decided to find some photographic subjects conveniently close to were the Railroad Record Club items were stored. I wasn’t going to let this opportunity slip by without at least seeing the collection. On July 20th Chris and I set off from New Jersey heading for the Midwest, some short line RRs, and the possibility of a RRC gold mine! Anticipation was running high as I approached the building that housed the collection. 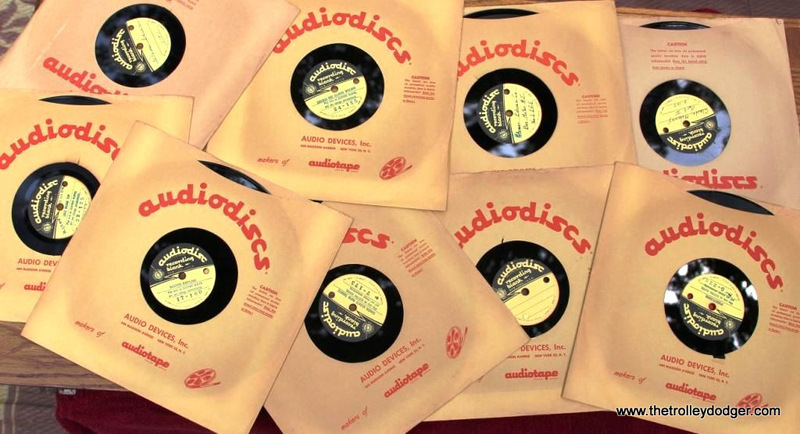 Some of the items were laid out on a table and there were large boxes containing many copies of the same record, all still sealed in plastic and all were the 12″ reissues editions. What immediately caught my attention was that each box had beside it the metal print block for the cover of the LP contained in the box. 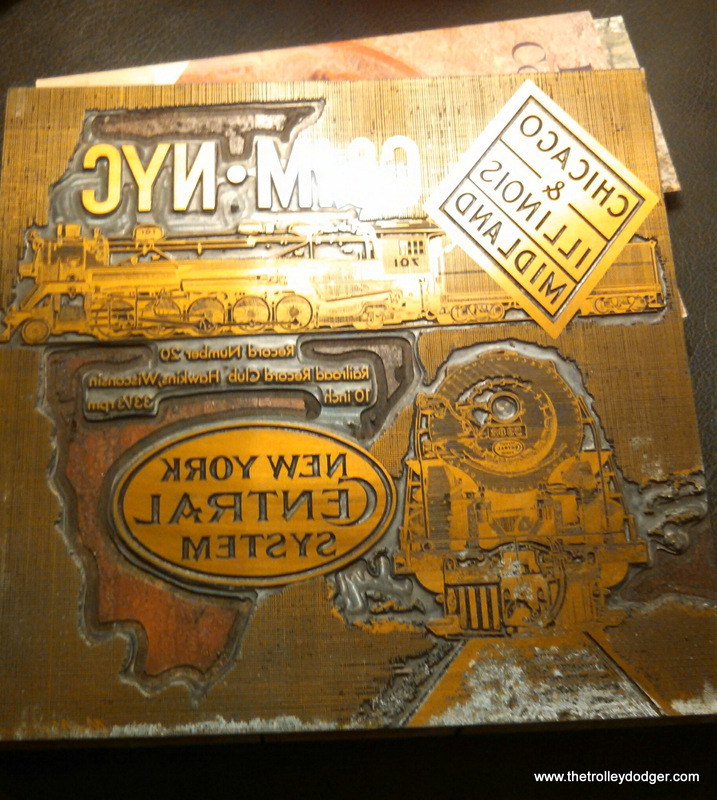 There were other print blocks on the table as well, not every one had a box of LPs to go with it. This was the real deal for sure. 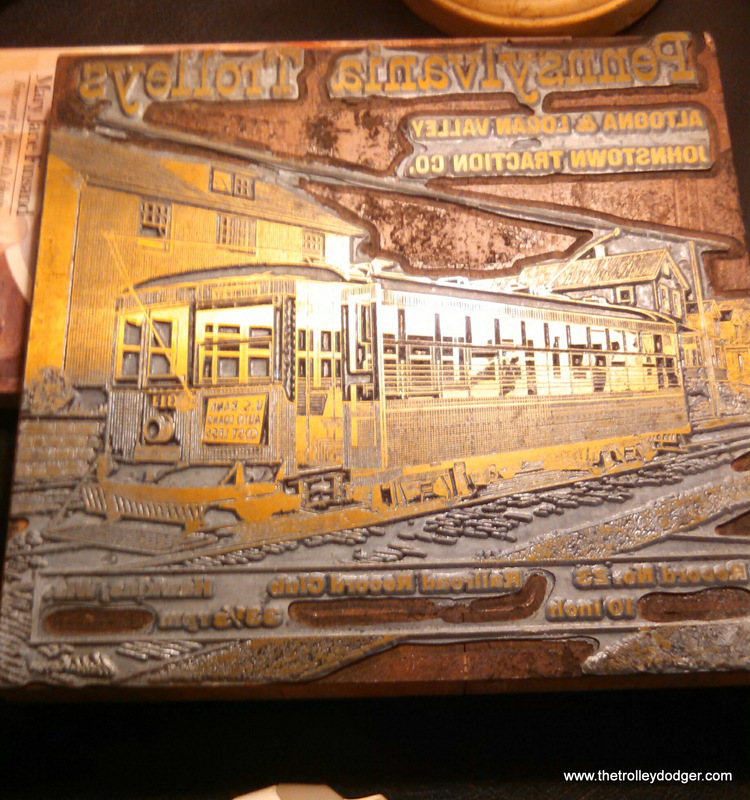 Where else would the original print blocks come from but the Steventon estate. I wanted the print blocks but was less interested in buying the LPs. I really didn’t want to get saddled with scores of records that I would have to find a place to store and later try to sell. A deal was struck and I got the print blocks but not the LPs. So far so good. 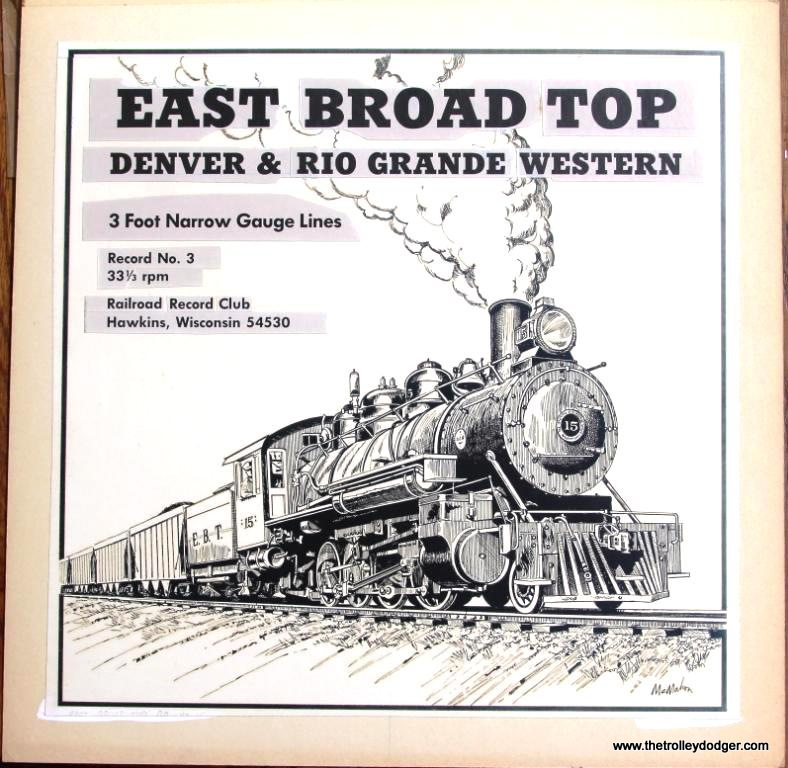 Next up was what appeared to be Mr. Steventon’s personal collection of RRC albums (for some unknown reason number 23 was missing). 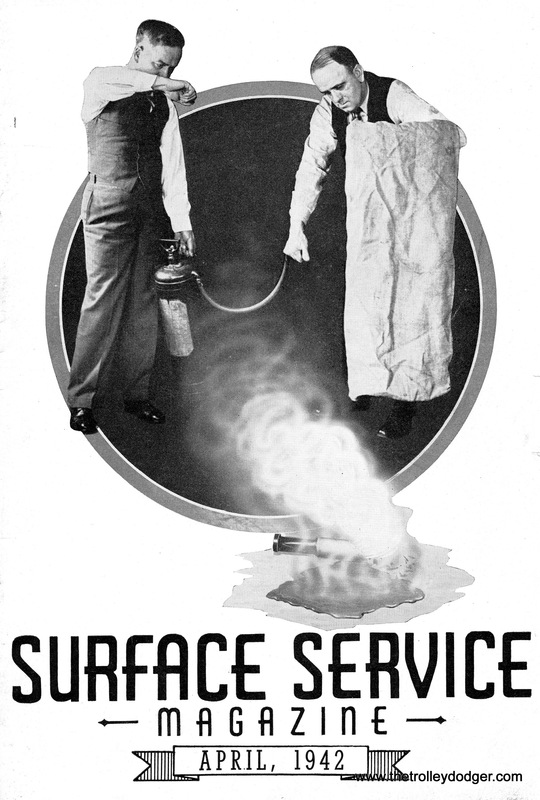 The records were in plain white jackets and did not have any of the liner notes or cover art with them. 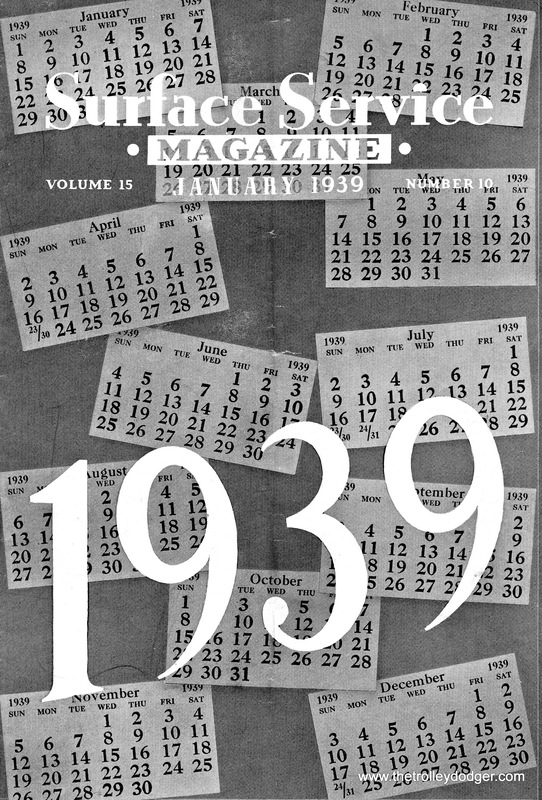 Just a hand written number in the upper right hand corner of the jacket, corresponding to the record contained therein. 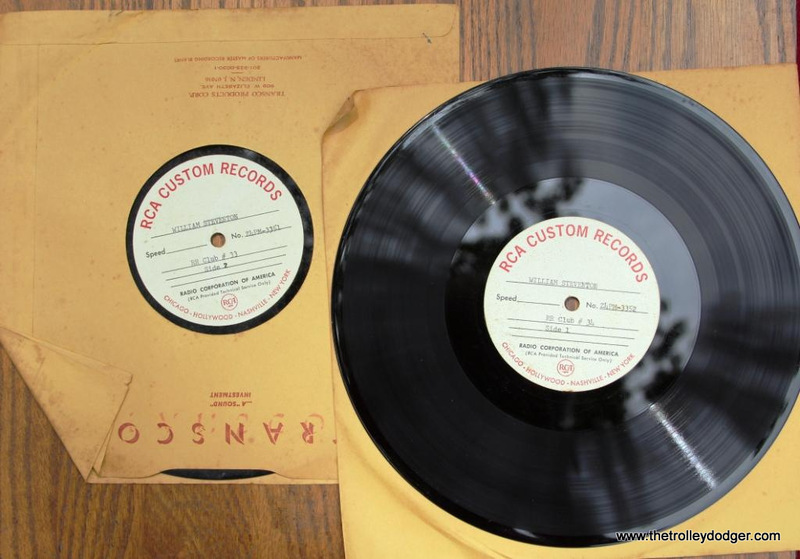 The records were a mix of 10 and 12 inch stock. 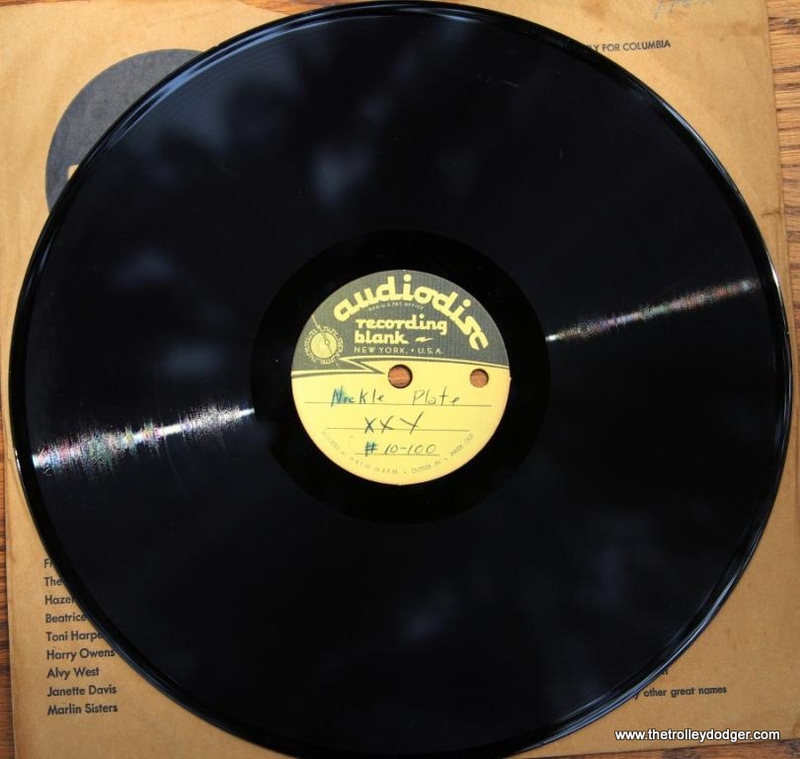 It could be that Steventon upgraded his own collection with the 12″ remasters as they were pressed and that the 10″ records in his collection never got the 12″ treatment. If true, then we can finally know exactly which of the records were reissued and those that were not. It seems likely, but we will need to look a little deeper into this. 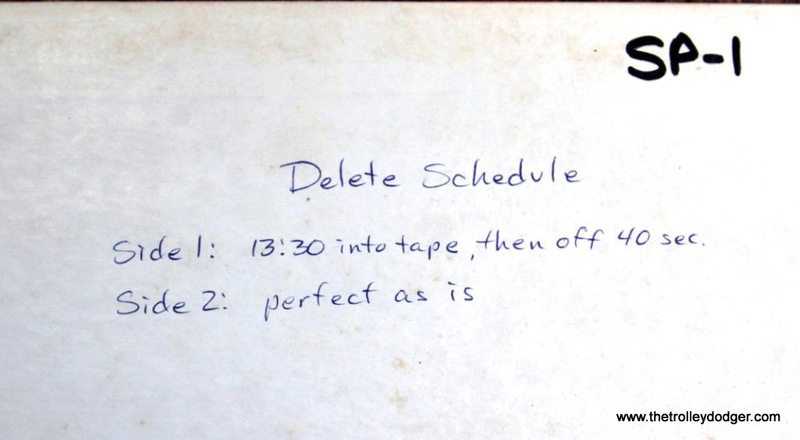 Interestingly a few of the plain white jackets have a hand written “delete schedule” on them. 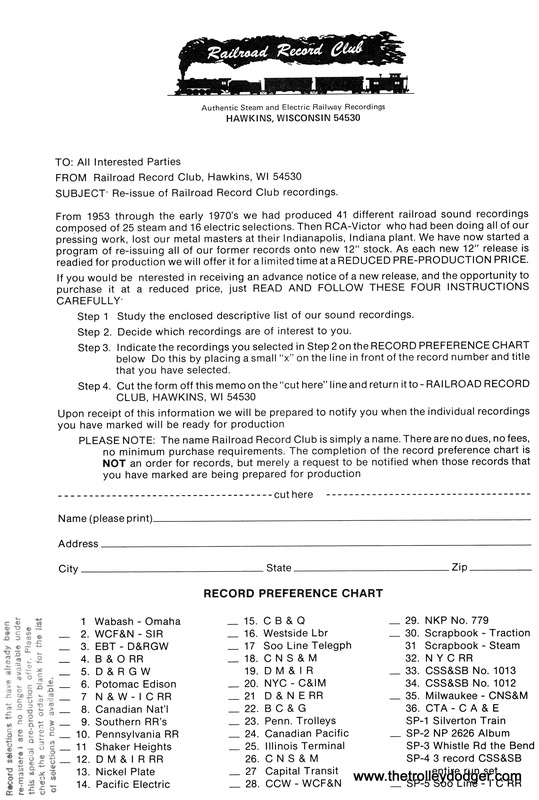 This I’m sure is some whittling down of the tracks to fit in the allotted time of the record. Photos of two of them follow. Also found was a sampler record. 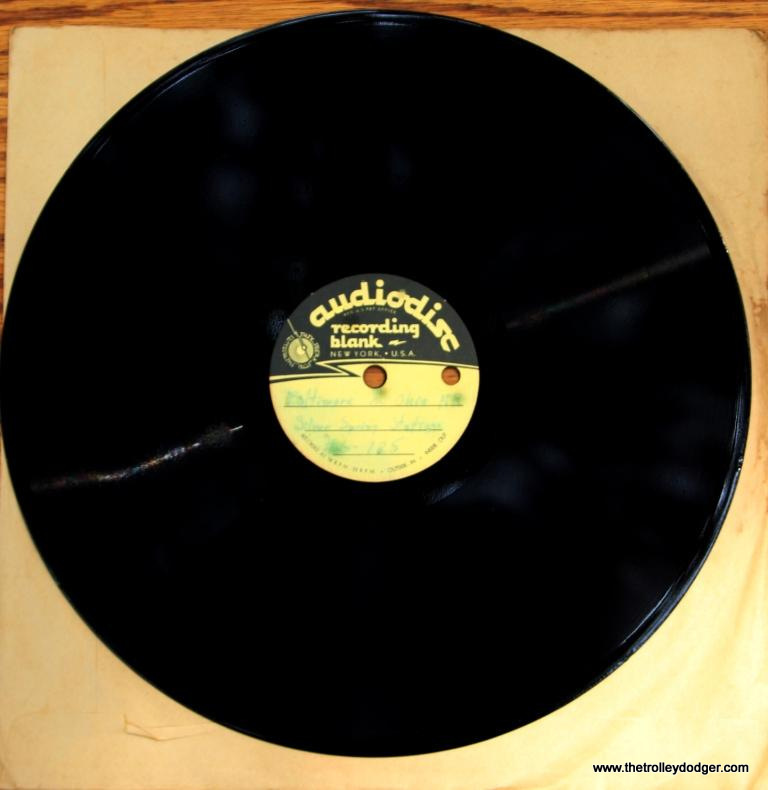 I always thought there were 6 of these records but it turns out that each year only has one side of a disc. Therefore it’s not 6 records, but only 3. 1 down and 2 to go. Along with these LPs came a large stack of test pressings. 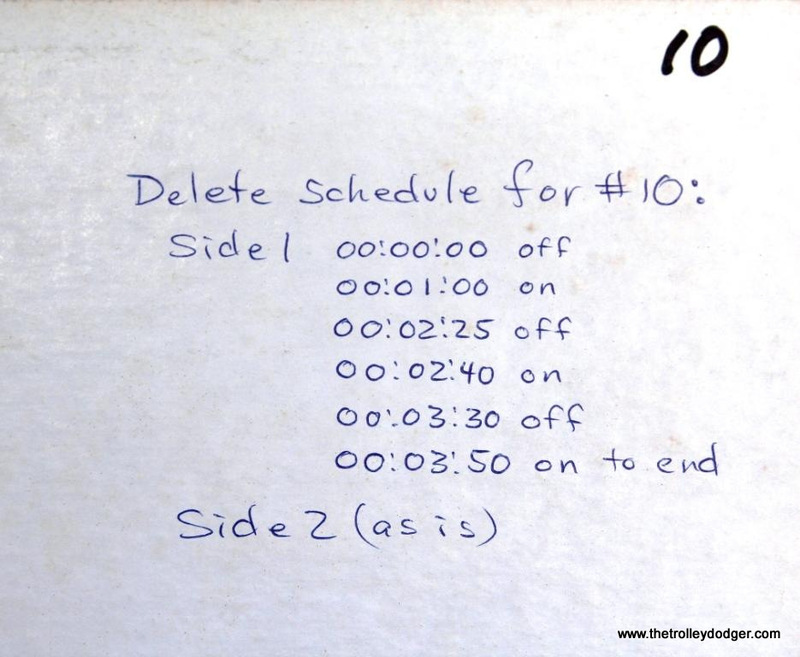 I wasn’t sure of just what may be on them, perhaps the deleted audio written of in those delete schedules. They went into the back of the SUV with Steventon’s personal RRC records. Things were getting very interesting! 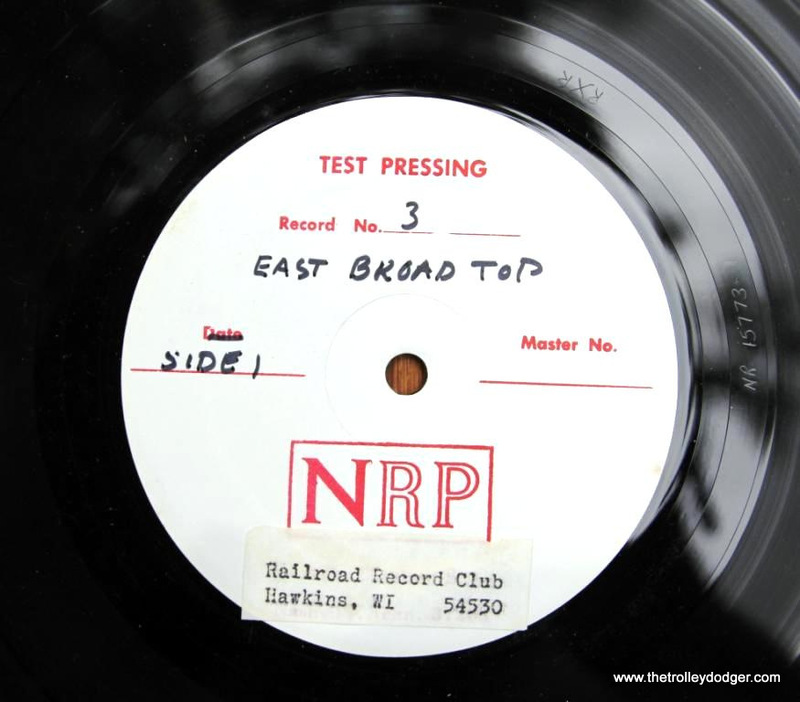 The stack of test pressings consisted of 44 12″ records from the Nashville Record Productions and 4 10″ pressings from RCA Custom Records. Also, I saved perhaps 50 10″ empty record jackets that were heading to a dumpster. 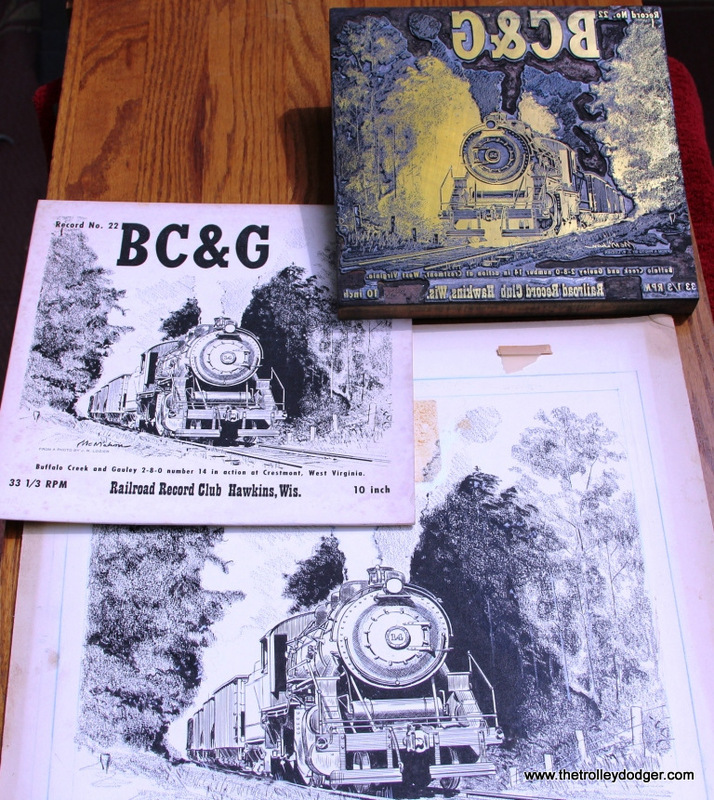 I’m glad I did because I was able to find the jackets for 22 BC&G, 31 Sound Scrapbook-Steam & 32 NYC. I got those records from Steventon’s personal collection, but they did not, as I said, have any liner notes or jackets with them. 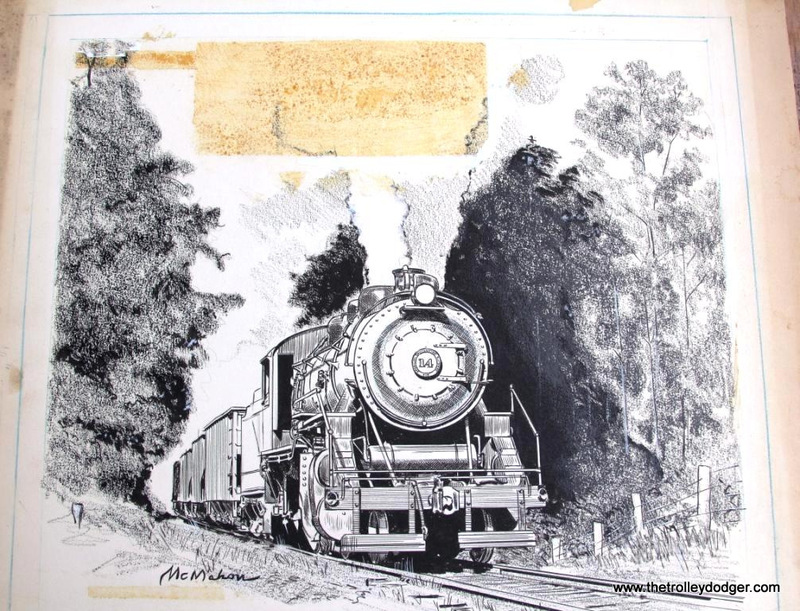 So no more suspense- yes unreleased Steventon railroad audio was indeed found! 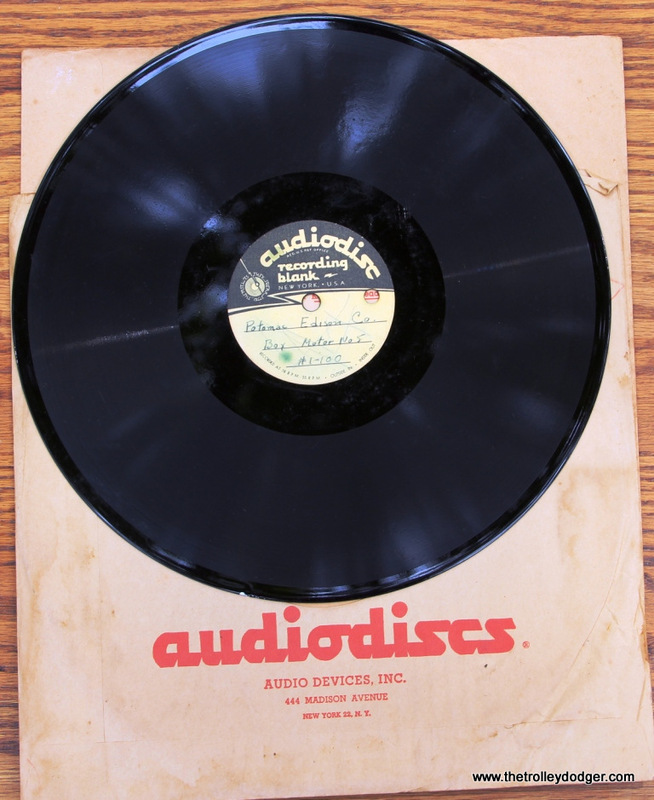 It came in the form of “Audiodisc” record blanks that Steventon cut at home. For convenience’s sake, or perhaps to keep his tapes safe, he transferred field recordings on to these “record at home” discs. 25 of these discs were offered to me and I snatched them right up. Later at home, I discovered that 21 have railroad sounds on them. 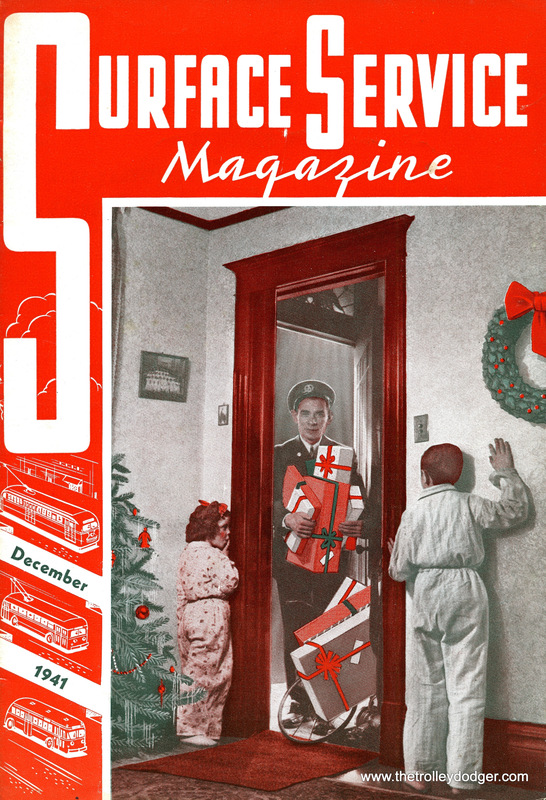 The rest were radio shows and a relative who was apparently proficient at playing the piano. 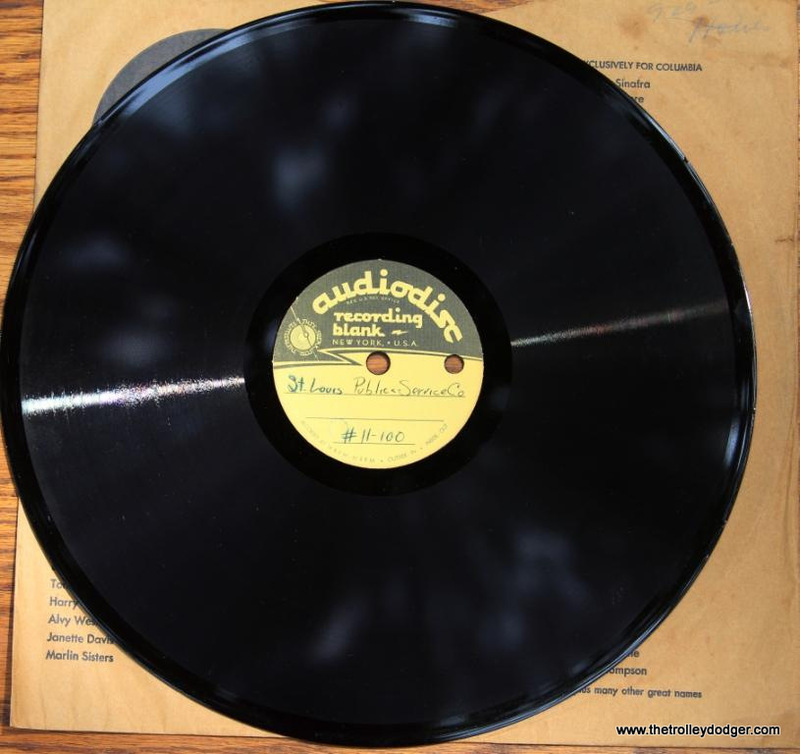 One of the best finds is a record marked “B&O-1st Recording” It seems I have found a record of William Steventon’s first recordings! 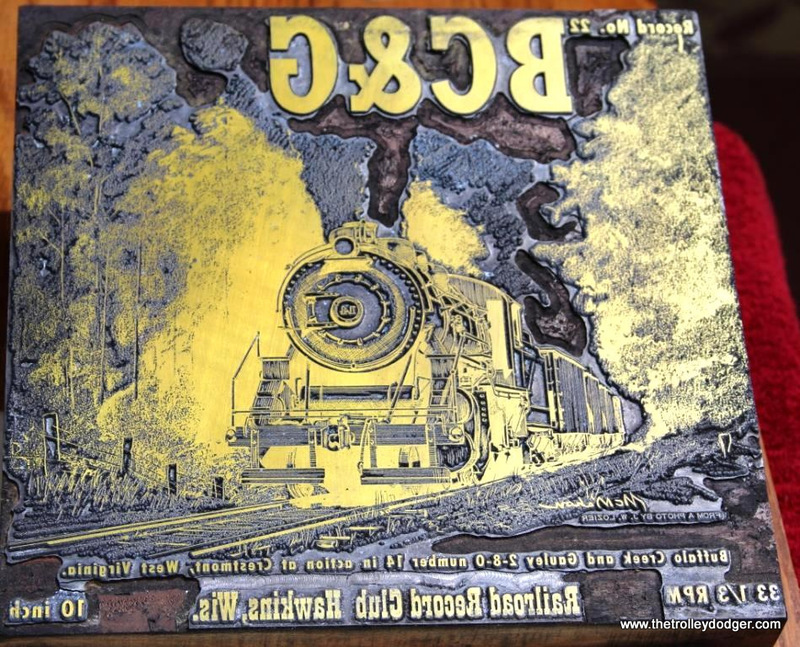 From the article he wrote for TRACTION & MODELS we know he accidentally erased his very first recording of a B&O steamer while trying to play it back. So perhaps this is actually his second attempt. 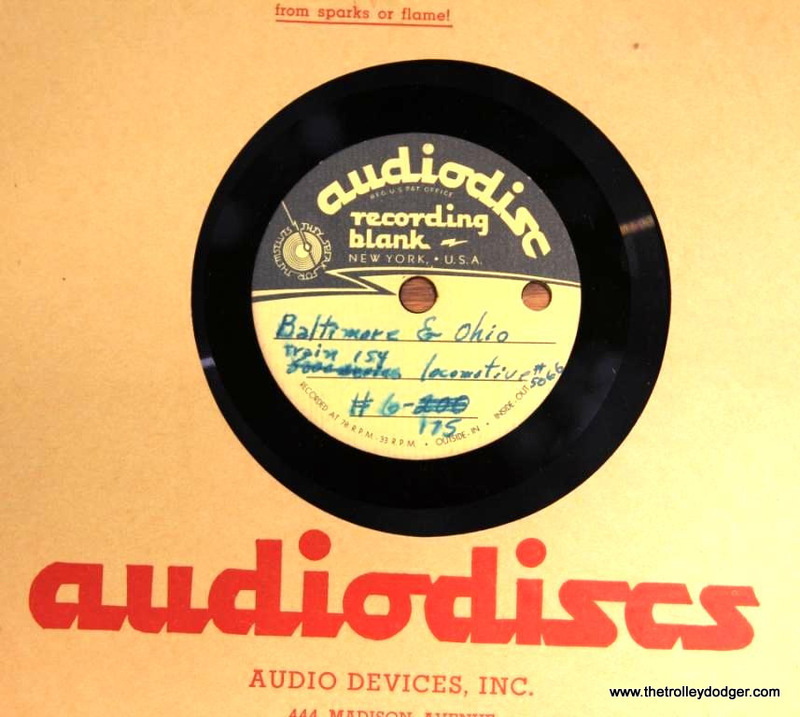 The record contains B&O steam & Diesel sounds recorded at the station in Riverdale, MD on March 31, 1953. 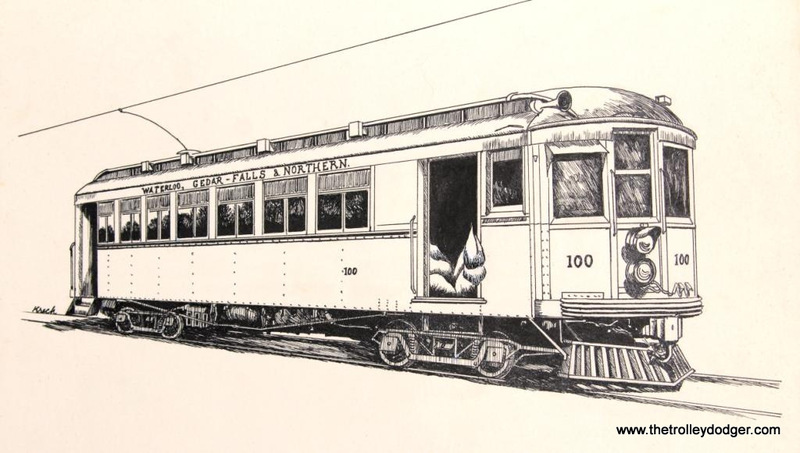 Trains include number 523 “Marylander” and number 17 “Cleveland Night Express” among others. 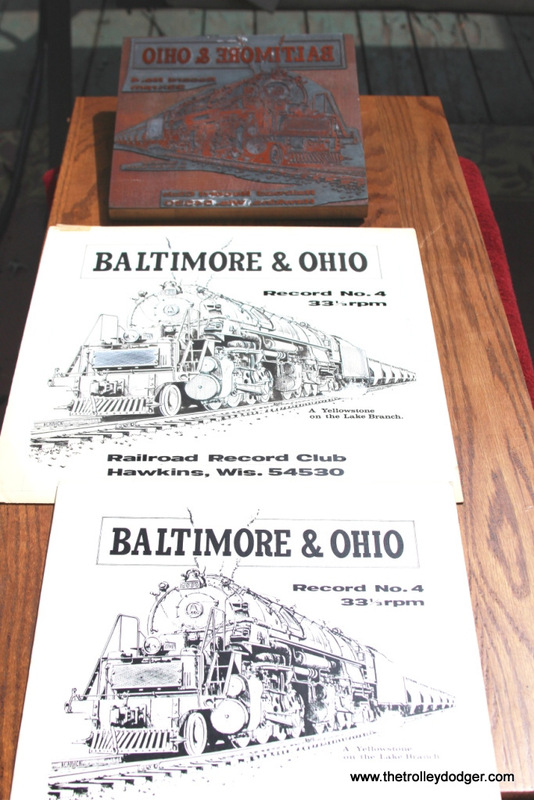 He would return to the B&O many times, with recordings being made at both Riverdale and Silver Springs, MD. 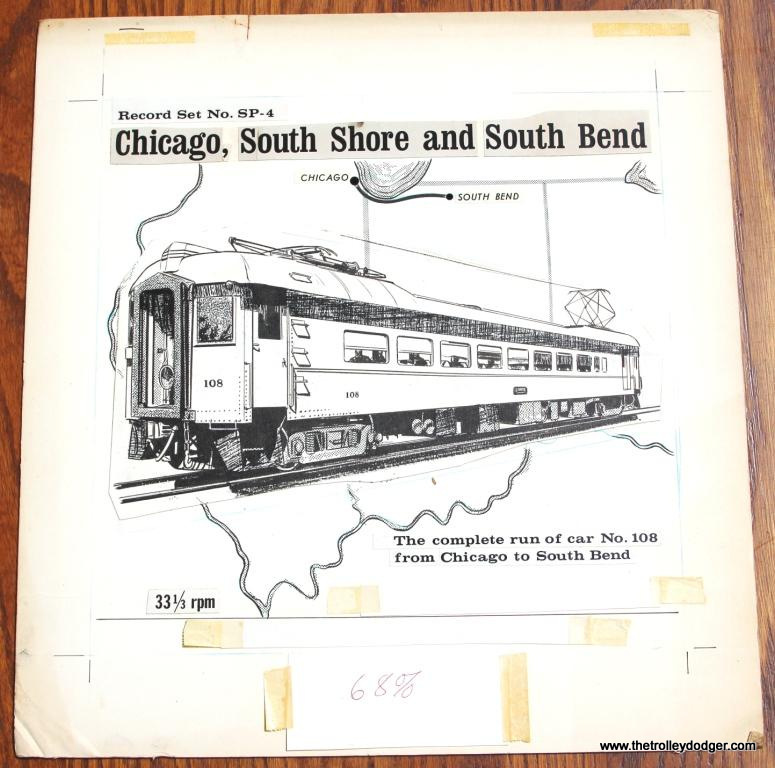 I have records of B&O trains recorded in July, August, and September 1953. 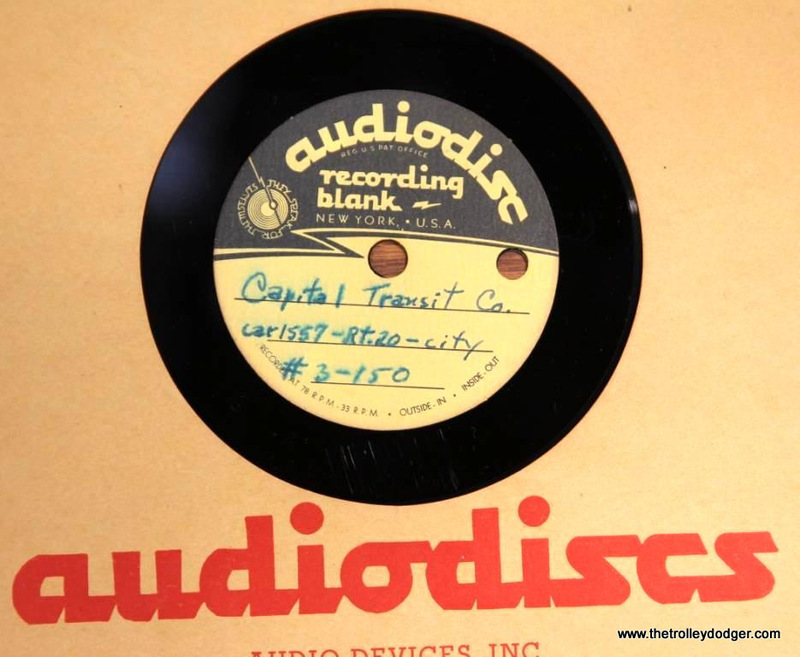 Some of these recordings include the station announcements for trains number 9 “Chicago Express” and Train 5 “Capitol Limited” . There is one great sequence (too short) of an on-train recording behind B&O 5066 powering local train #154. Also there is a very good recording of a 5300 series loco on a heavy drag freight. Even early on he sure knew how to capture the sound of steam. 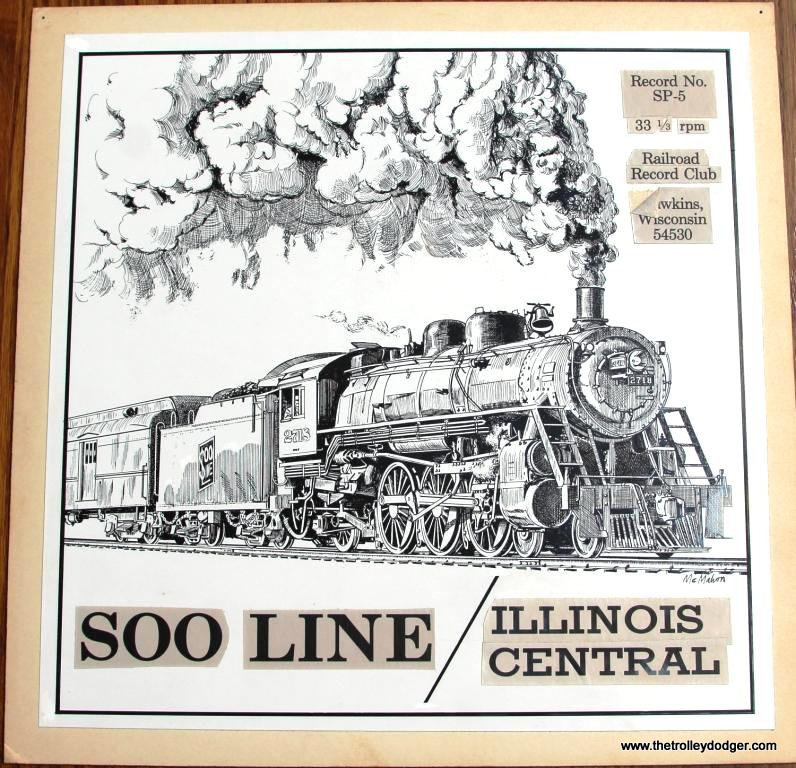 There are recordings of steam on the Shenandoah Central (loco # 12) IC # 3619 at Christopher, IL, PRR at Mill Creek, PA, C&IM, and on the EBT. 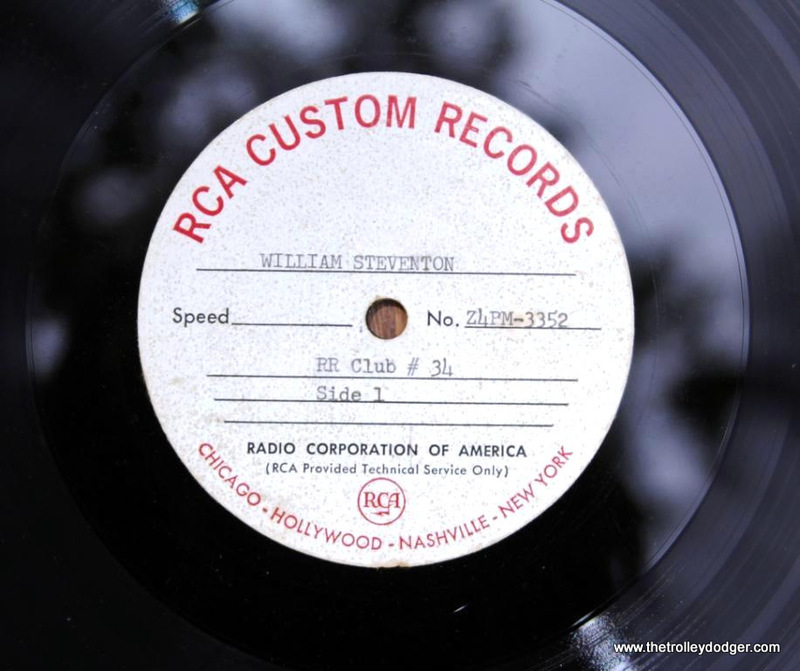 Some of this material may have been included on the released albums, but here William Steventon himself provides commentary and the sounds may be edited differently. Steventon gives information about almost every cut in his distinctive, Walter Winchell-like voice. 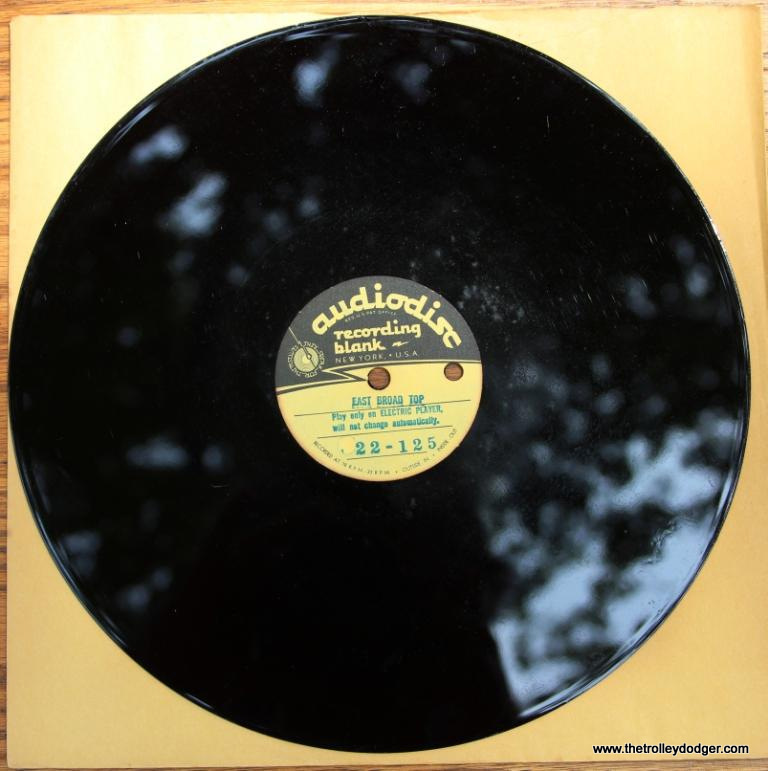 Other interesting sounds are those of PRR GG-1s recorded on August 22, 1954. 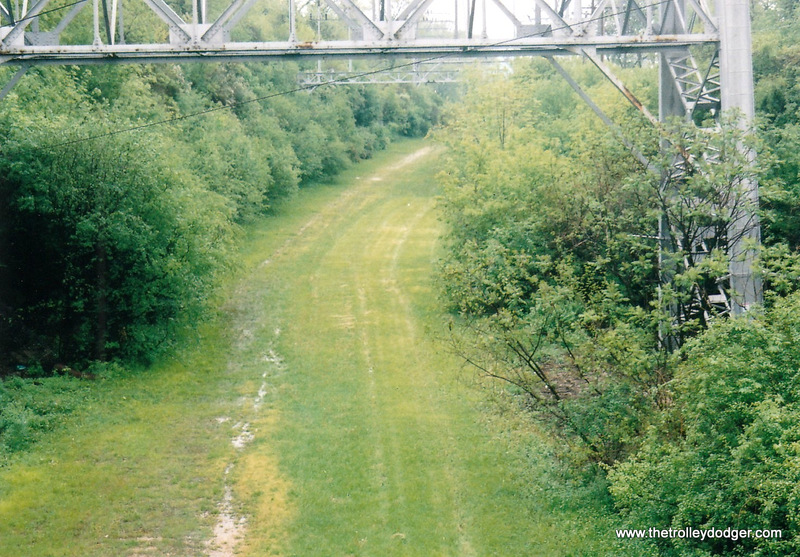 They were recorded at, as Steventon puts it, a “country crossing”. Plenty of that toneless yet somehow appealing GG-1 horn blowing is included. 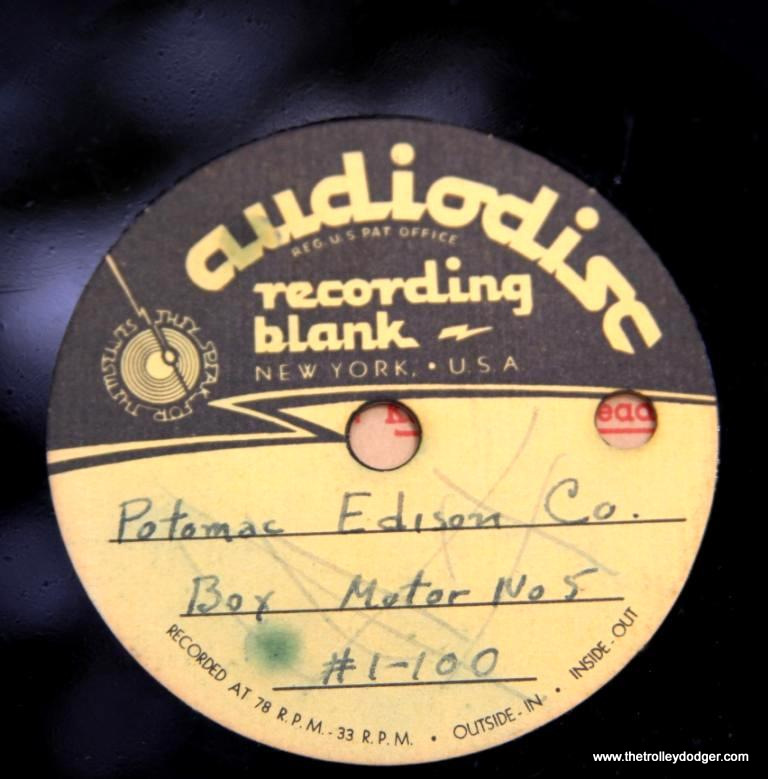 Potomac Edison box motor # 5 has several sides of these records devoted to it. Without checking, I’d say there is more of the sounds of the cab ride on these discs than what eventually made it on to Record #6. 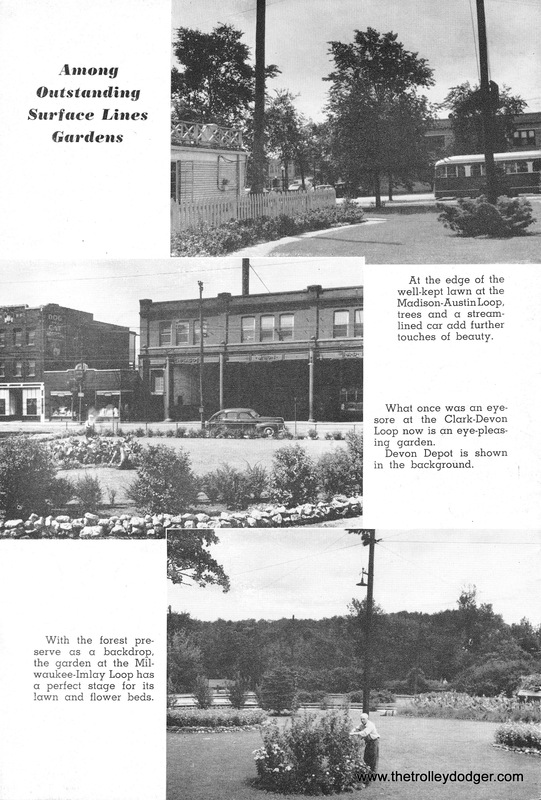 There is some Shaker Heights RT as well. Plenty of Johnstown Traction and Altoona & Logan Valley too. This may or may not have been released. There is definitely some unreleased traction sound here. 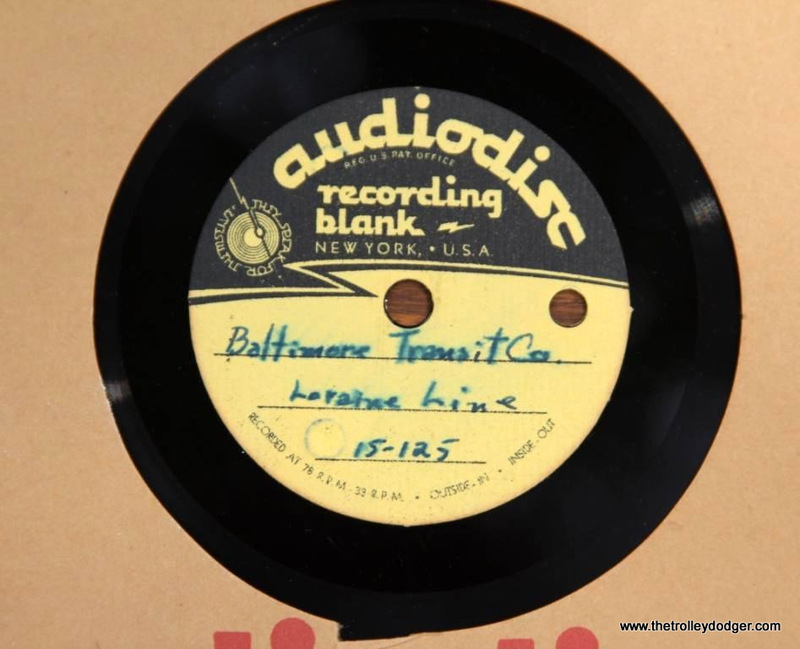 One full record contains the sounds of the Baltimore Transit company. 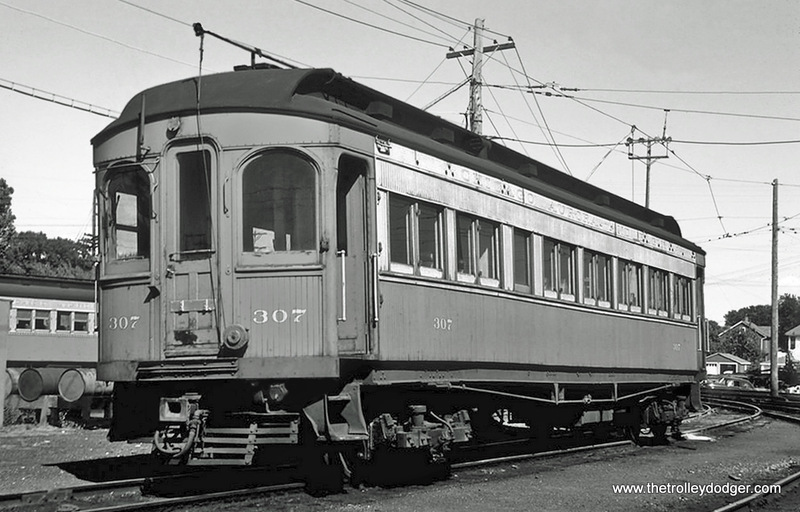 One side is a ride on car # 5727 on the Lorraine Line and the other side is car # 5706 on the Ellicott City Line. 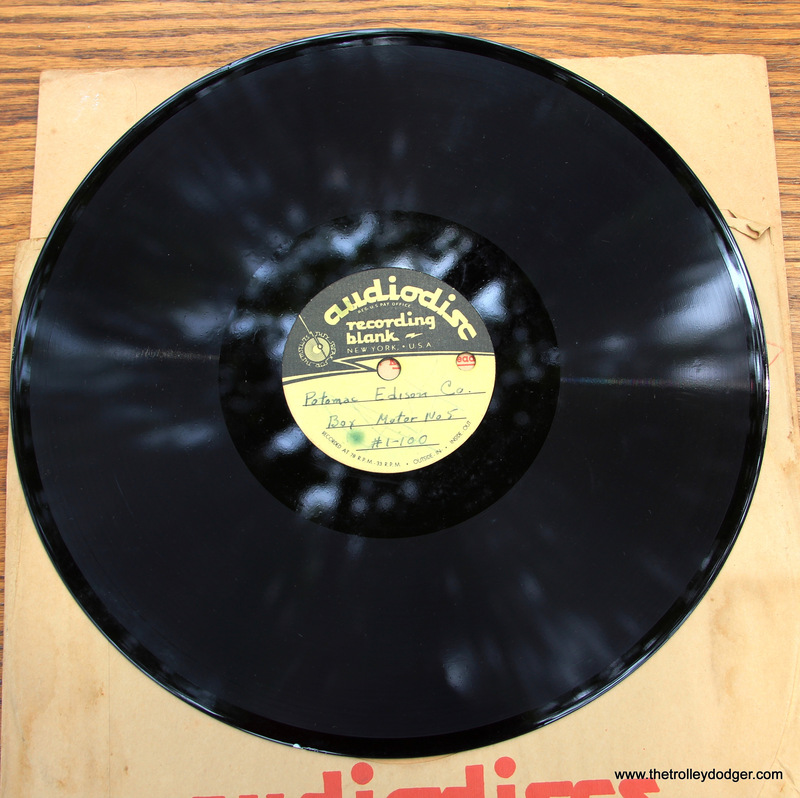 Both recorded on January 16, 1954 This recording is in wonderful shape too. 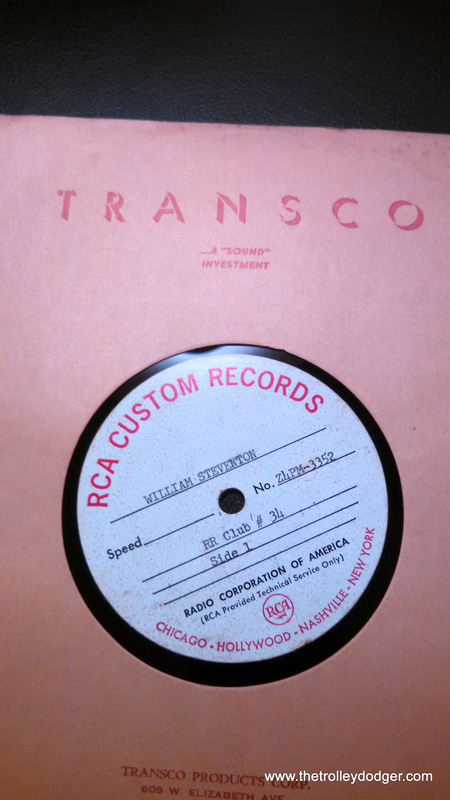 More fine unreleased traction sounds include a nice recording of the St. Louis Public Service. 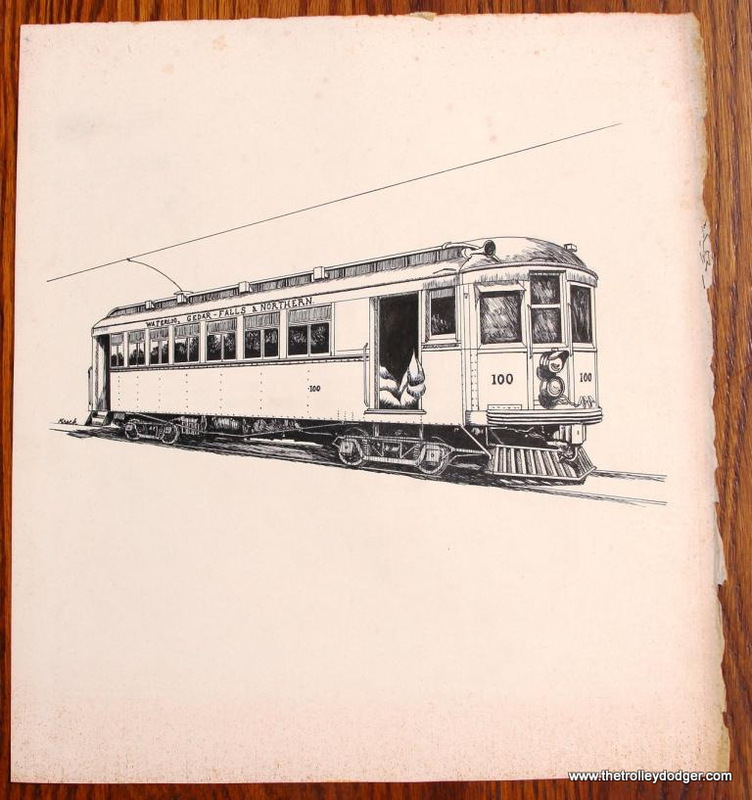 Recorded in December of 1953 it includes both on board and trackside recordings of PCC cars on the University Line. 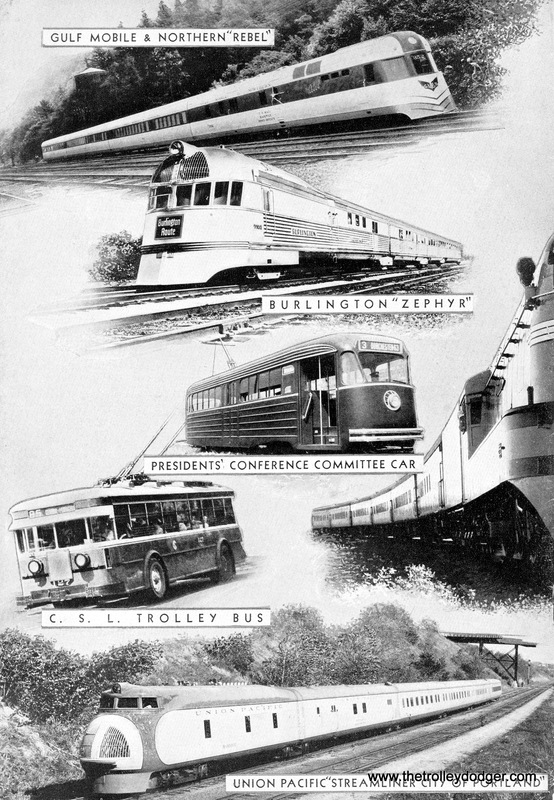 There is also some Washington DC Capital Transit stuff I don’t think made it to Record 27. There are some unidentified traction sounds on an unmarked disc. 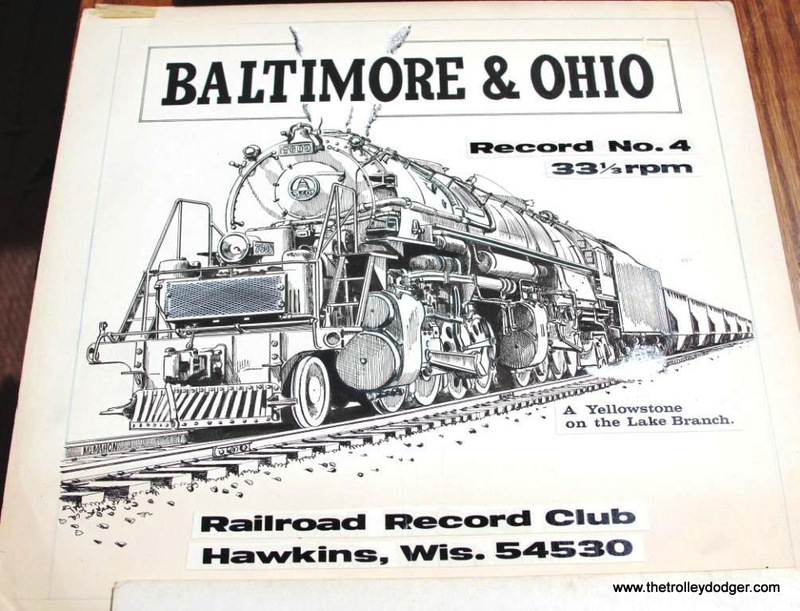 The record starts with William Steventon telling a story about a blanket someone gave his father that had pictures of locomotives on it (his father was an engineer on the NYC). The story abruptly ends without concluding and the sounds of motor hum, gears, and door buzzers start. It sounds to me as if the recording was made at a subway station. We know Steventon made recordings in the IRT subway in New York and this may very well be it. 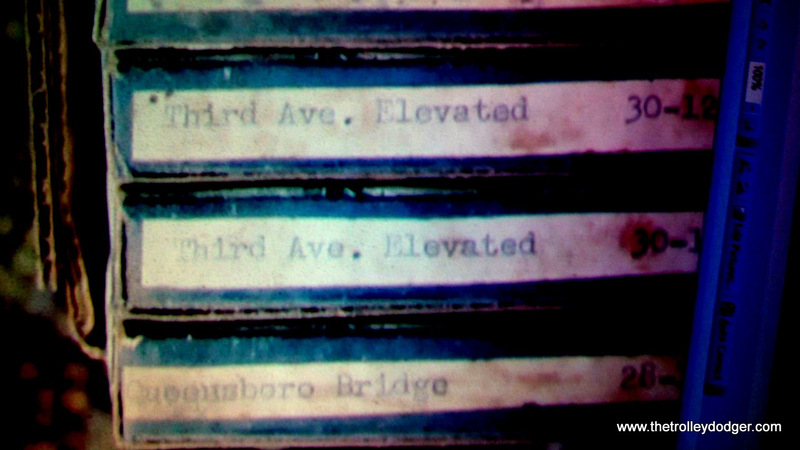 The other side has more unidentified traction sound that may been the Queensboro Bridge recordings that were mentioned in the RRC newsletter David posted in this blog some time ago. Maybe someone knows for sure what all this sound really is. 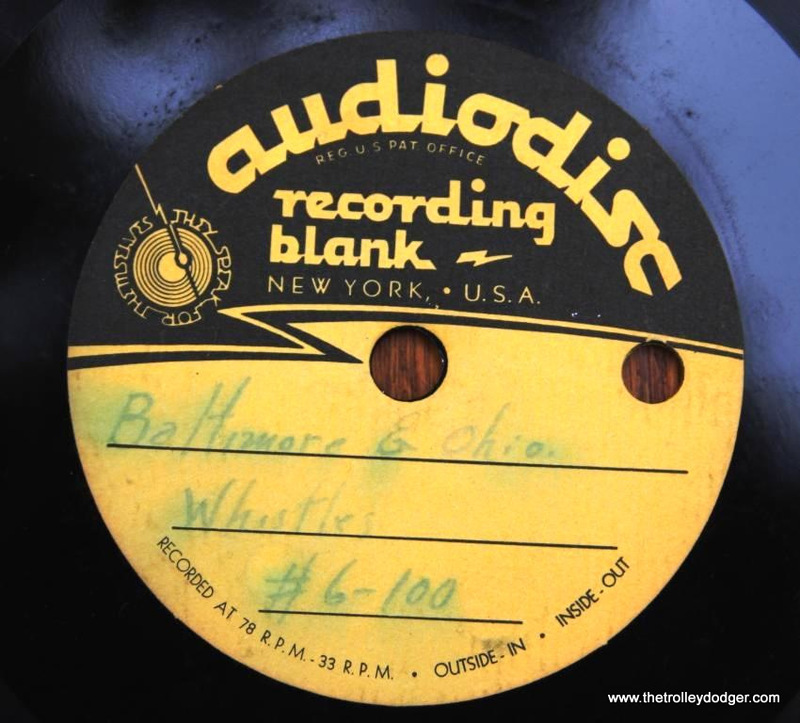 One other record worth noting is titled “Claude Mahoney.” Playing the record reveled that he was a radio commentator in the Washington DC area. 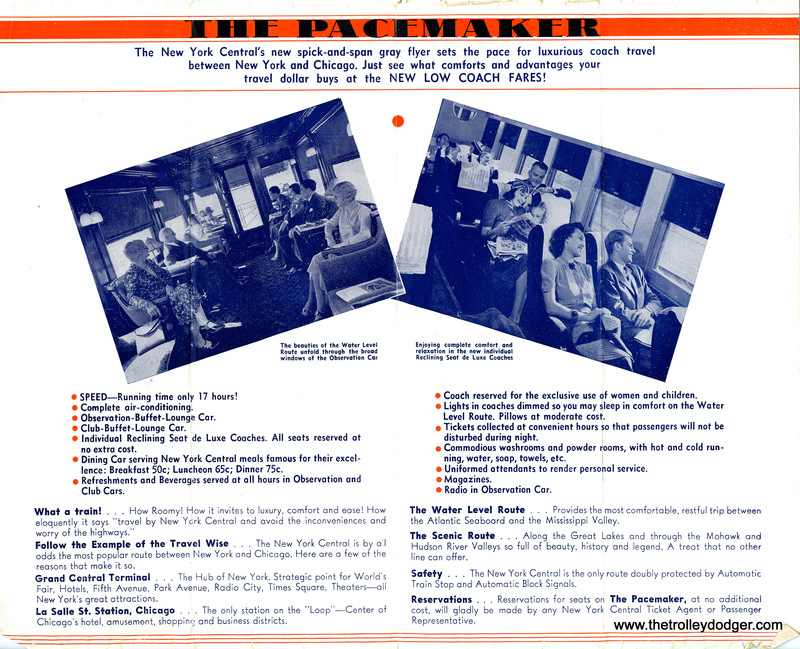 This is both parts of a two-part show about riding an NRHS fantrip from Washington DC to Harrisburg, PA by way of Hagerstown on October 4, 1953. 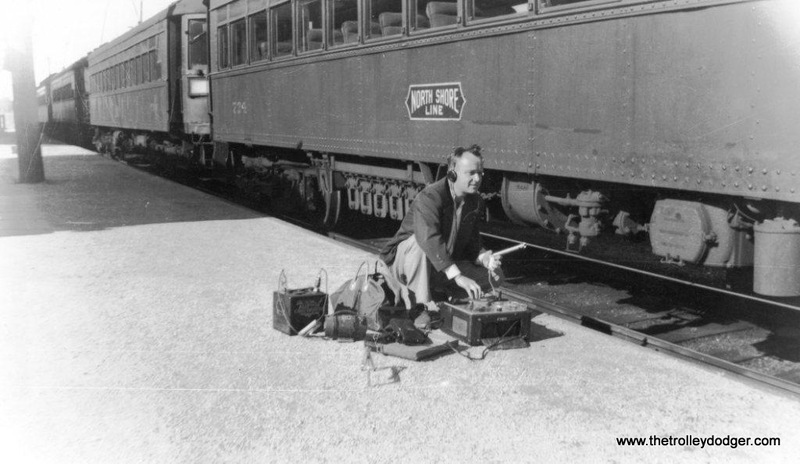 No train sounds are included but it is interesting in itself, especially if you enjoy old time radio broadcasts. 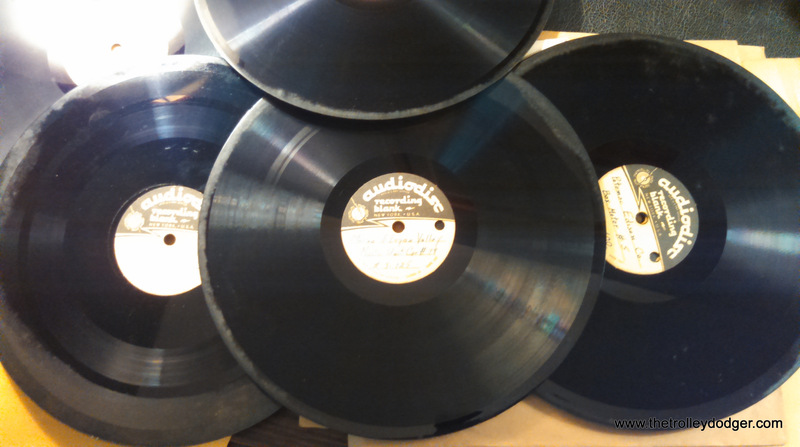 All of these records will soon be sent off to David for him to transfer to digital. Hopefully he can clean up and restore some of the sounds that right now, are degraded with surface noise and various clicks, pops, and hisses. 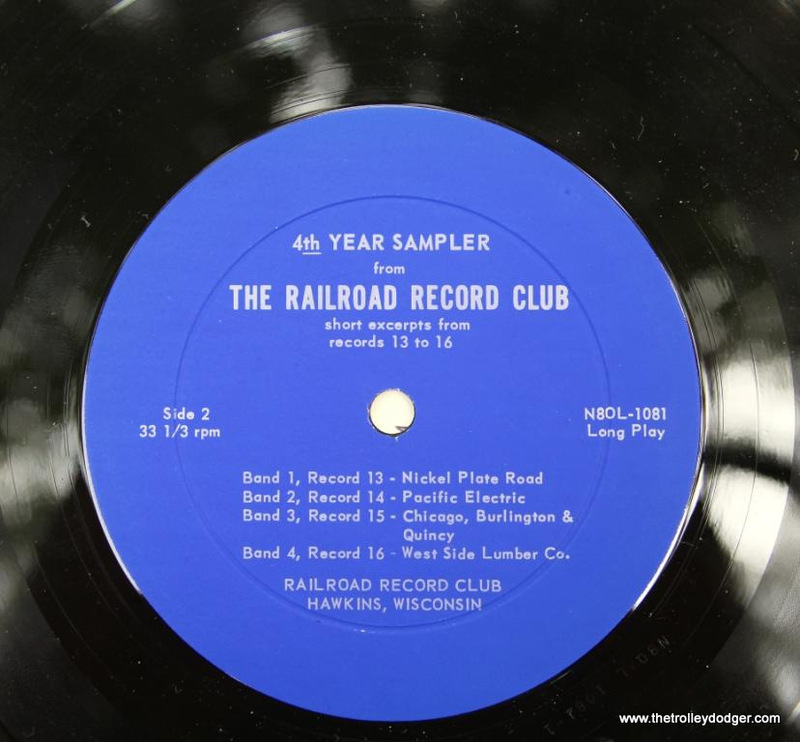 I’m sure there is enough good sound to fill out a CD and it sure will make a great Railroad Record Club “bonus tracks” CD. 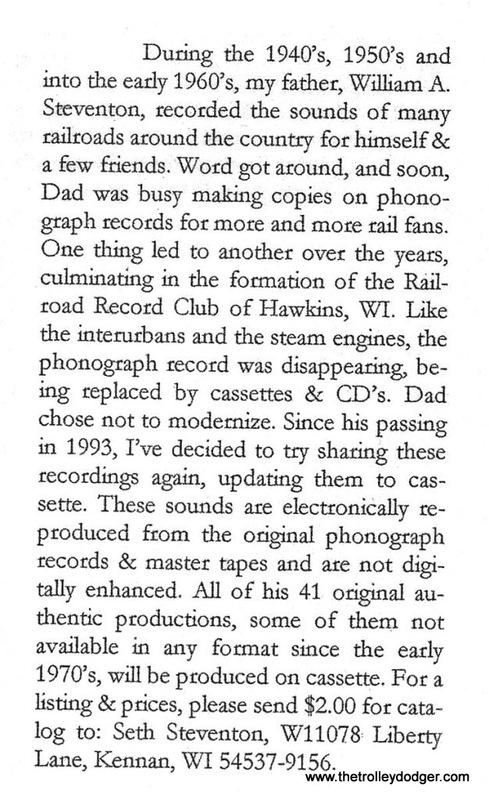 Another interesting aspect of the Railroad Record Club story is that some years after William Steventon’s death in 1993, his son Seth made an effort to reissue the entire RRC catalog on cassette tapes. 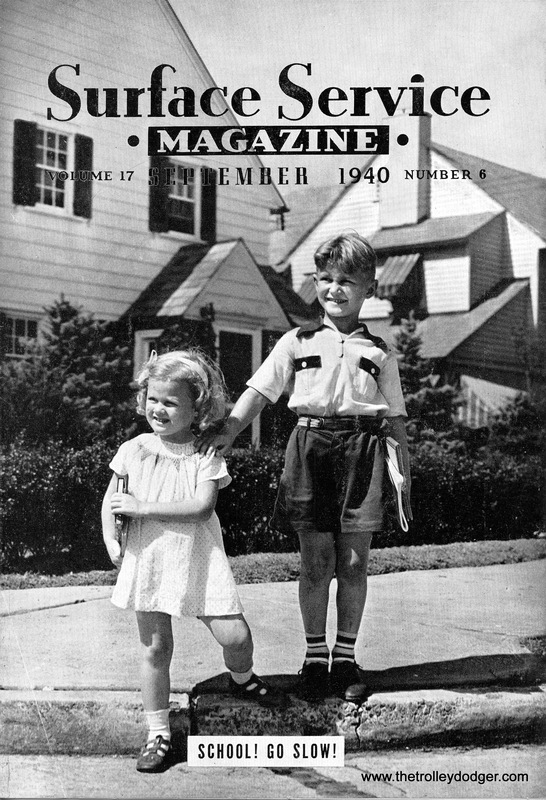 David and I made inquiries about this to several people without much success. 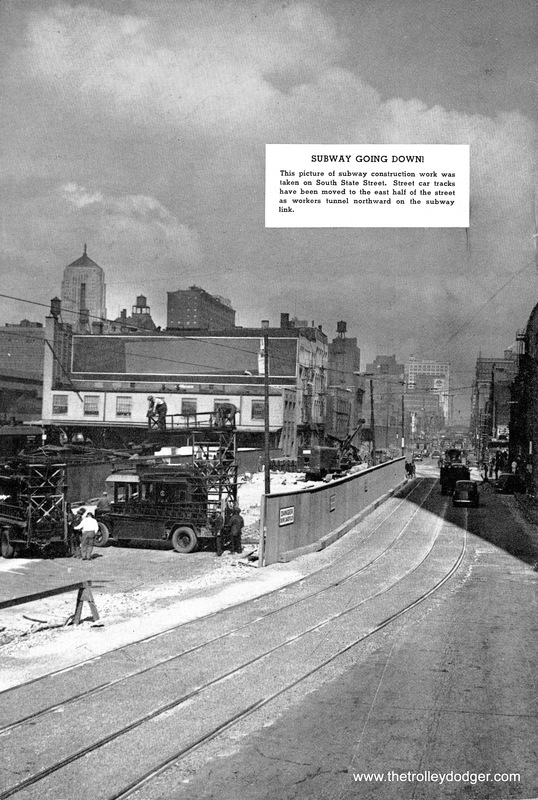 It’s likely the project was abandoned before much headway was achieved. 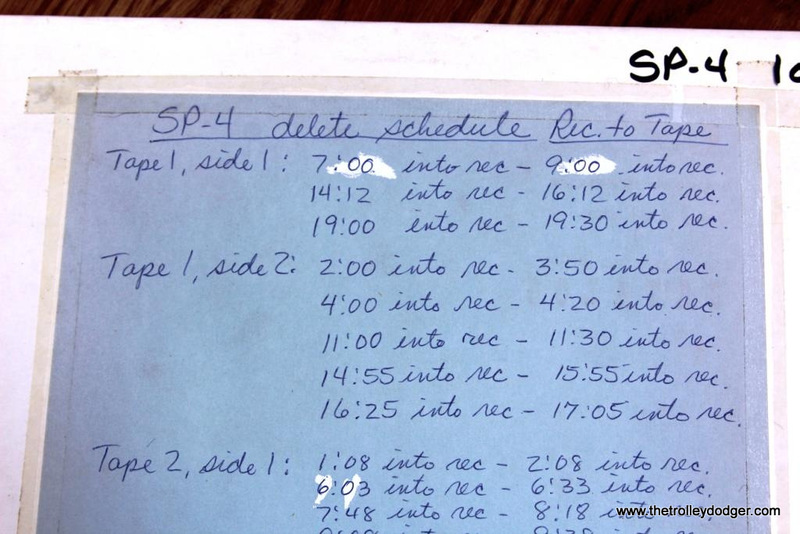 Evidence of Seth’s attempts were included in the estate. All of the records were converted to cassette and cover art and liner notes were put on cards for every record. 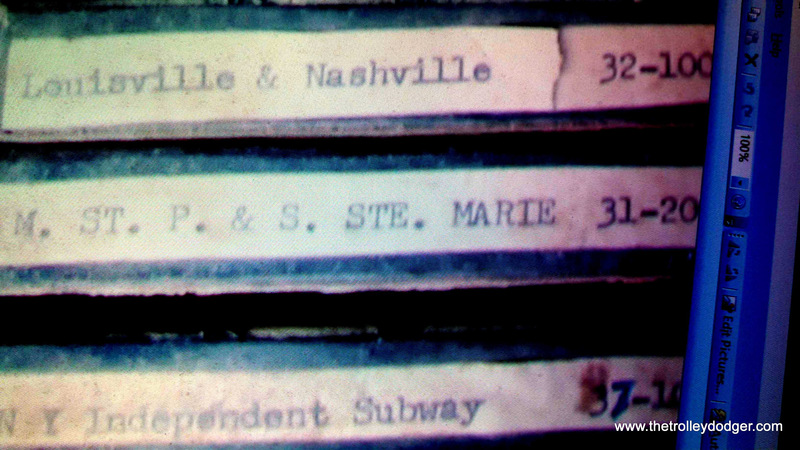 Four completed tapes were in the collection and so are many of the cards. Next I purchased 10 cover art paste-up boards. These are what was used to make the print blocks. A few actually contain the original art work. 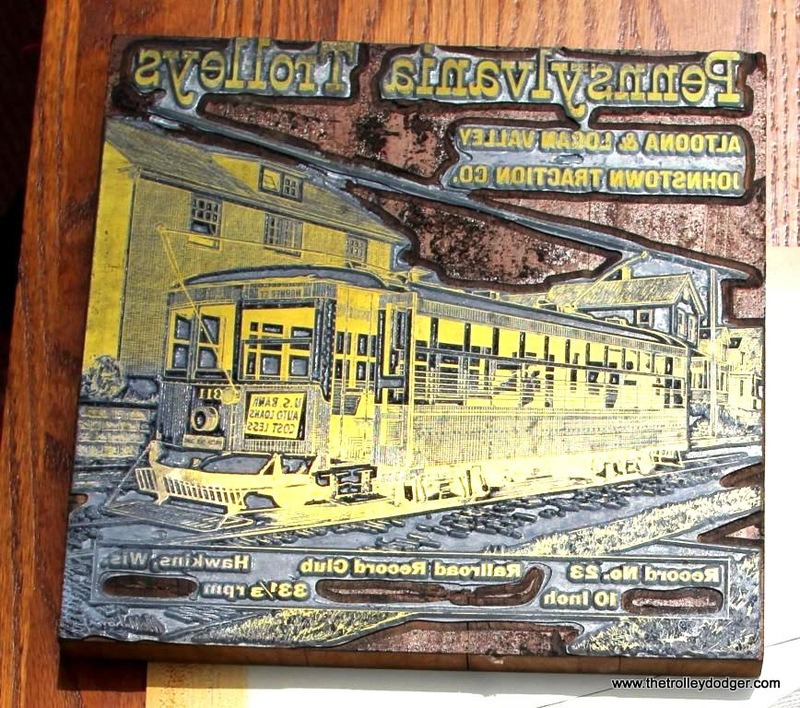 It seems Steventon would have the lettering glued to the same canvas board that the artist drew the picture on. They are not all originals, but several are. This was a bit of luck I would have never thought possible. 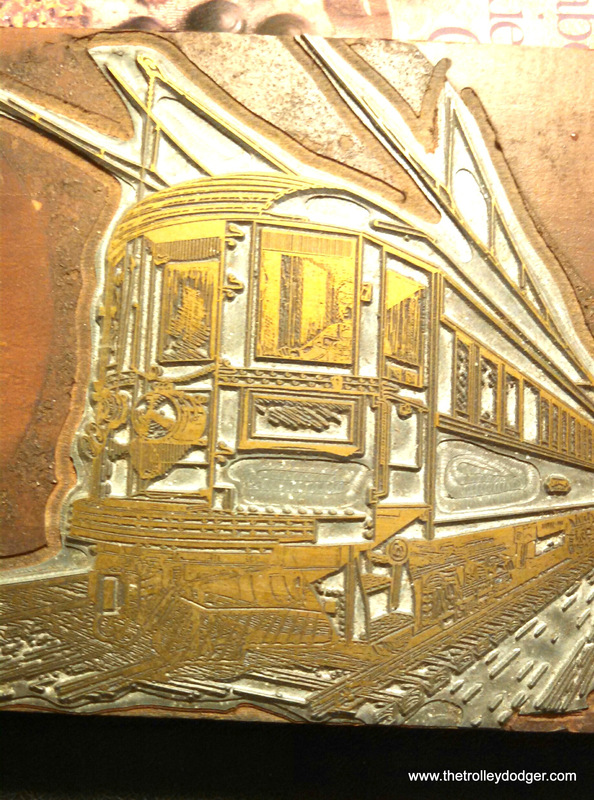 On a few, such as the BC&G drawing for number 22 and the trolley picture for #23, the glued-on lettering has fallen off. 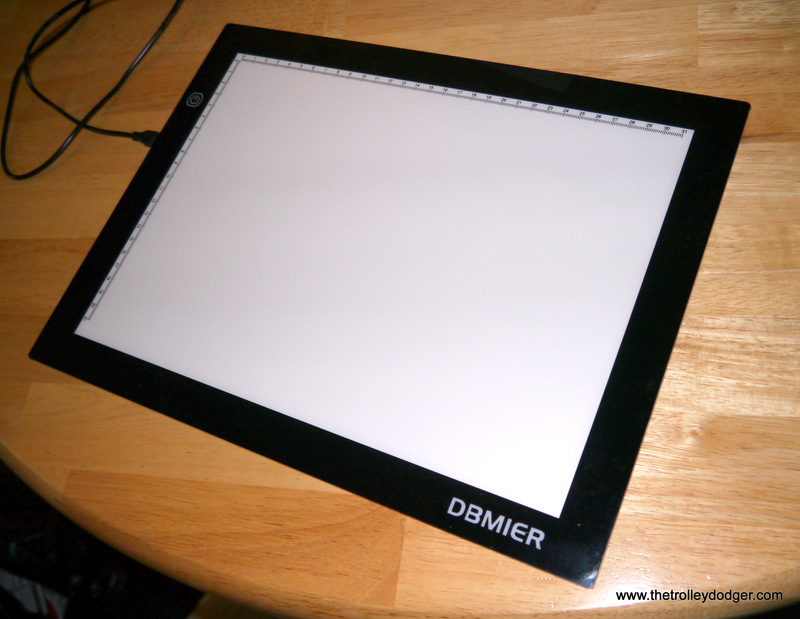 This has revealed more of the drawing than we record owners have ever seen. One other original drawing was found hiding among the others. 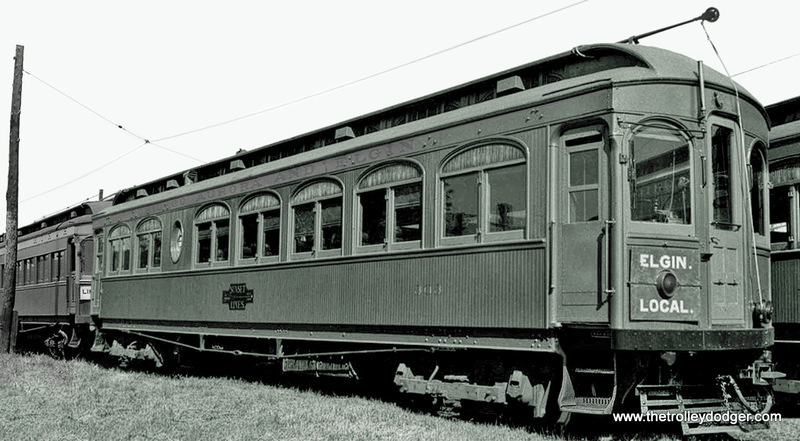 It is of WCF&N interurban car # 100. 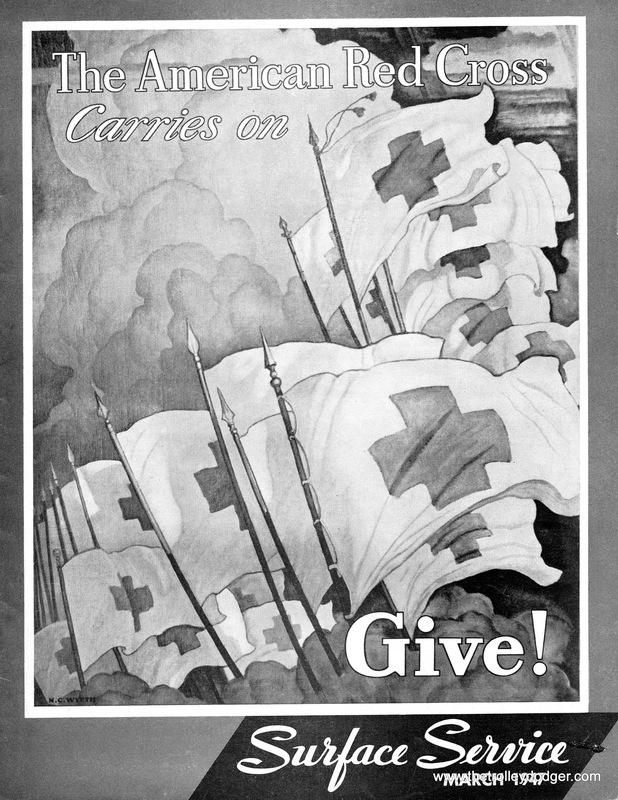 This drawing did not appear on any RRC record jacket. The car is featured on Record 2. 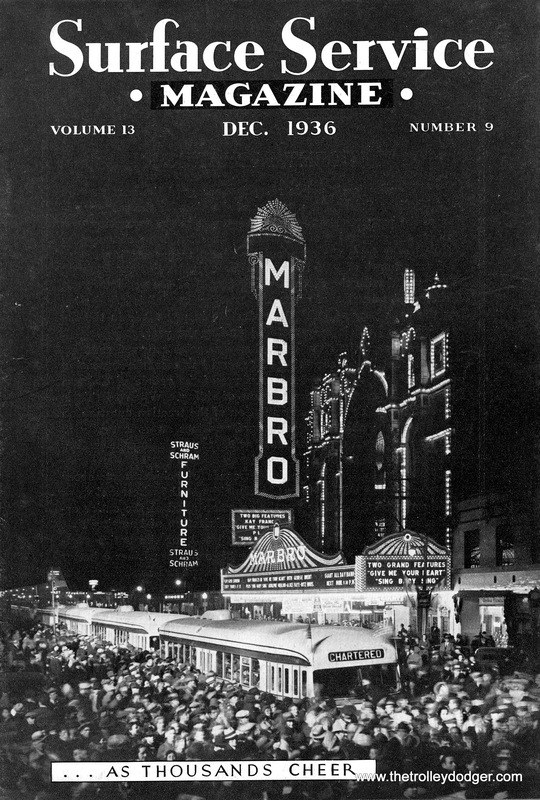 The first edition of the record had a cover that featured a photograph of the car. 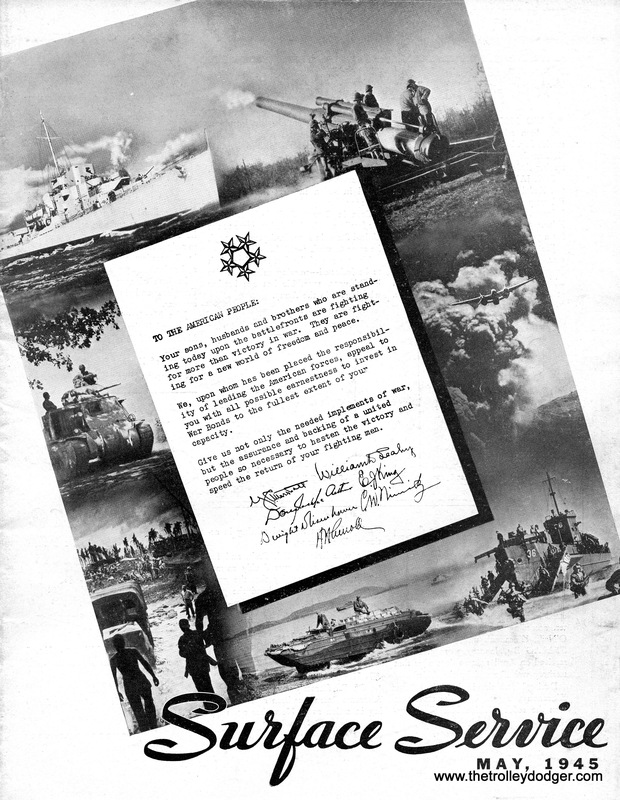 The second edition had a drawing of it, but it is not the one I have. 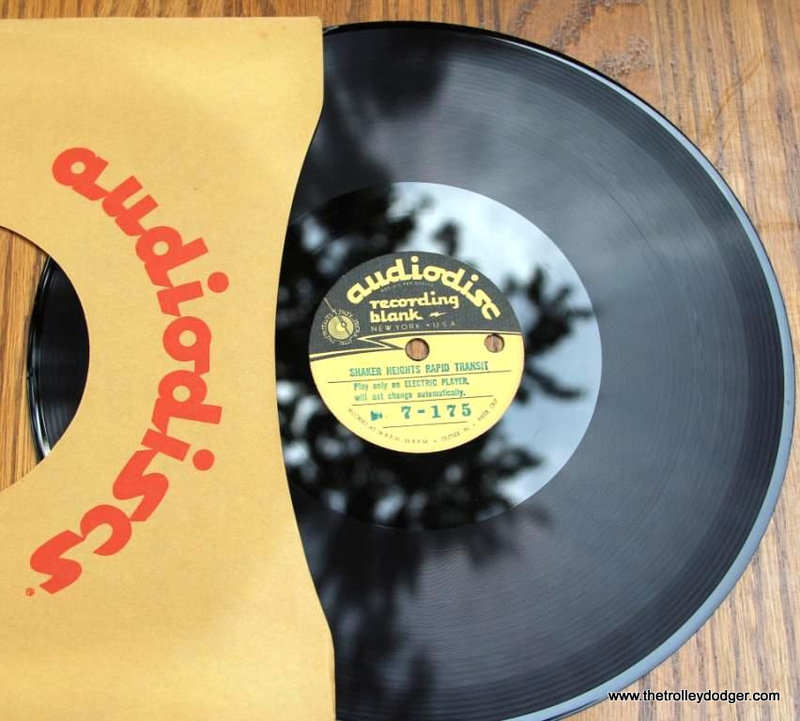 Both of these editions were on 10″ stock. There is no way of knowing for sure but maybe a 12″ reissue of number 2 was in the works and this was to be the cover illustration. It’s possible. It could also be that this was a gift to Steventon or he commissioned it simply because he liked the car. Who knows? Several boxes of photos were for sale as well. Both finances and cargo space were starting to reach their limits so I had to choose only a few to buy. 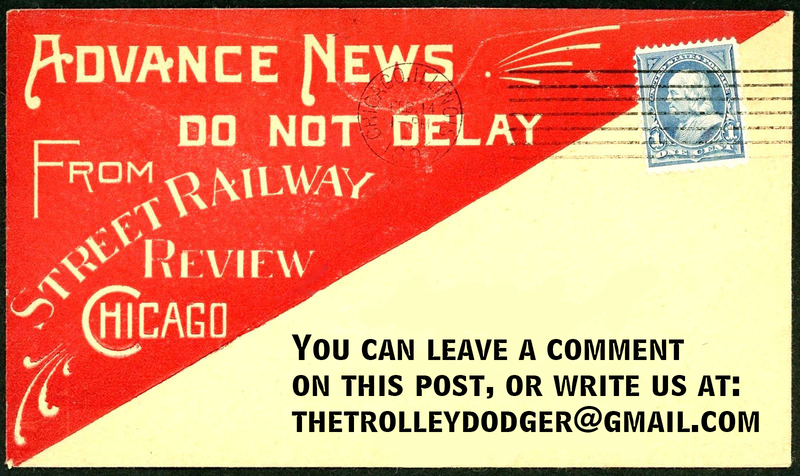 As time allows I will scan and email all of the photos to David and he can include them in future Trolley Dodger posts. 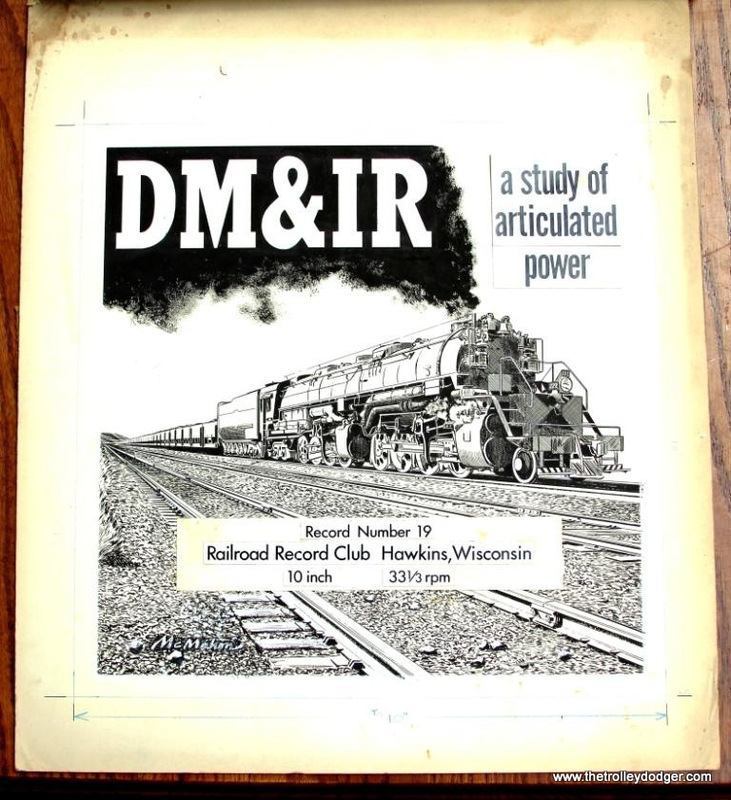 For now, I’ve scanned a few photos that in some way relate to the Railroad Record Club. Photo 1. 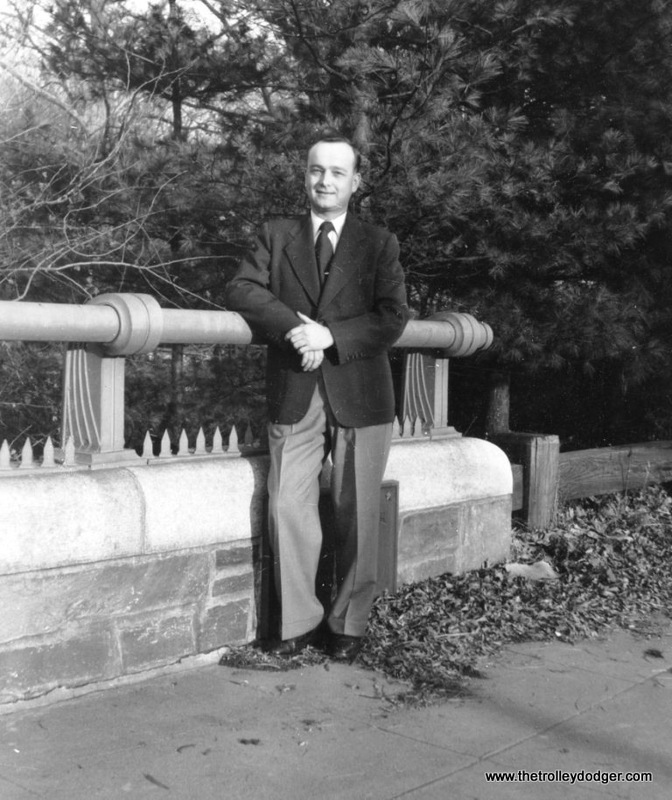 I was looking for a good photo of William Steventon, preferably in a railroad setting or with audio equipment in the field or at home. Nothing was found but this photo of him I think is quite good. Photo 2 & 3. 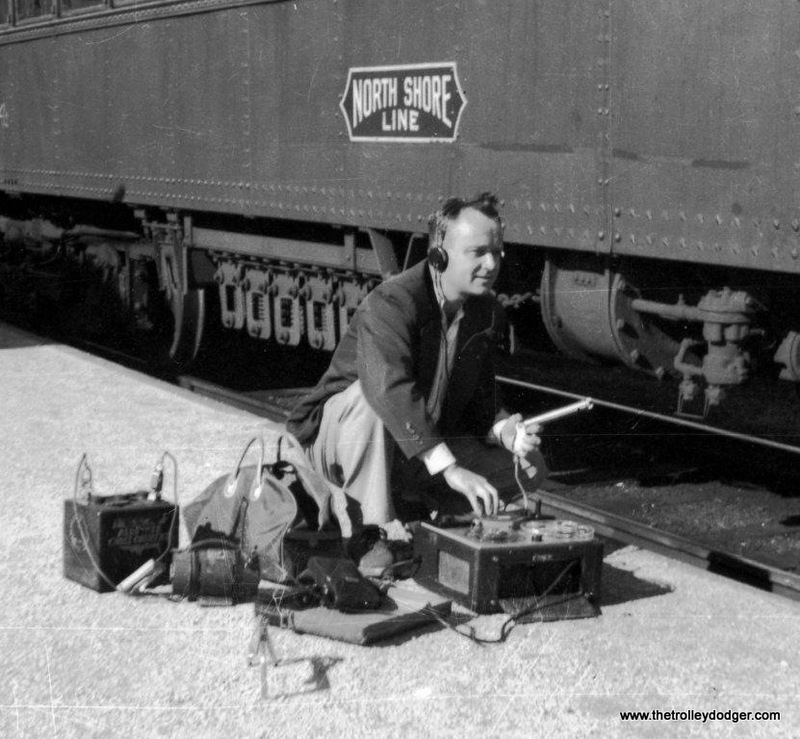 I found a copy of the photo that was used in the TRACTION & MODELS magazine article, the one that shows him making a recording of a North Shore Line interurban car. It has been posted in this blog before but this is a much better scan. 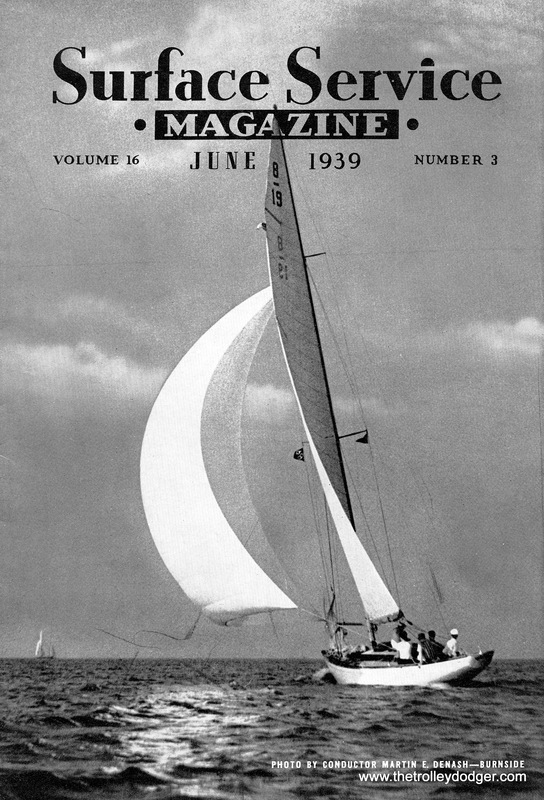 It was made from an actual photograph and not a magazine reproduction as posted before. The shot is somewhat wider too. Because it is a good scan it is possible to crop the photo to a point where you can get a good look at all that recording equipment he needed. Imagine having to cart all that stuff around. Think of this next time you shoot audio AND video on your tiny Smartphone! Photo 4. 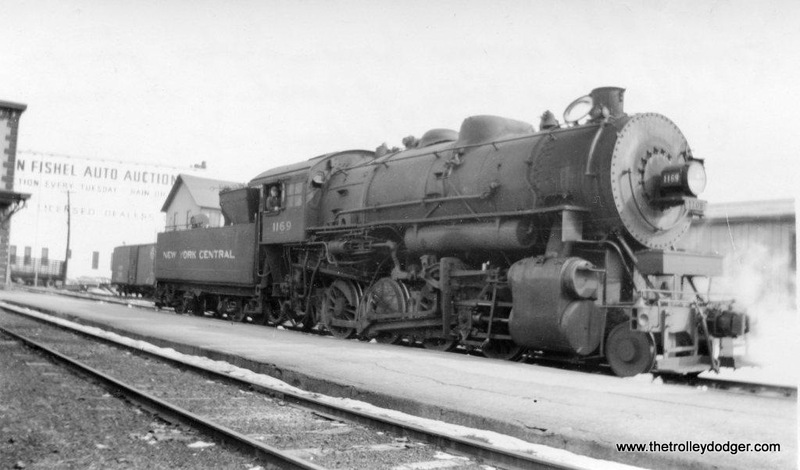 As was stated before, William Steventon’s father Seth was an engineer on the Big 4 (New York Central). This is very likely him in the cab of NYC 6879. 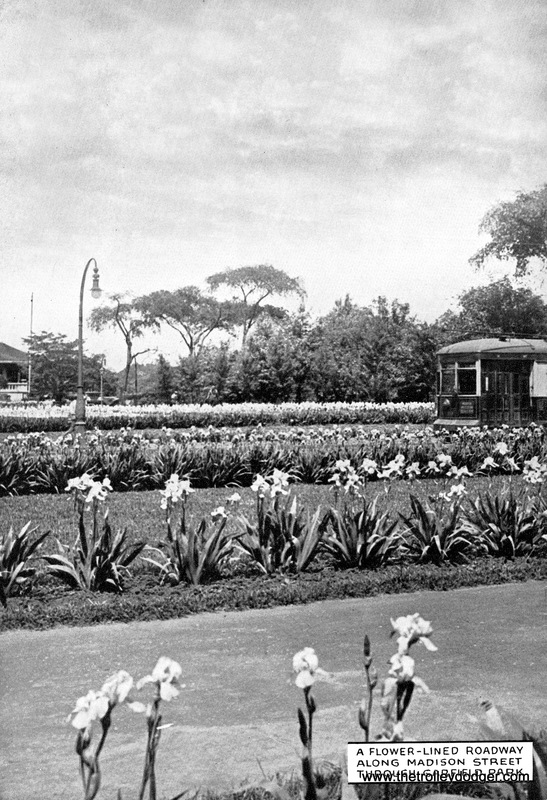 Photo is dated 1915. 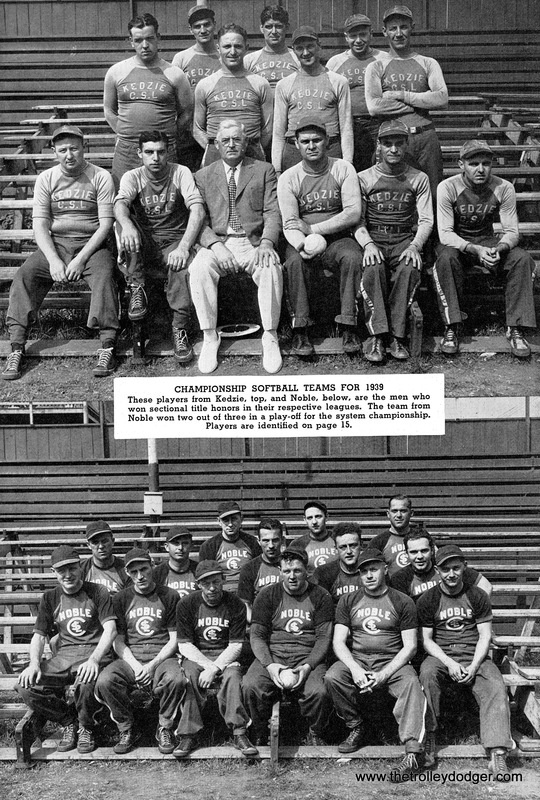 Photos 5 & 6. 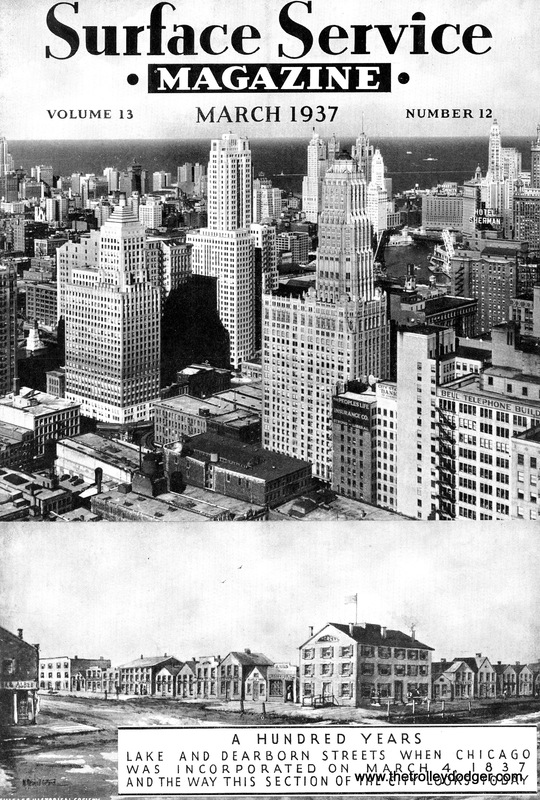 These two are good photos to keep in mind while listening to Record # 20 C&IM/NYC. 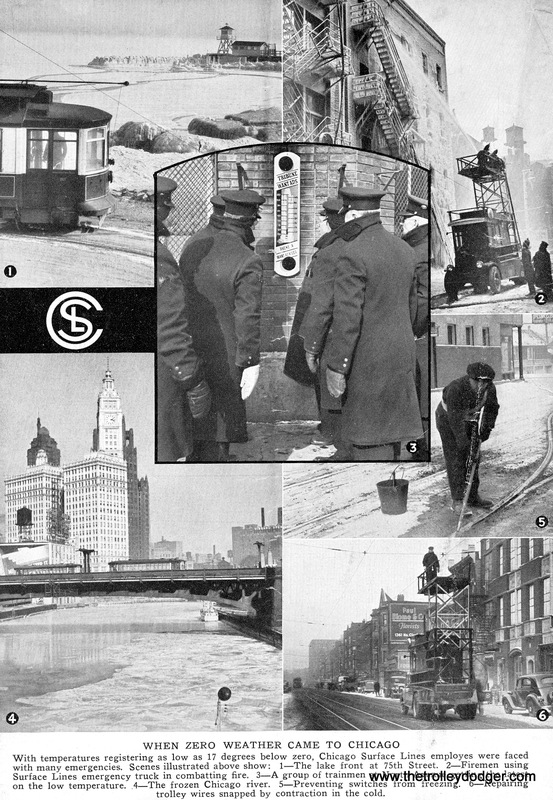 The in cab recording Steventon made while aboard NYC # 1441 with his father as engineer was recorded while switching in this yard. 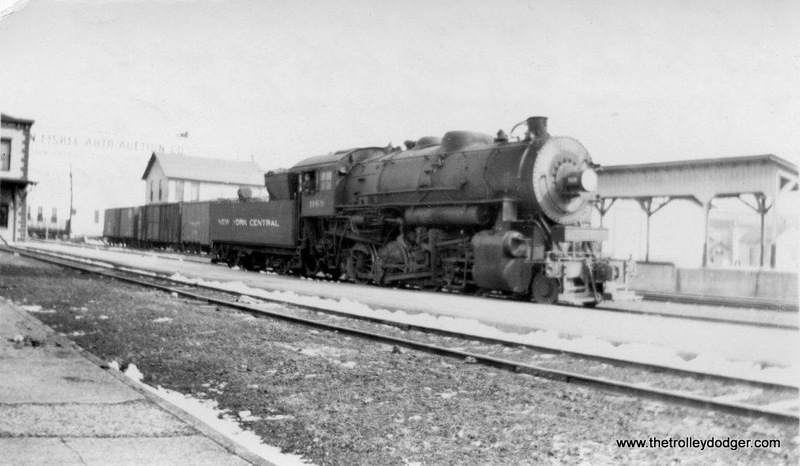 While this photo was not taken at the time the sound recording was made (sound recording made December 9, 1953, these photos were taken on February 12, 1948) and is of a different locomotive (NYC # 1169), the setting is the same- the yard at Cairo, IL. 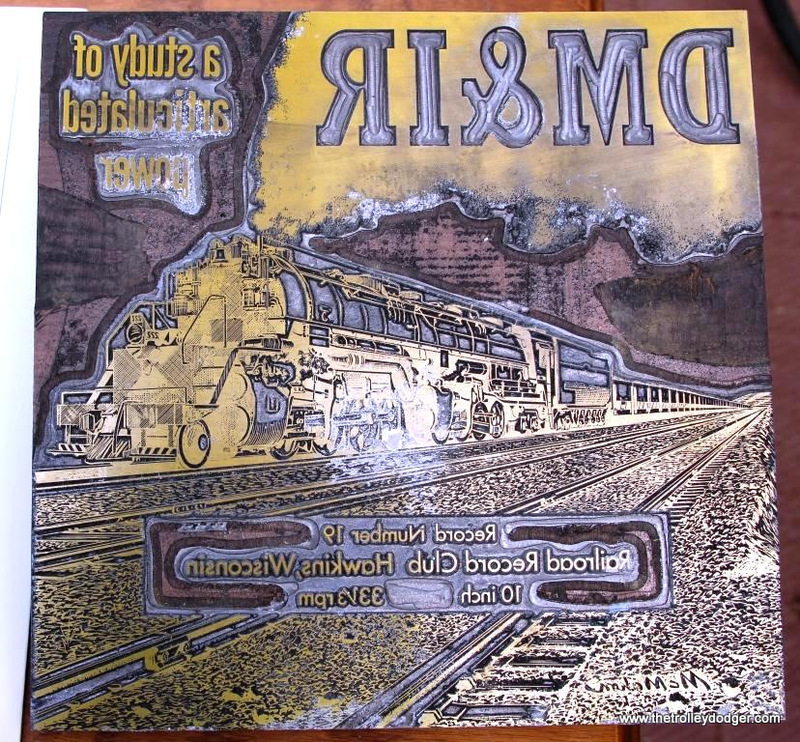 In the liner notes of this record Steventon writes about the sound of the locomotive being “amplified by the huge empty lumber shed we were paralleling at the time.” That huge empty lumber shed is plainly visible in the wider shot of # 1169. Seth was again the engineer at the throttle. Photo 7. Seth in the cab of Shenandoah Central # 12. 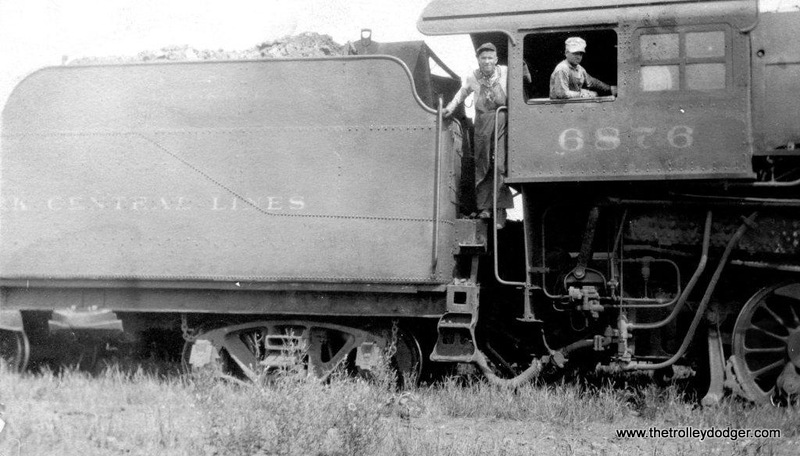 This is the locomotive that is on one of the unreleased audiodisc records. 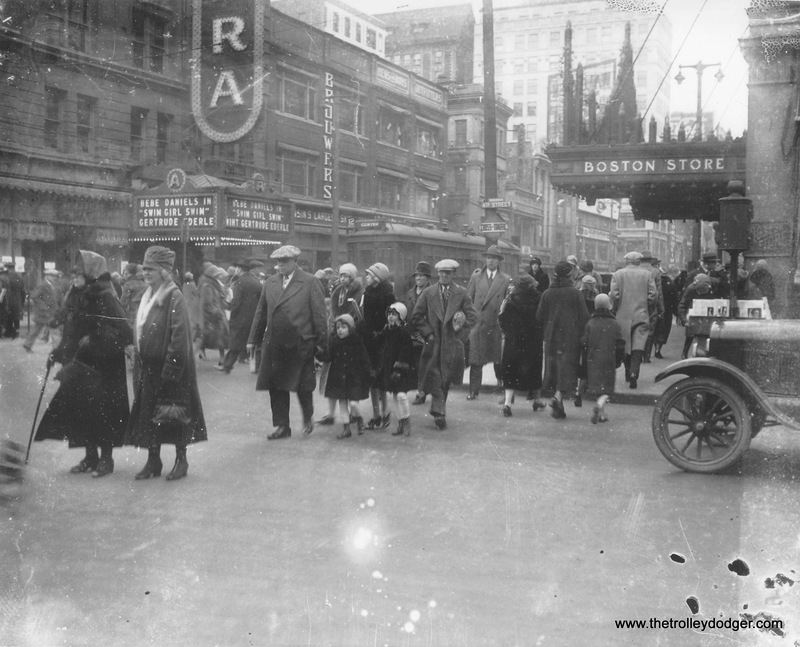 It was very likely taken on the same day as that the sound recordings were made. Photo 8. When I saw this picture in the box with a bunch of others, it stood out too me. Why I wasn’t sure until I took a closer look. 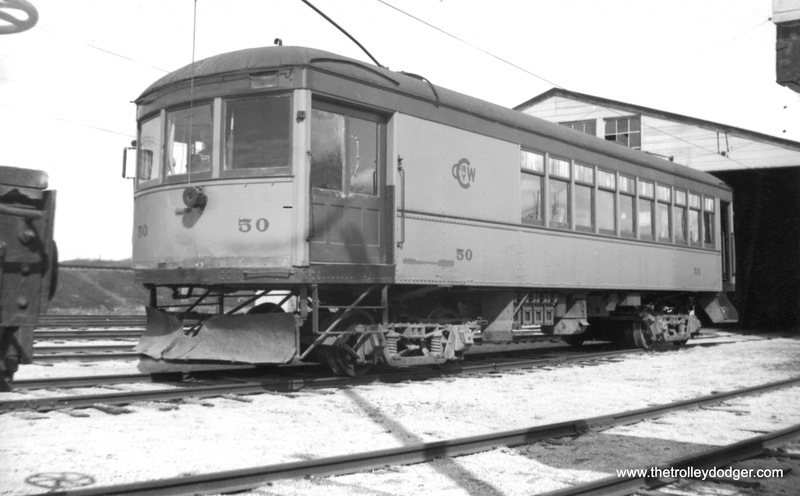 It is of Charles City Western car # 50. 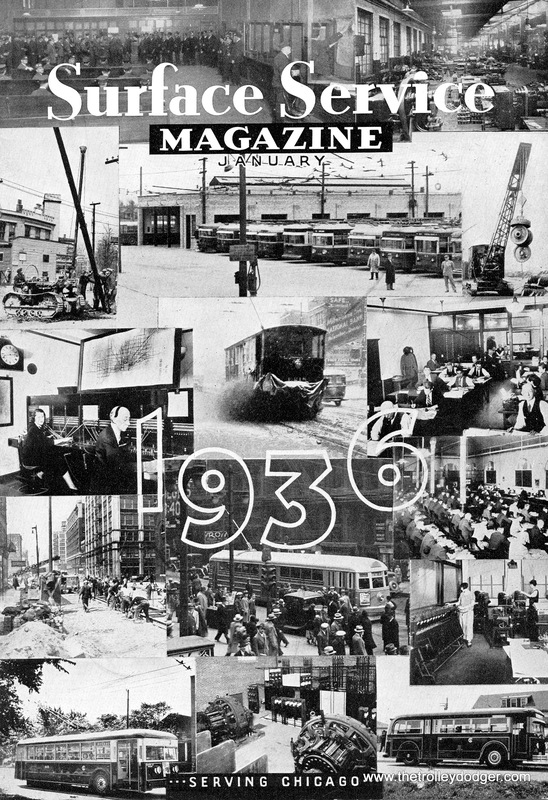 What made it stand out was that the angle and position of the car is exactly as the car appears on the cover of record 28. Remove the car barn and some of the background, take away the bit of freight car to the left, add a few clouds in the sky and you have the record cover! 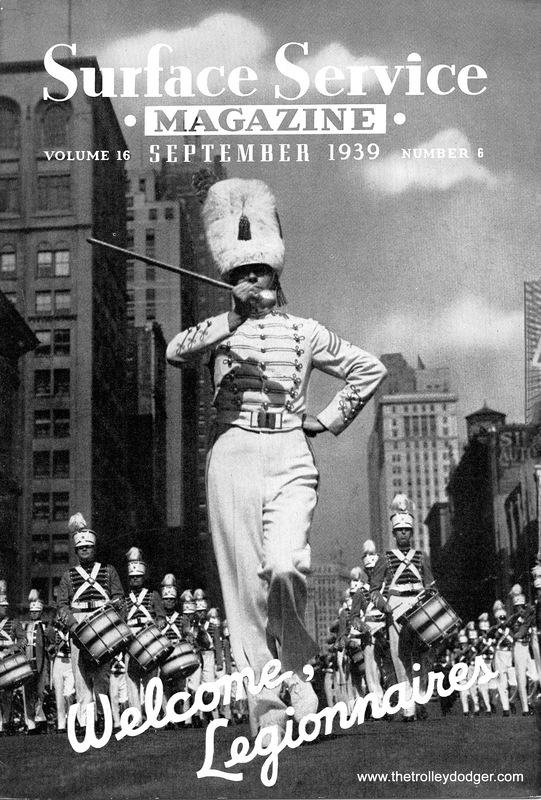 It would be hard to convince me that the record cover drawing is not based on this photo. Photo 9. 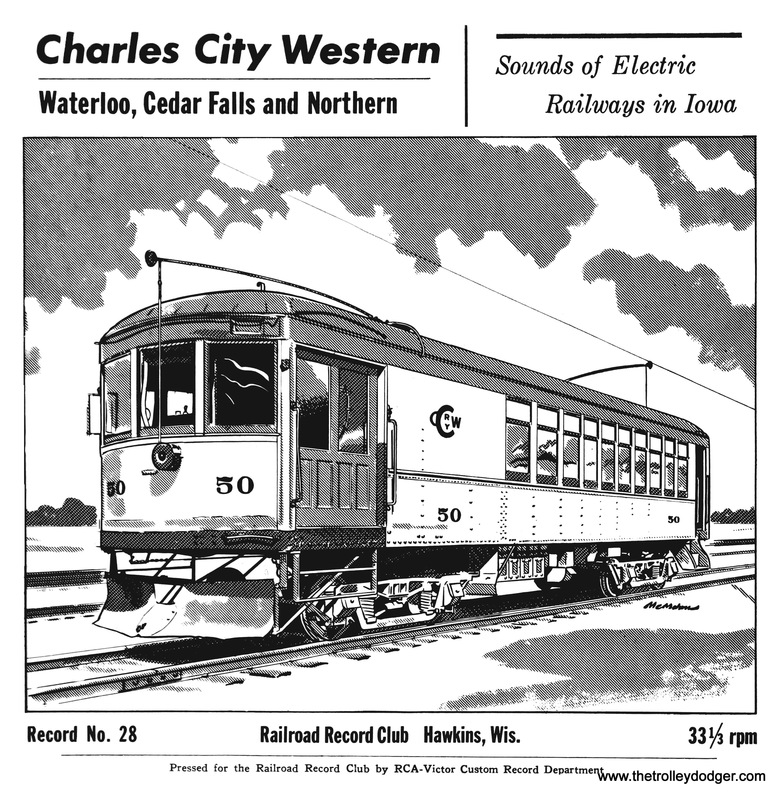 CCW car 50 as it appears on RRC record # 28’s cover. Compare the two. 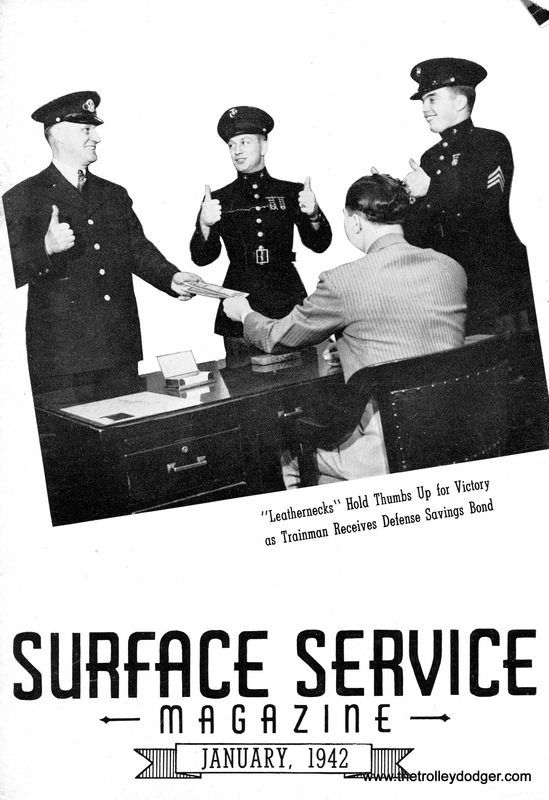 A few interesting documents were found as well. 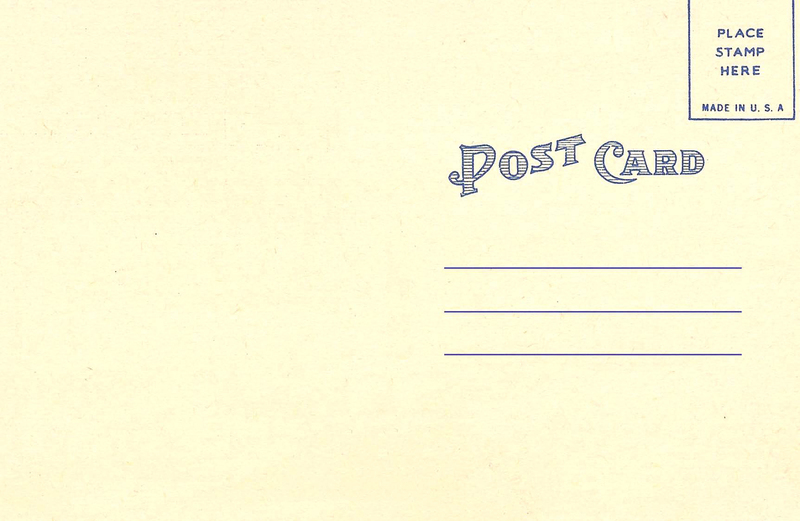 There was a large box of correspondence to and from the Club. Apparently Mr. Steventon threw very little away. 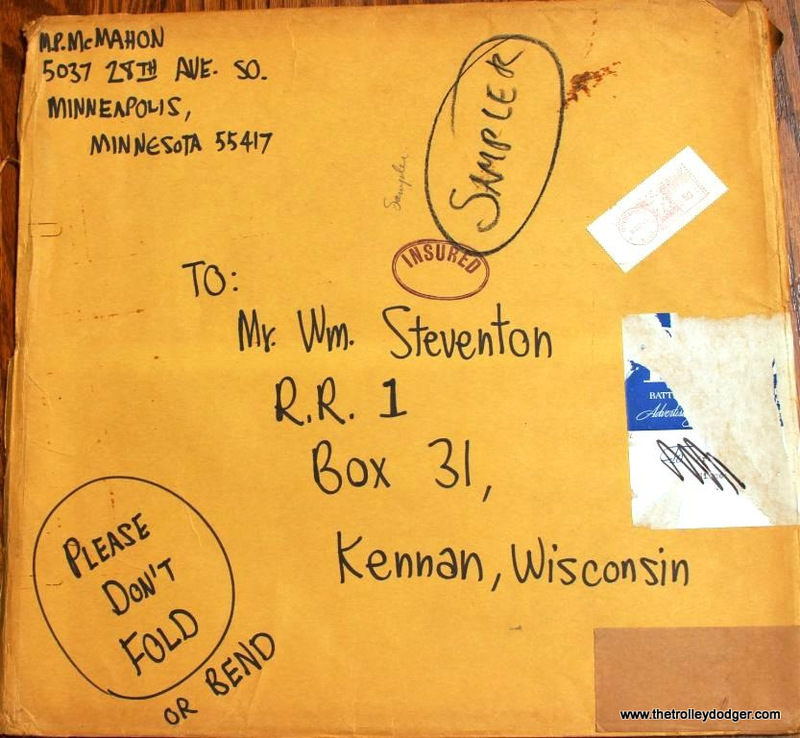 If you ever wrote to him or ordered a record from him, chances are your letter or envelope are in that box! I looked briefly for anything from me but no luck. I would have needed more time to do a good search. 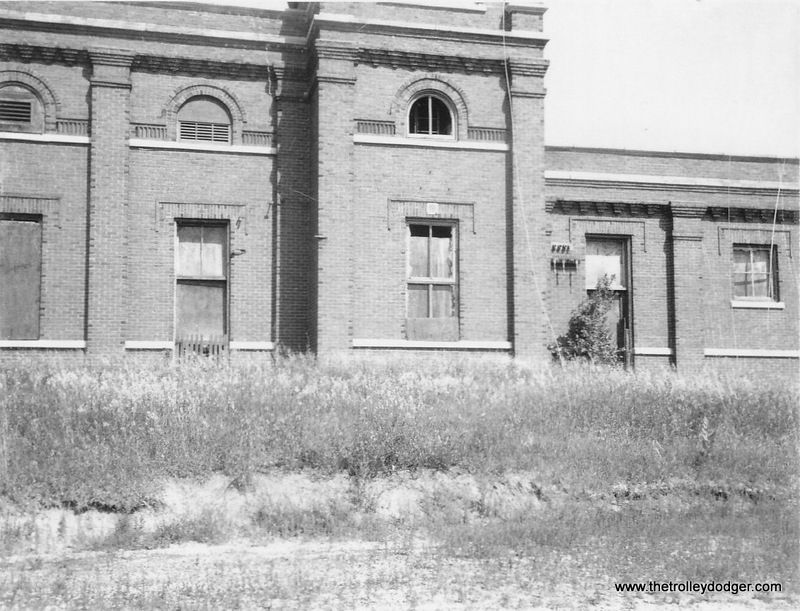 There were more treasures to be found in that darkened building for sure. Time, storage space, and money, the bane I’m sure of every collector, shook me from my excitation. No more space and no more money meant no more discoveries. While I’m very happy with what I got, there is still more. All those boxes of records I turned down and all those wonderful photos I couldn’t afford. I would hate to find out they had to be trashed. 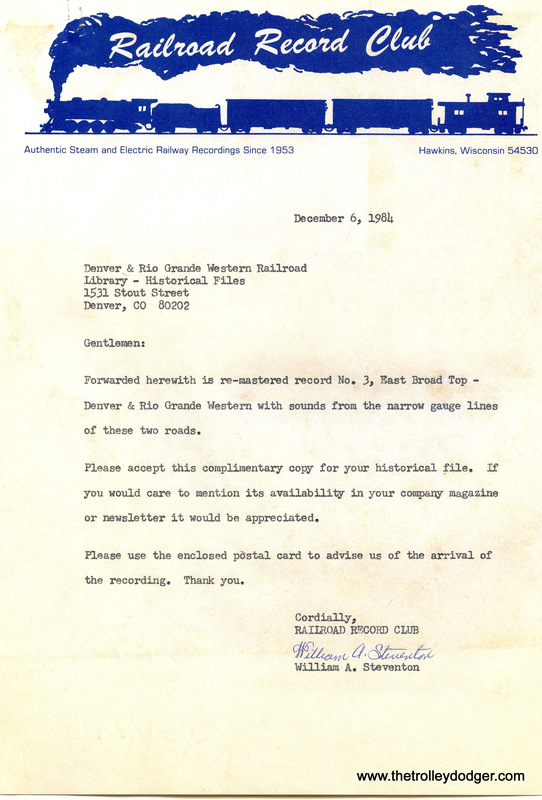 The most glaring oversight on my part were the boxes of reel to reel tapes I saw. 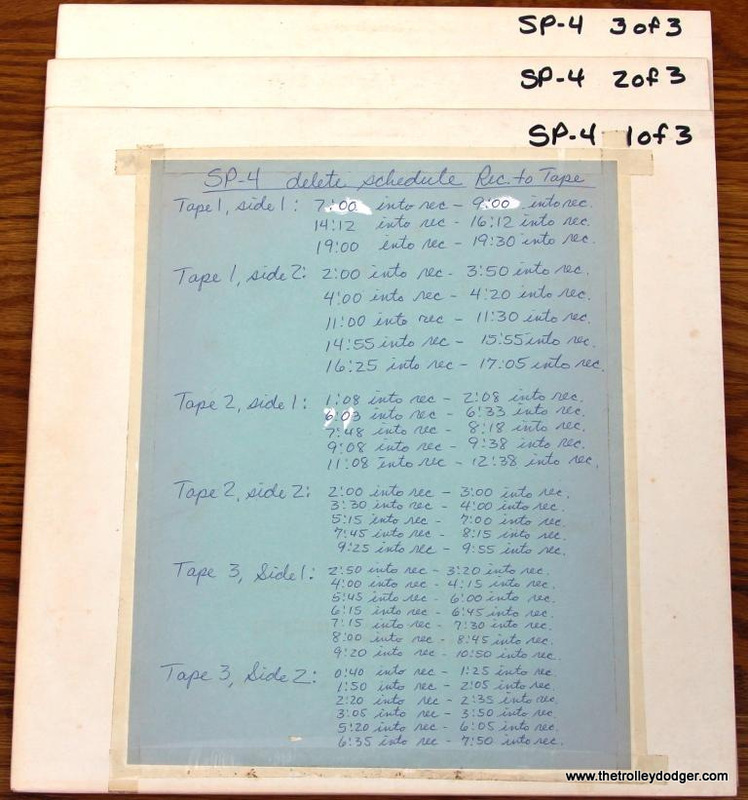 I did look at them and even took some photos, but it all appeared to be master tapes for the records. All these sound I was positive were safely cut into vinyl. 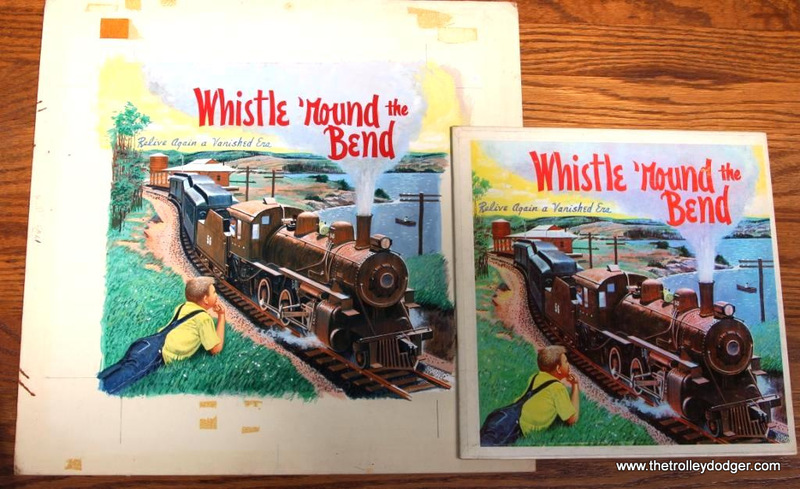 After getting home and closely looking at those photos I can now see that there was unreleased railroad audio there too. 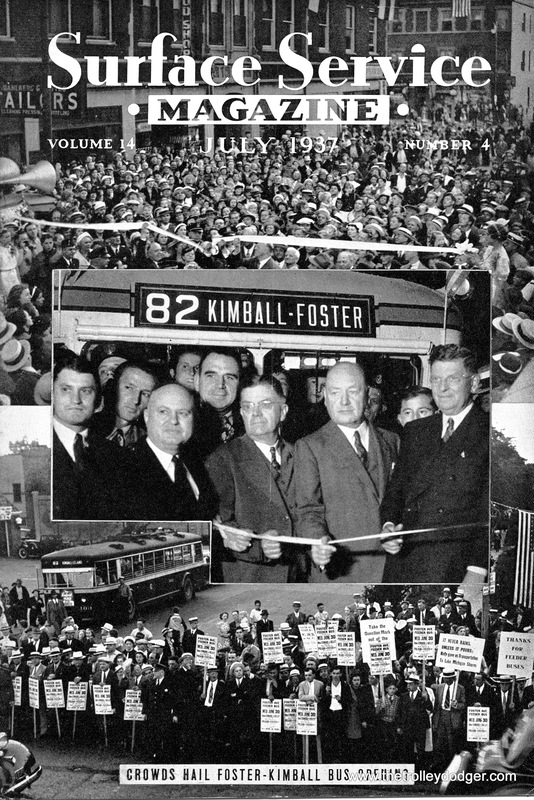 Such titles as L&N, NKP Diesel, IRT Subway, IND Subway, 3rd Avenue El and the Queensboro Bridge Trolley, among others, now jumped out at me. Perhaps there might be a way to save this material as well. I had a great time making these discoveries, and I’m very happy that David should be able to make CDs of these sounds so they can be shared with all who are interested. 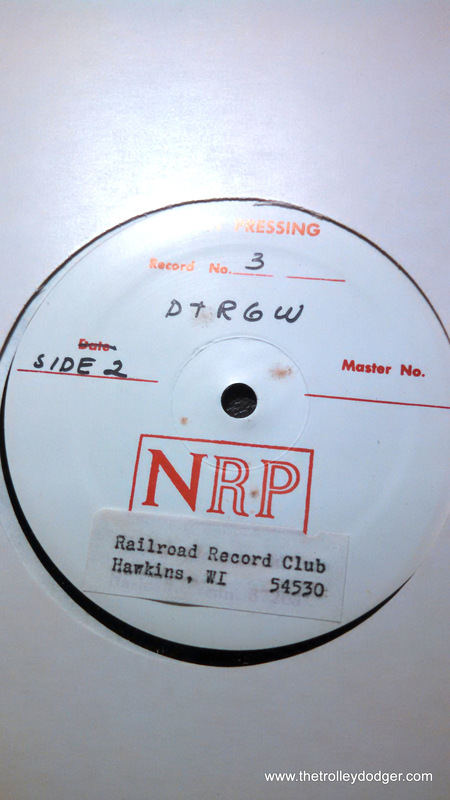 After not being heard in decades, it feels great to be a part of the effort to bring these lost Railroad Record Club sounds into the light of day. 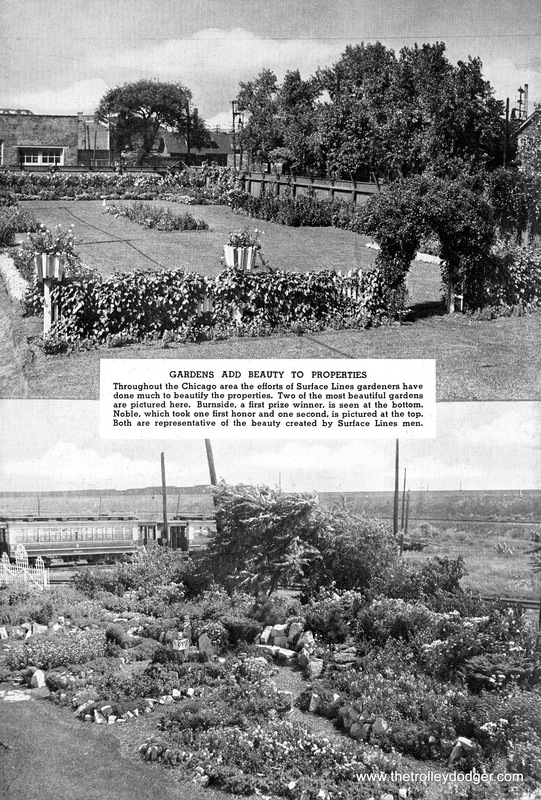 This was the aftermath of the 8/24/49 collision at Soldiers Home. 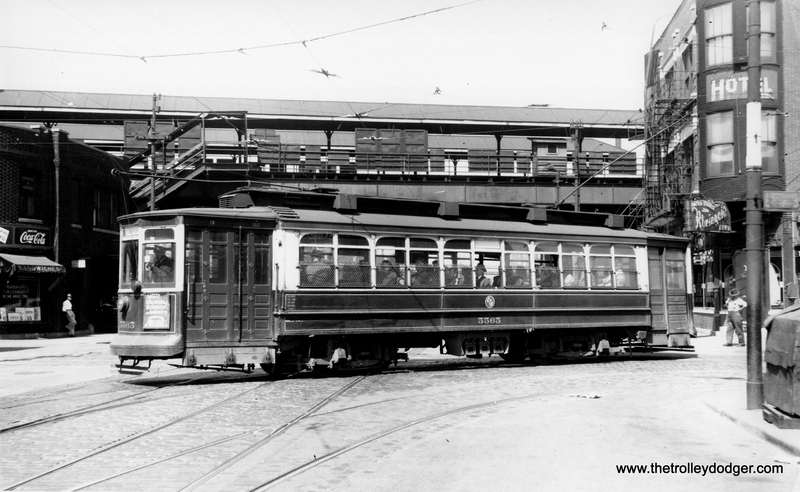 Car 1143 with motorman Ralph Janus was an all steel car. That was the one that backed up. 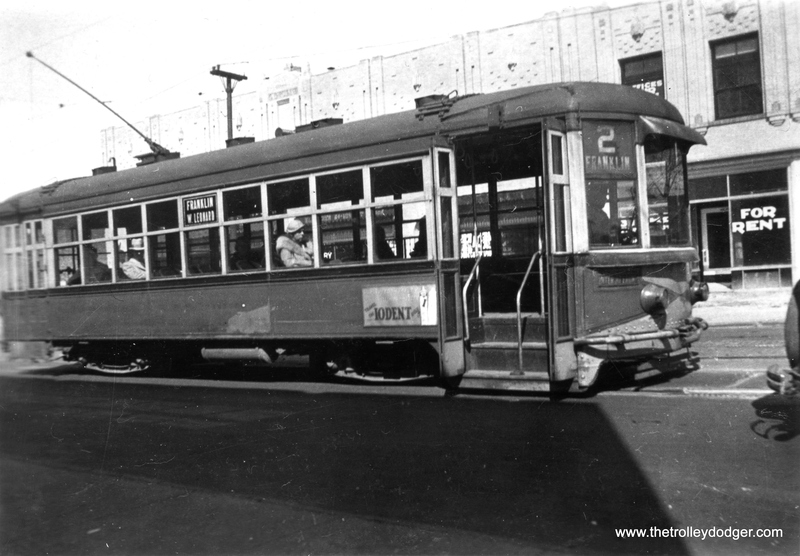 Car 1119 with motorman LeRoy Equitz was a car that was wood with I think steel sheets surrounding it. 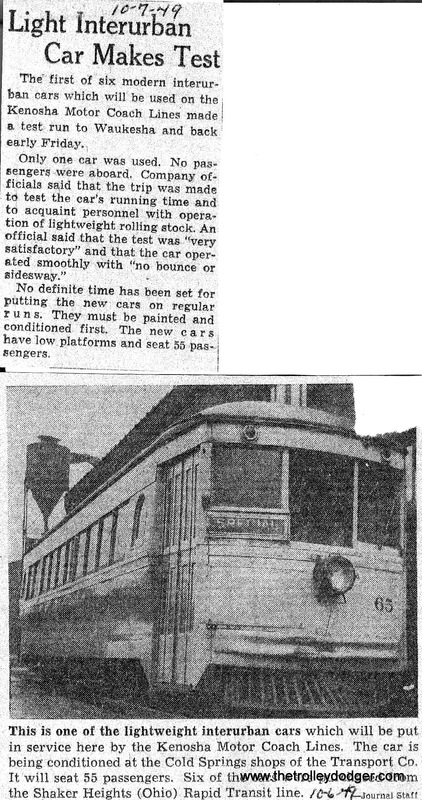 That was true of nearly all of the 1100-series TM single cars except 1142-1145. Those 4 were all steel. Equitz was speeding going twice as fast as he should have been given that he had a yellow caution signal. As you came downhill and into the Calvary Cemetery cut, the r.o.w. made a sharp curve beneath the Hawley Rd. overpass and then continued downhill. That and the Mitchell Blvd. overpass at the east end of the cut limited the view ahead. Equitz didn’t spot the 1143 until it was too late. 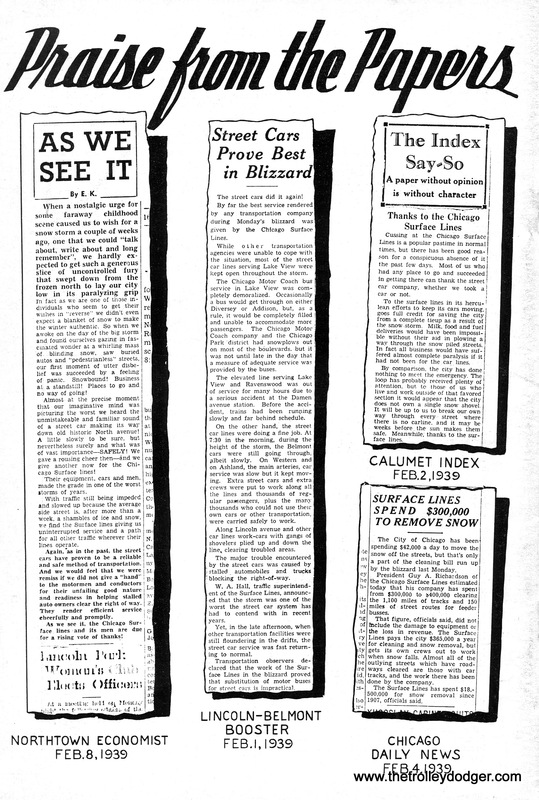 The newspaper picture I’m attaching looks forward from the front or what was left of the front of 1119 to the back of 1143. Note the telescoping. That’s the floor of 1143 in front of the fireman who is bending over on the right. 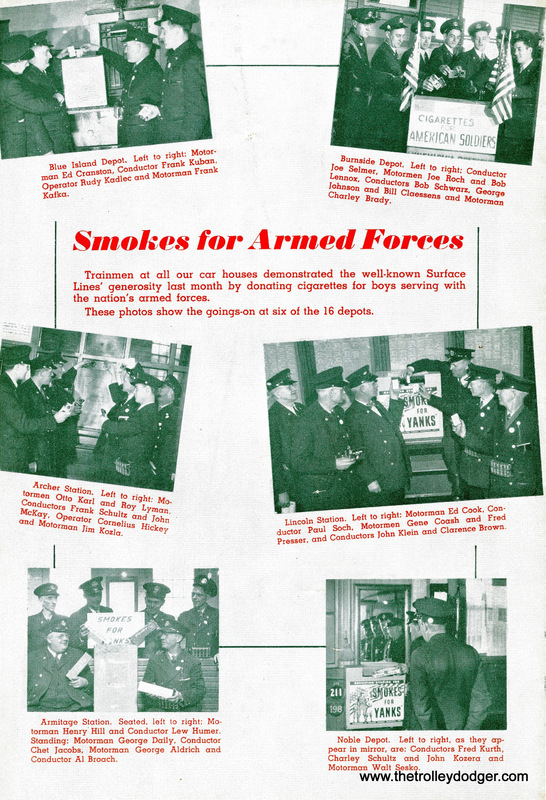 Had anyone been sitting in the smoking compartment of 1143 they would have been killed. Luckily, no one was. 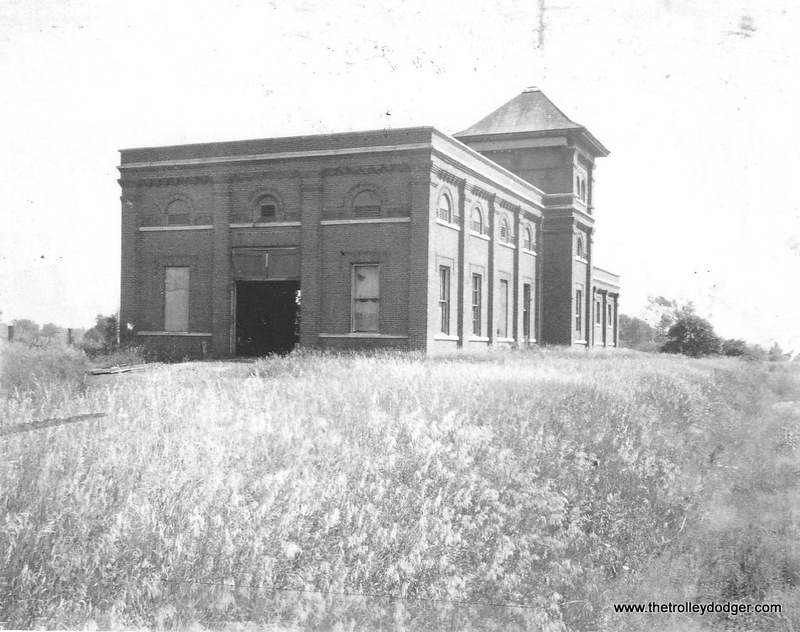 The Calvary Cemetery cut is the only part of the abandoned r.o.w. that remains relatively unchanged today. 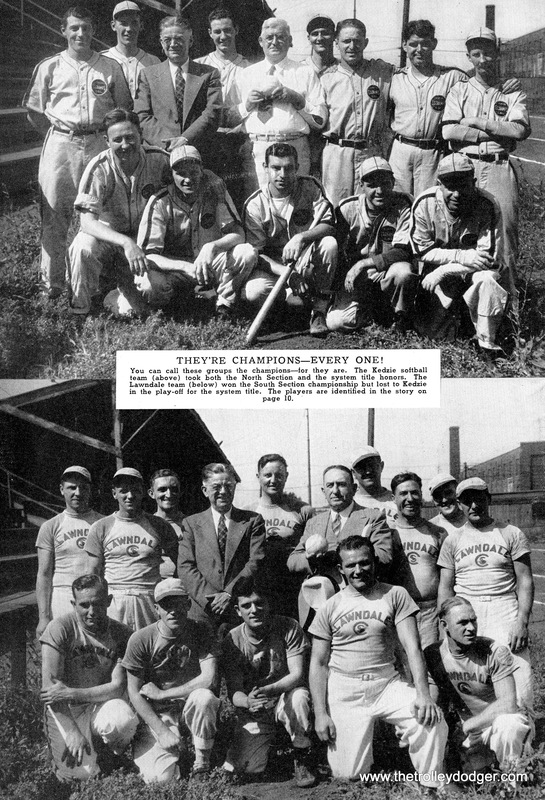 Here are some photos of it over the years. Here’s more about that accident, Dave as well as a view of the 65 as it looked upon arrival in Milwaukee. Note no front end “LVT” design. 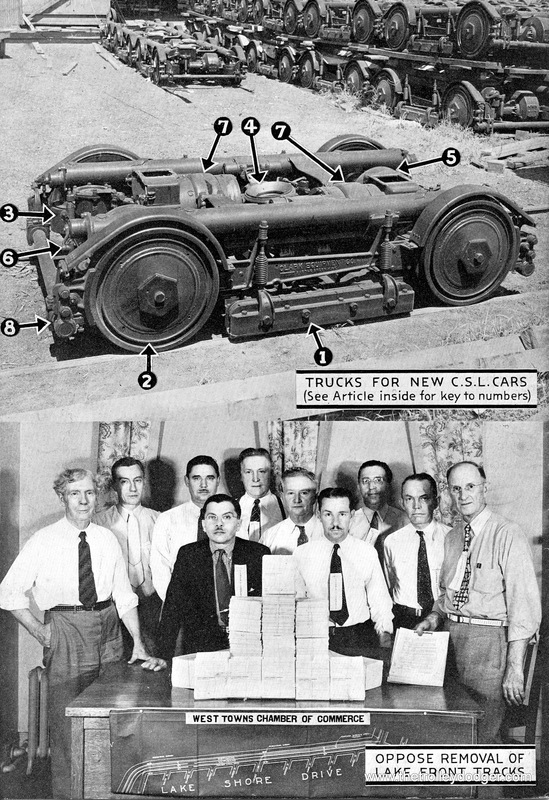 I promised Scott (Greig) that I would look into the Speedrail accident of 9/5/50 to see if the newspaper accounts identified the crew of car 1121. 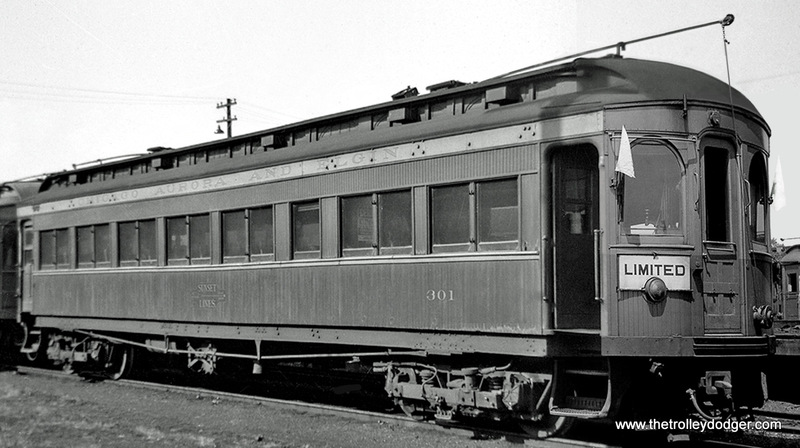 In the July, 2017 comments, Scott thought that the motorman of car 1121 was Ralph Janus who was motorman of car 1143 which backed up for the missed passenger at Soldiers Home station on 8/24/49 and was rammed from behind by car 1119 with motorman LeRoy Equitz. I thought it was someone by the name of Eugene Thompson. 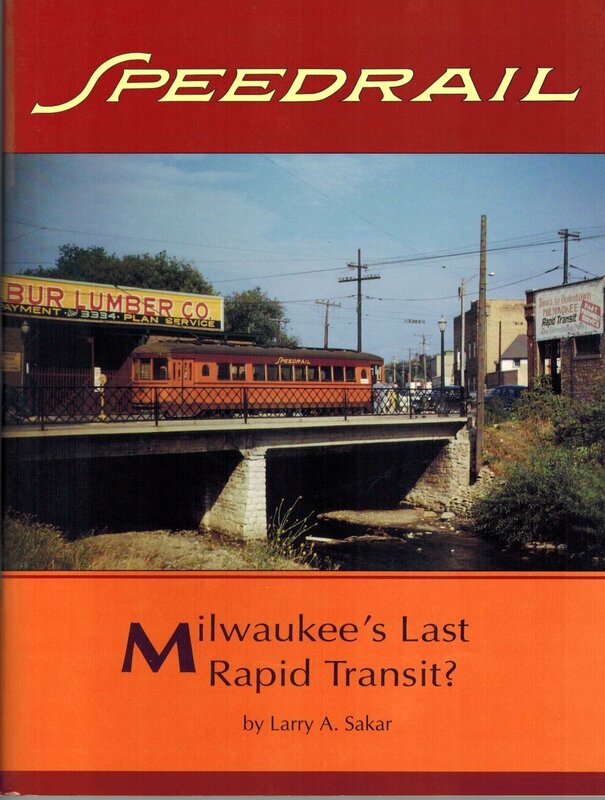 According to the Milwaukee Journal article, “Speedrail Dead Now 10; Line Has New Collision” (MKE Journal 9/5/50 P.1) the motorman of car 1121 was Eugene Thompson. 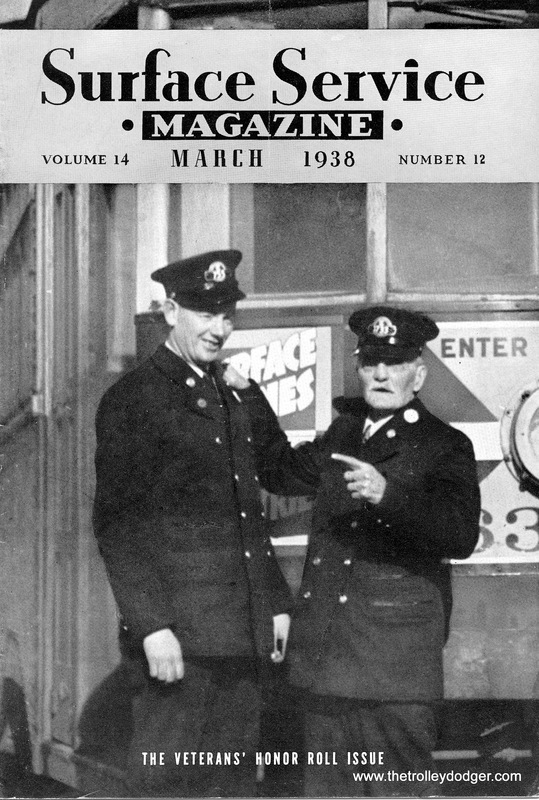 The motorman of car 64 which 1121 ran into was Virgil McCann. 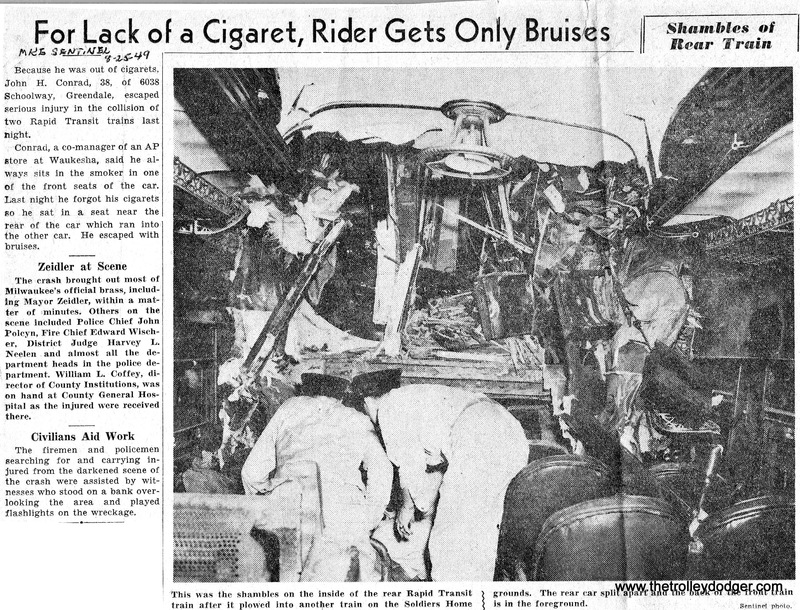 There was one passenger aboard car 64, Ewald Rintelmann, age 50 of Hales Corners whom the article says was “shaken and bruised.” I hoped that the other two crew members aboard car 1121 would be identified but they weren’t. 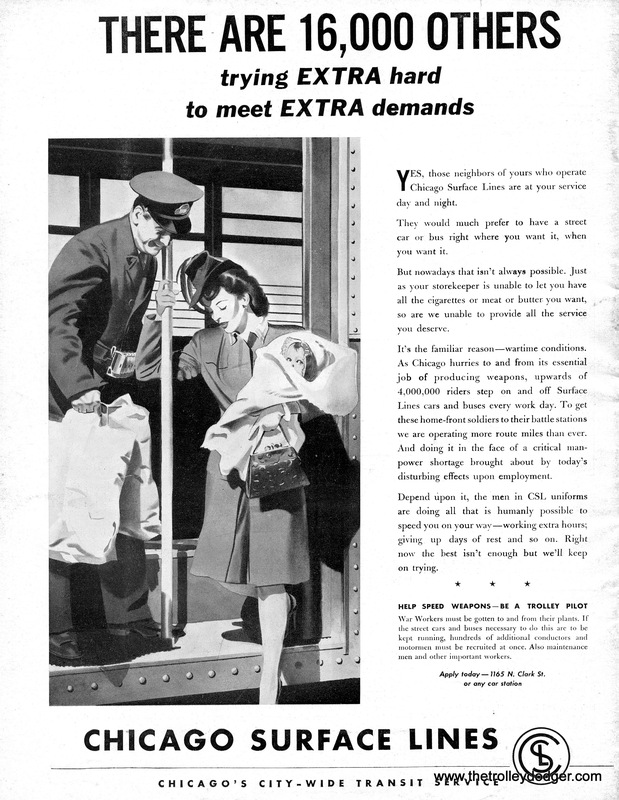 It only mentions that there were “2 other men aboard the freight car.” At least not in this article or the following day. As I mentioned previously, I recall the late Speedrail motorman Don Leistikow saying it was a father and son, one of whom was the conductor and the other the brakeman. 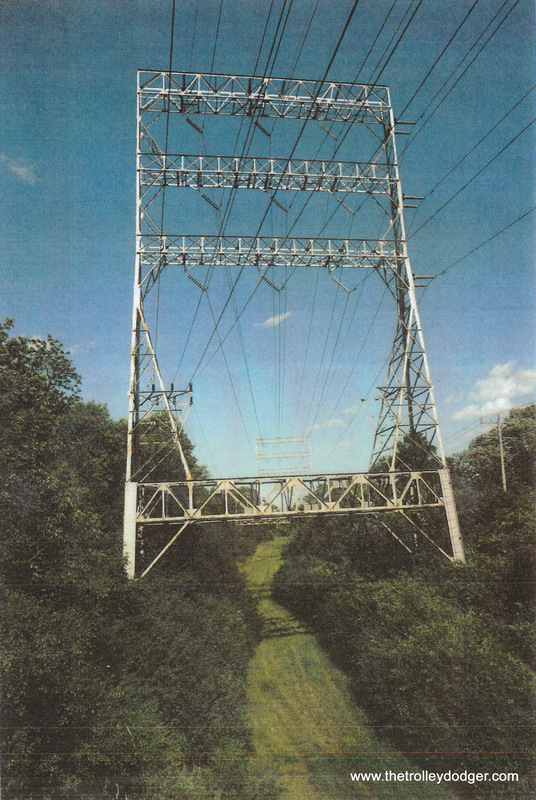 The article reported that Maeder “initially blamed the accident on ‘slick, moisture covered tracks’.” The accident happened 1000 feet south of the West Jct. station. I’ll give Maeder credit for coming up with a good story to explain his failure to keep an eye on the signal but that’s all. 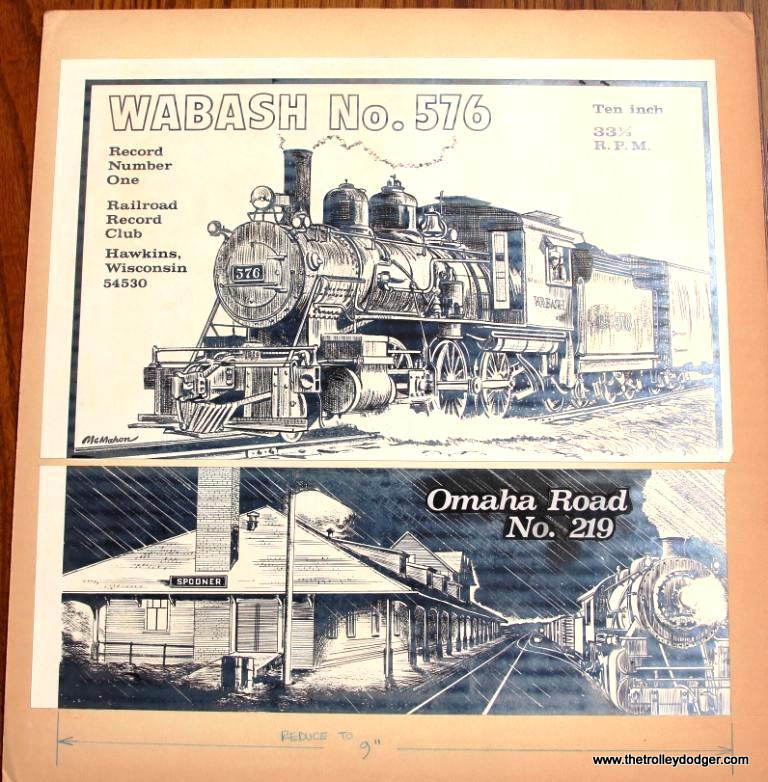 He makes no mention of the fact that Speedrail supervisor John Heberling was stationed at Oklahoma Ave. and that he had set the switch so that Maeder’s train went into the siding. Nor does he mention that he ordered Heberling to immediately reset the switch and let him out of the siding when the latter wanted to take time to call the dispatcher and see where Equitz was at. 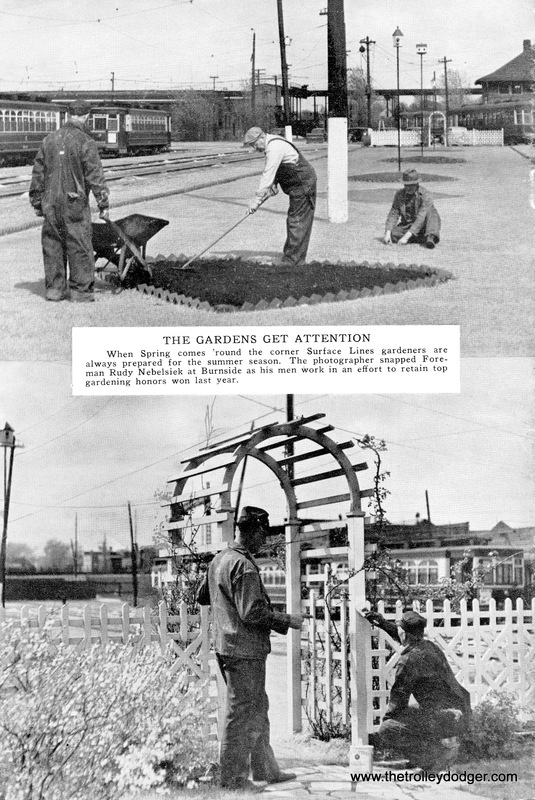 Neither John Heberling nor any of the fans gathered around Maeder on the front platform ever reported seeing a small boy playing or standing near the tracks. 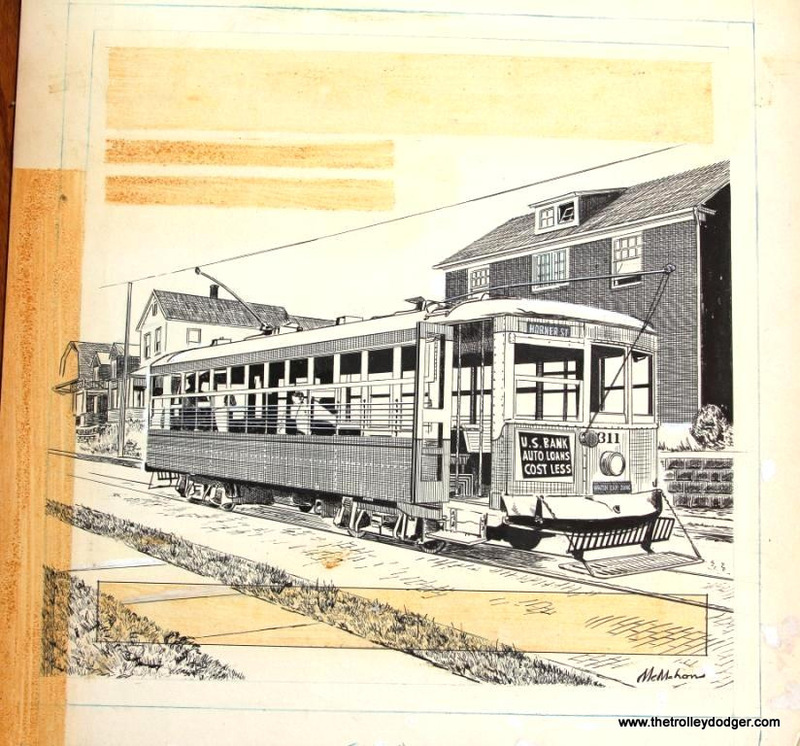 When Maeder refers to “the landing,” I am guessing he was referring to the station platform. 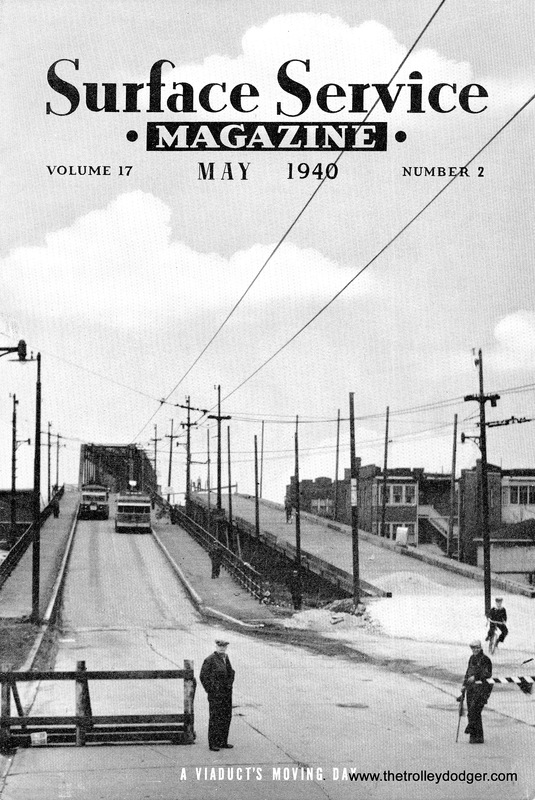 Oklahoma Ave. station was on the bridge over Oklahoma Ave. This was when he spotted the roof of Equitz’s train coming up over the top of the hill ahead of the northbound train. He said he DID NOT see the signal at Oklahoma Ave.! 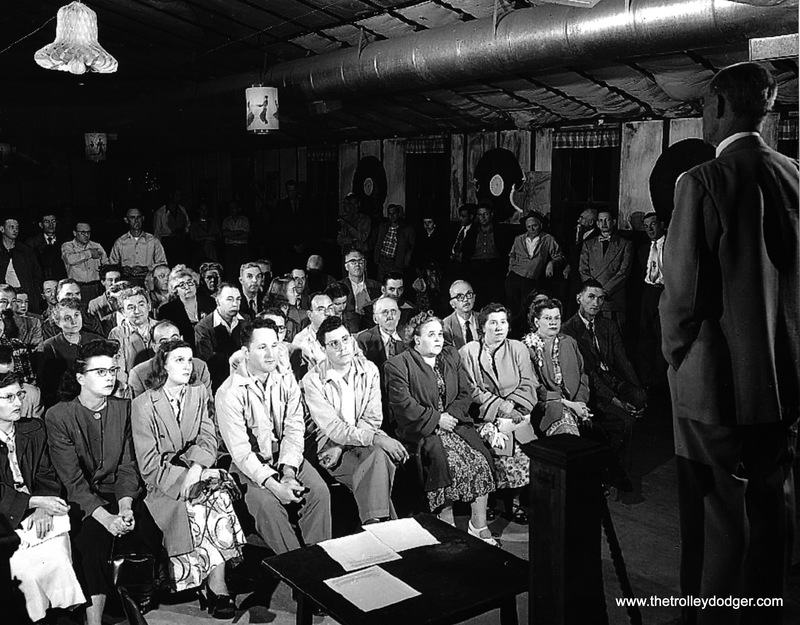 I think his testimony at the time carries far more weight than the way he remembered events more than 60 years later. I should also point out that had he been so inclined the DA could have charged Wolter with negligence since PSC rules required that a qualified motorman had to be present at all times when someone who was not qualified was operating the train. He had absolutely no business being in the rear car of 39-40. 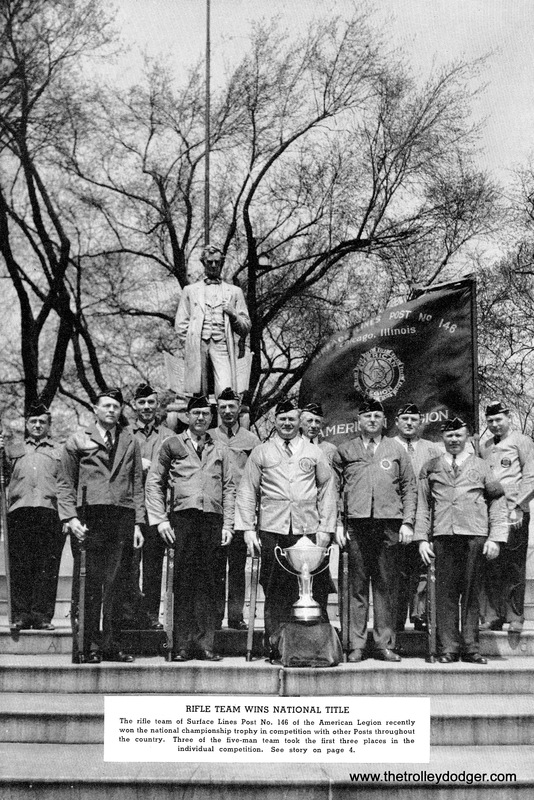 Don Leistikow said that had he been the motorman he would have stood right next to Maeder whether he liked it or not. 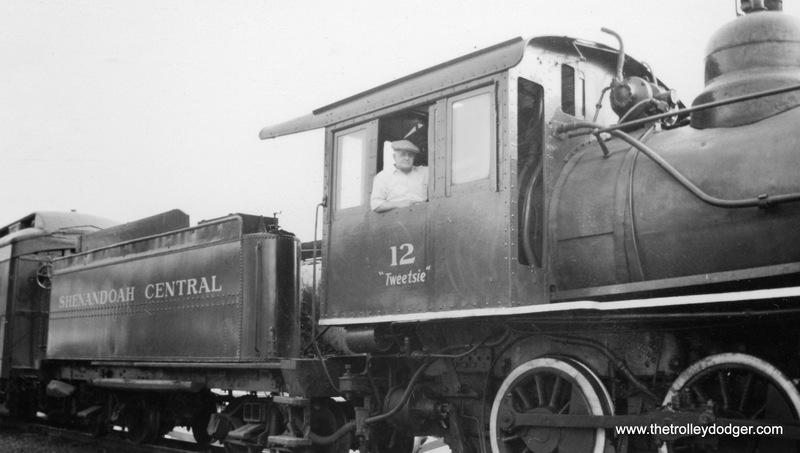 He would have been the scheduled motorman and this was officially his train. He was the person responsible for it. As Don pointed out the PSC regulations did not make an exception just because you owned the company. Based on the way the DA went after Maeder and statements made by the DA as early as 9-5 when he said he had concluded that based on the evidence he’d gathered that Maeder went thru a red signal. And it was obvious that he wasn’t buying Maeder’s story about safety concerns. 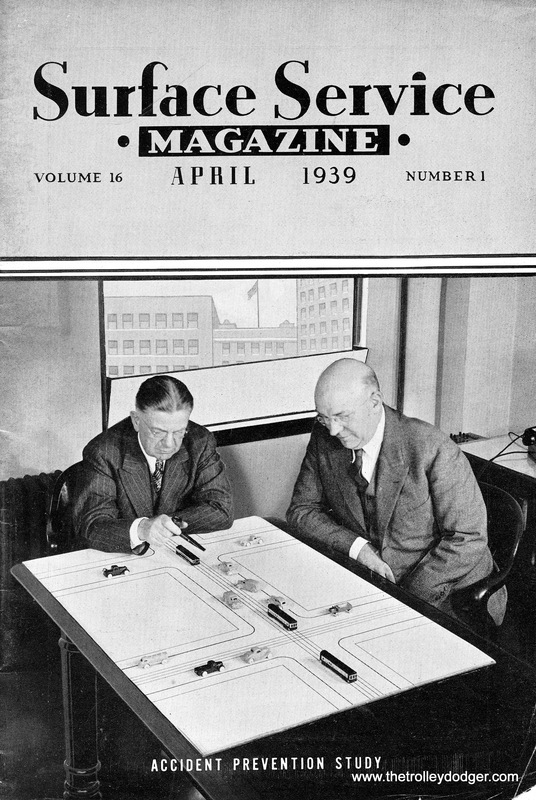 Maeder’s frequent sessions with railfans in his office, seeking their input while ignoring Tennyson the VP of operations, fits the pattern of someone who on 9/2 saw an opportunity to bask in the admiration of his fellow model railroaders and railfans and just couldn’t pass up such a “golden opportunity” to show off by being at the controls of duplex 39-40. Tennyson said as much in my book and reluctantly, I would have to agree with him. 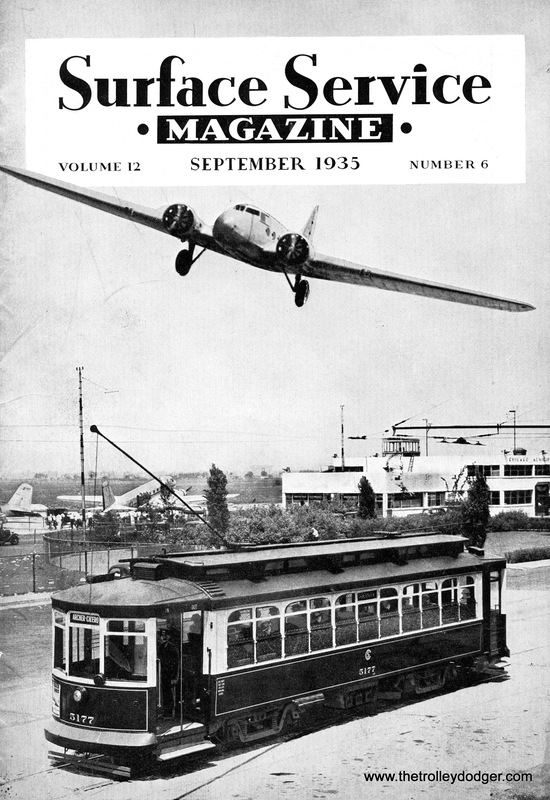 I am sure our readers will appreciate this important bit of history on what was a very serious tragedy. 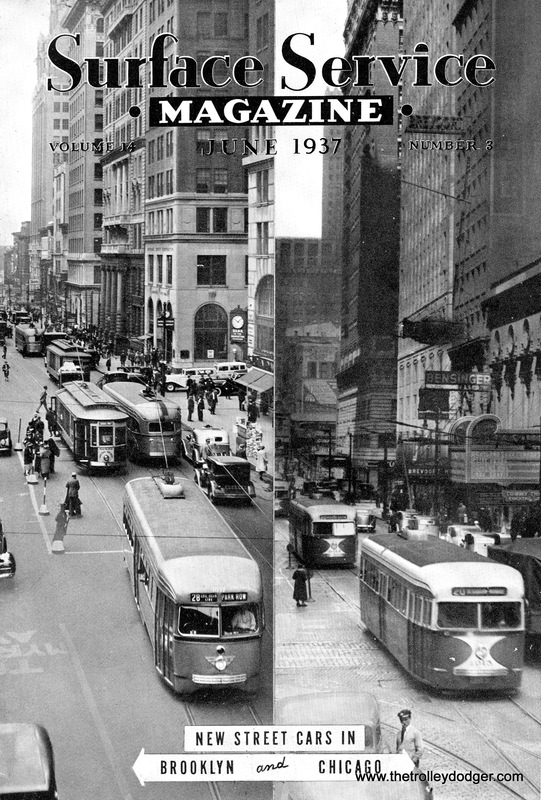 One thing that has puzzled me for a long time is why the CTA was so anti-streetcar. 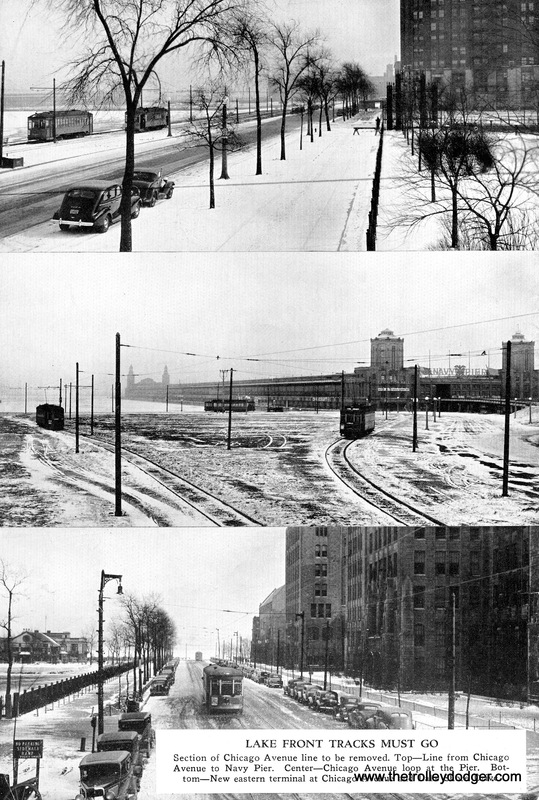 It seems to me that they would have wanted to keep the PCC’s running on at least the 22-Clark-Wentworth, the 36-Broadway-State and the 49-Western Ave. Weren’t those 3 lines some of the busiest crosstown streetcar routes? 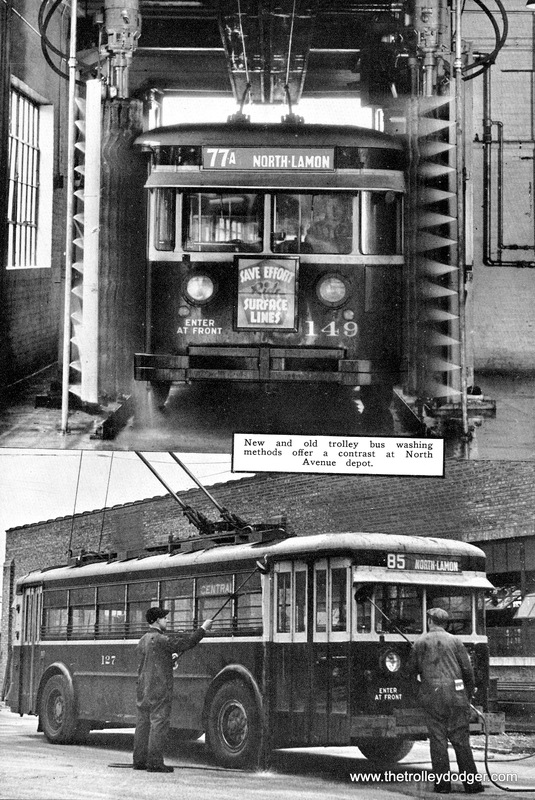 It’s always seemed to me, not knowing much more than the basics about the CSL and CTA that it appeared to be terribly wasteful to junk all of those mostly new St. Louis Car PCC’s. 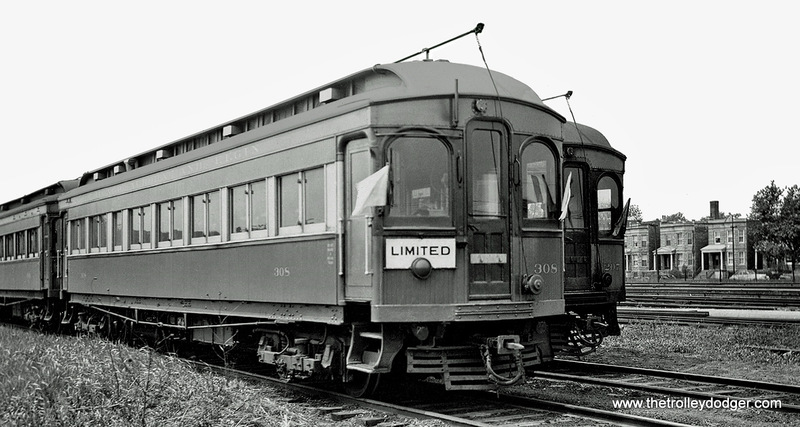 Yes, I know that a lot of parts went into the 6000 series “L” cars but did they really recoup their investment? I know there have been books written about the CSL but has anyone ever thought about writing a comprehensive history of it say for CERA? Dave Stanley told me that when CTA acquired CSL it was broke. Was the CRT in any better shape, financially? 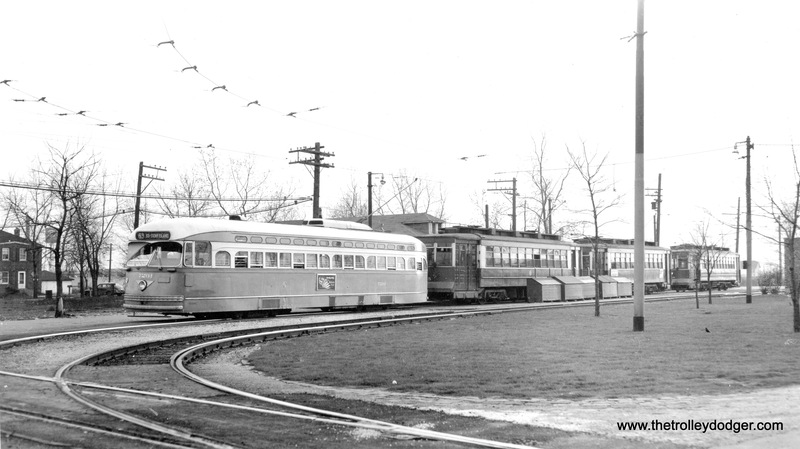 In a way it’s too bad the CTA wasn’t selling off the PCC’s in 1949.Both the Waukesha and Hales Corners lines had turning loops so their being single ended would not have been a problem though whether Maeder could have afforded them, I have serious doubts. 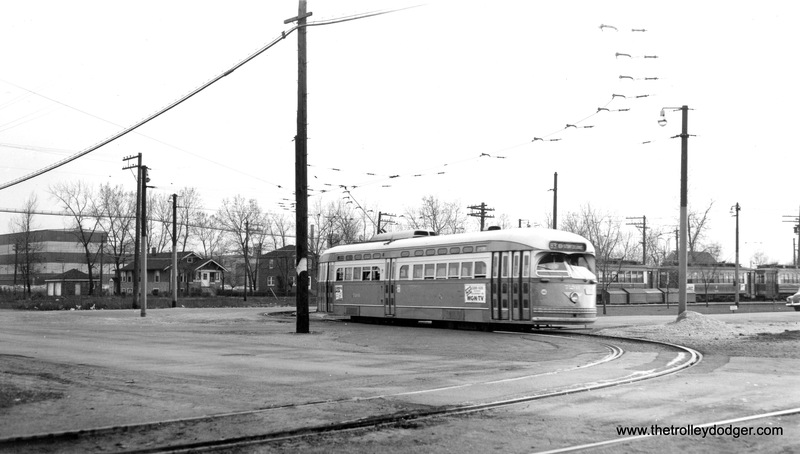 TM did not have turning loops on any of the streetcar lines and that is part of the reason S.B. 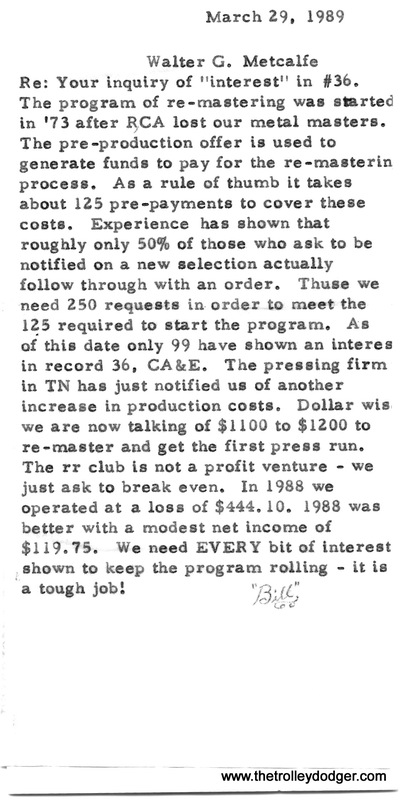 Way was not interested in buying PCC’s for Milwaukee. It would have meant constructing loops at the ends of the car lines or buying double ended PCC’s. I know of only 2 systems that had double ended PCC’s; PE and Dallas. 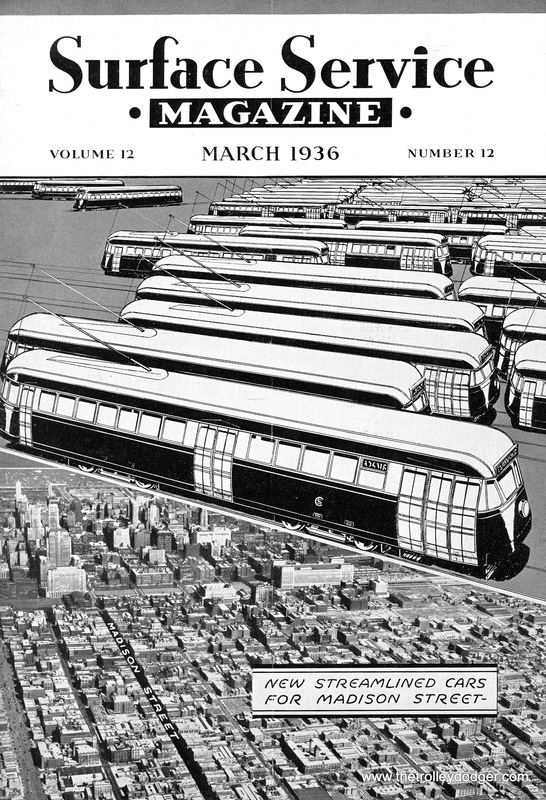 Of course by the time the first PCC’s rolled off the production line for the Brooklyn & Queens, TM had pretty much turned its back on streetcars in favor of trolleybuses. 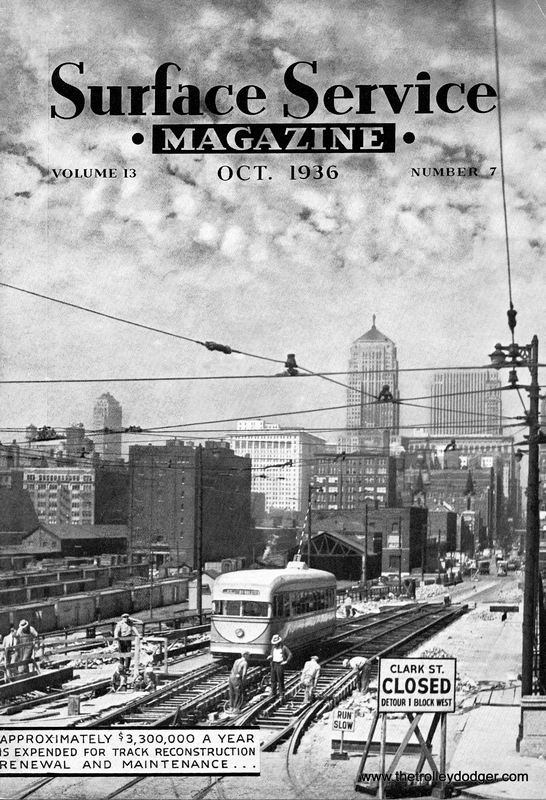 The Chicago Transit Authority purchased the Surface Lines in 1947 for $75m. However, the CSL had $30m in cash on hand in a renewal account, so the actual amount spent was only $45m. 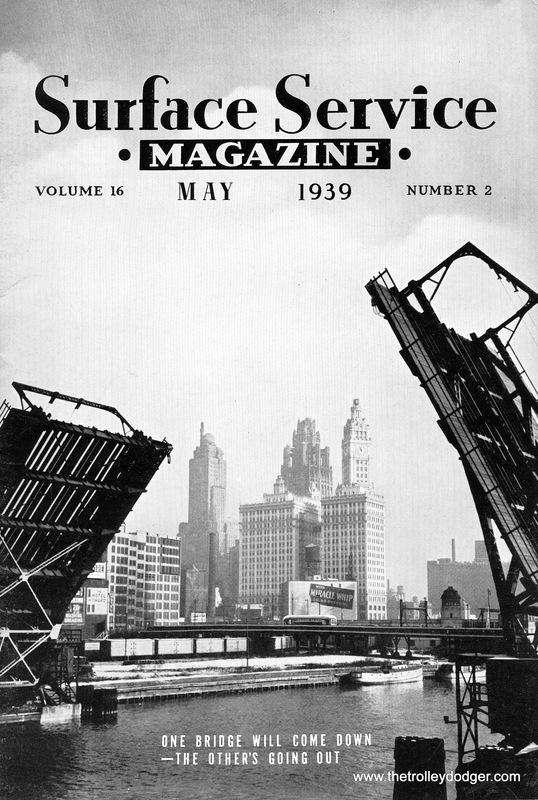 While the underlying companies behind the CSL facade were bankrupt, this was more of a technical bankruptcy, a situation that the City of Chicago wanted to maintain since they had by the mid-1940s decided that municipal ownership was the only way forward. 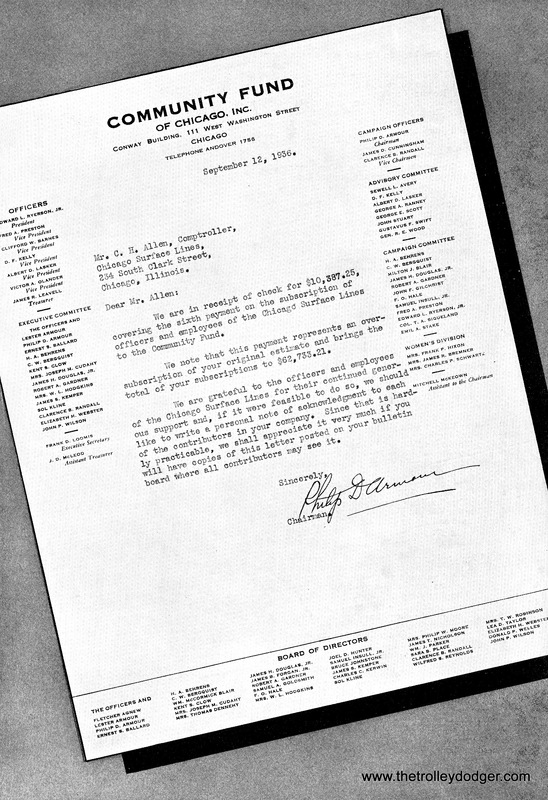 Otherwise, contemporary accounts indicate that CSL could have emerged from bankruptcy during WWII. 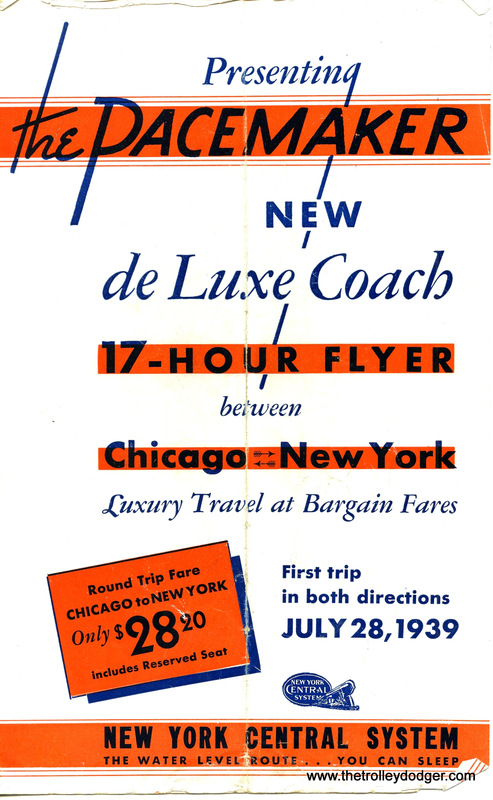 CSL could have done better, except that its fares were being kept artificially low by the Illinois Commerce Commission. 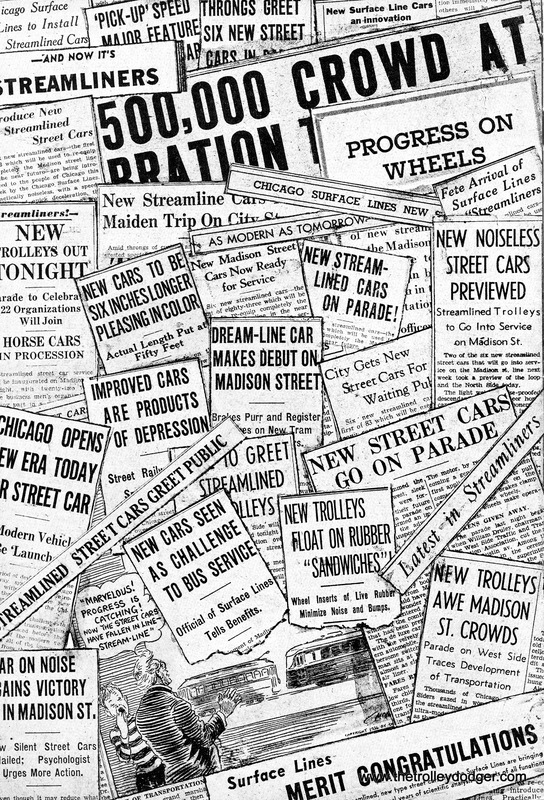 When the CTA took over, there were numerous fare increases in its first decade of operation since the agency had the power to set its own rates. 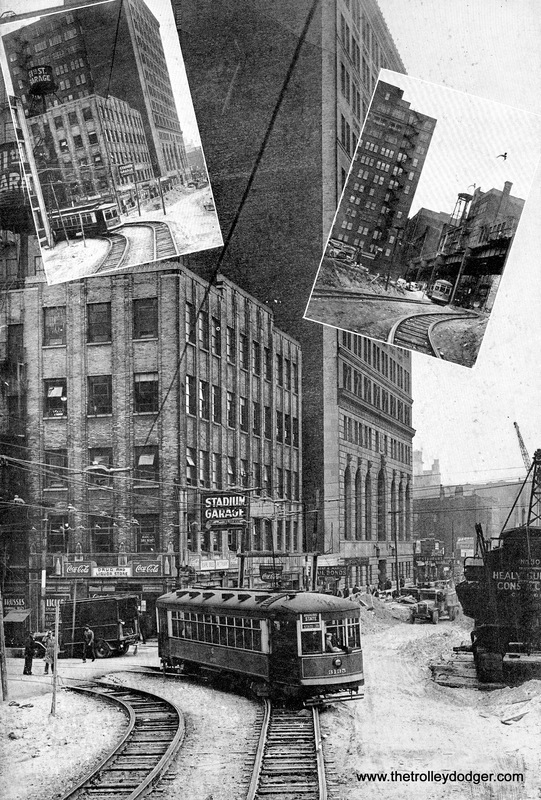 By contrast, the Chicago Rapid Transit Company was a financial basket case that could barely pay its bills. 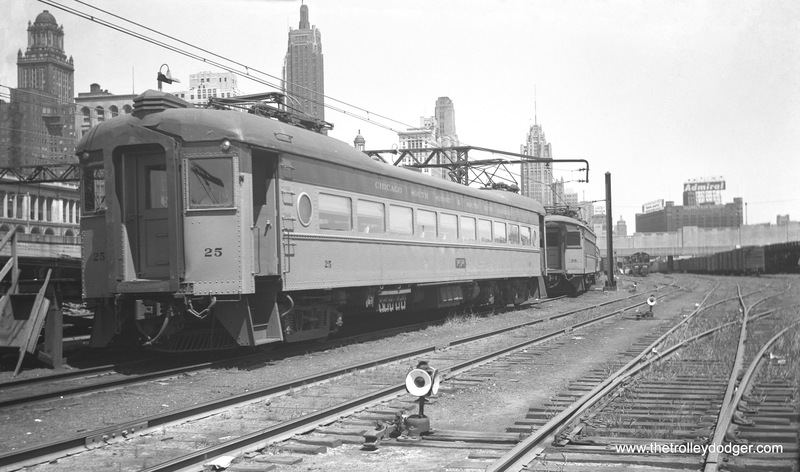 During the transition to CTA ownership between 1945 and 1947, the most that CRT could spend for new railcars was $100k, while the Surface Lines had millions on hand for such purchases. CRT ordered four articulated sets while CSL ordered the 600 postwar PCCs plus other buses. 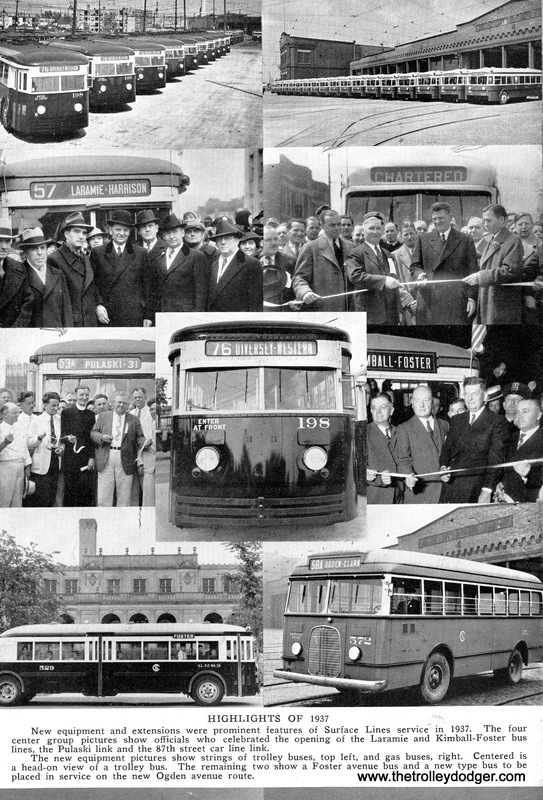 CSL was very much a pro-streetcar operator, but in the years prior to 1947, had been expanding service using motor buses and trolley buses, including some initial conversions of lightly-used streetcar routes to bus. 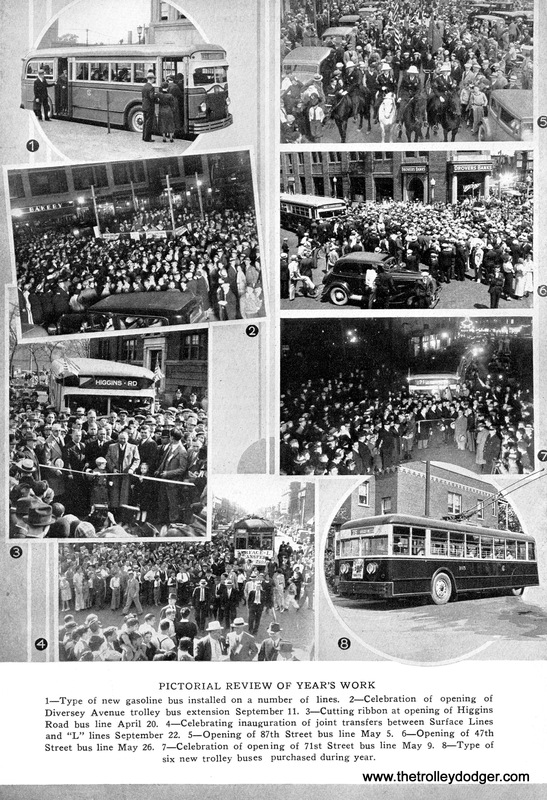 The City of Chicago commissioned a transportation study in 1937 that suggested replacing half the trolleys with buses. 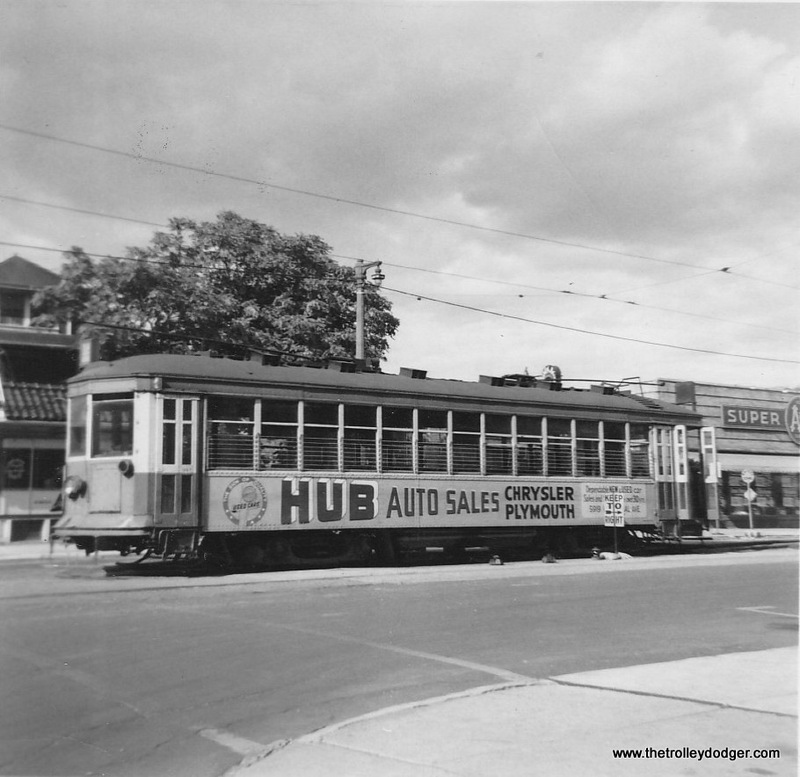 This still would have meant purchasing 1500 new streetcars. 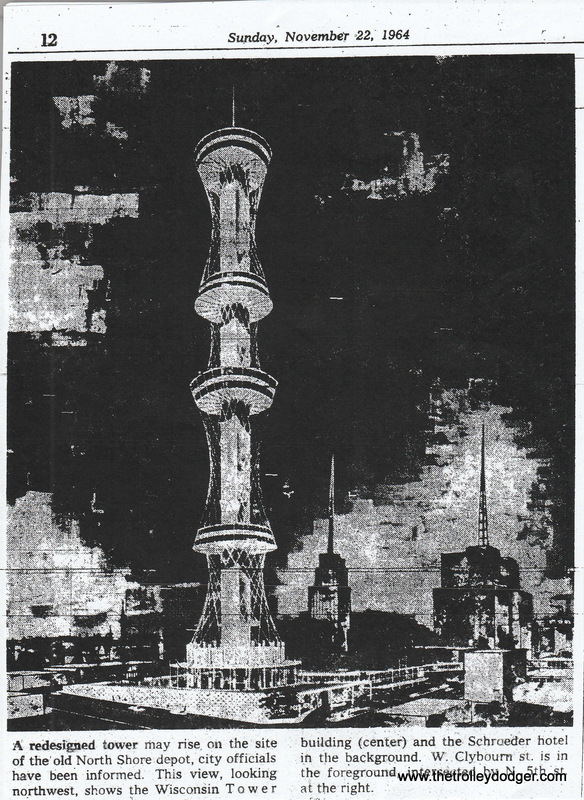 As the years went on, this amount kept being decreased in the plans, from 1500 to 1000 to 800, and ultimately it became 600. 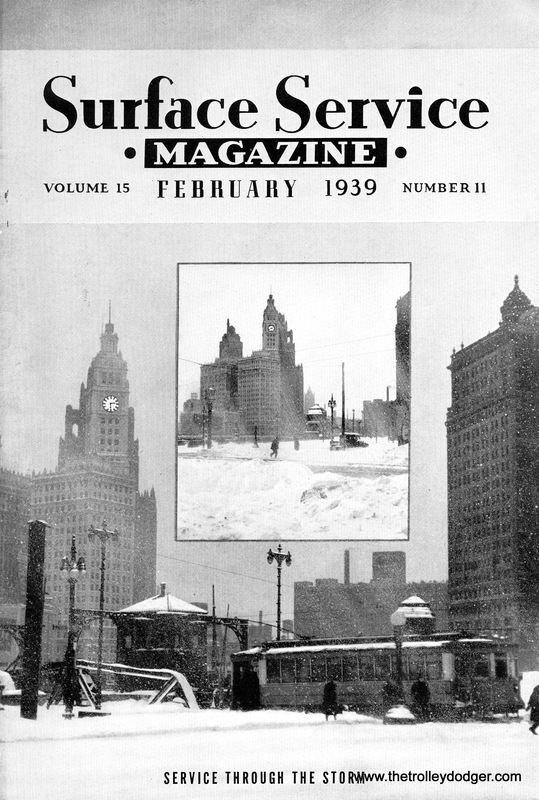 While the CTA still planned to order an additional 200 PCCs in their 10-Year Plan, published in 1947, this did not come to pass, and the first general manager of CTA, Walter J. McCarter, was hired in part because of his success in “rubberizing” the Cleveland streetcar system. 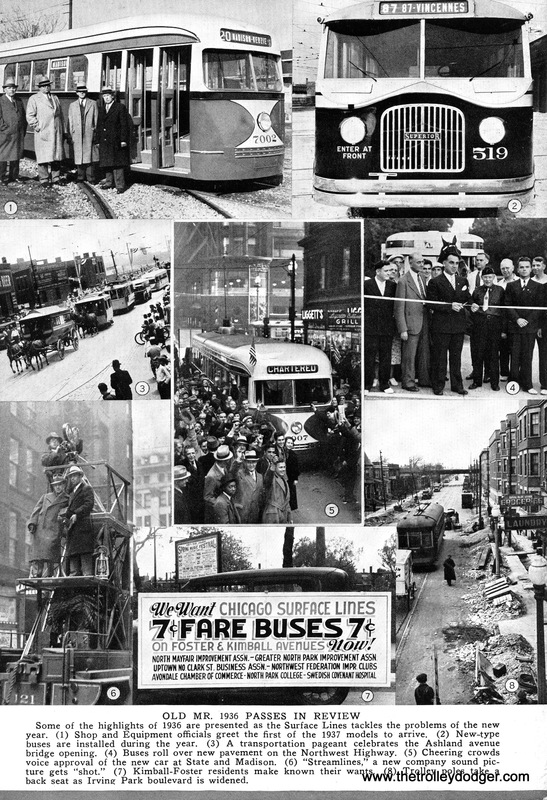 So, while CSL was pro-streetcar, increasingly the City of Chicago was pro-bus, and when municipal ownership came to be, the new CTA reflected the attitudes of the City. 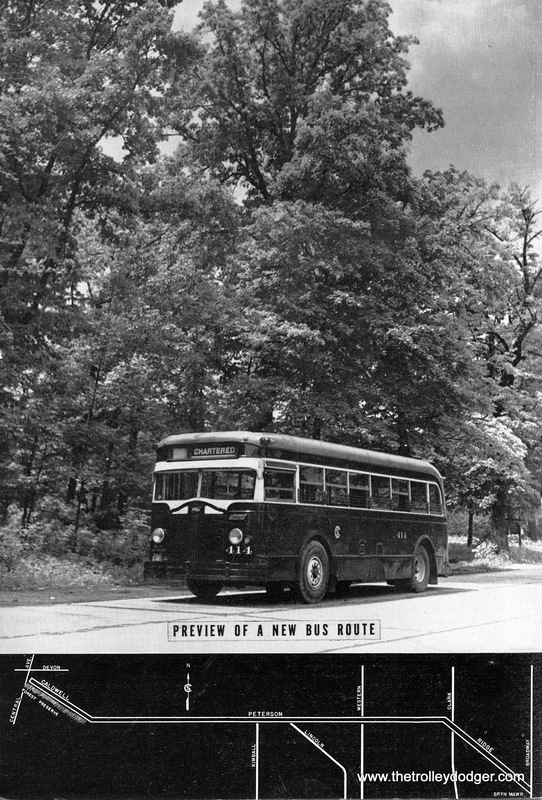 The war had put off some bus substitutions and equipment purchases, so there was a backlog of conversions in the pipeline by that time. 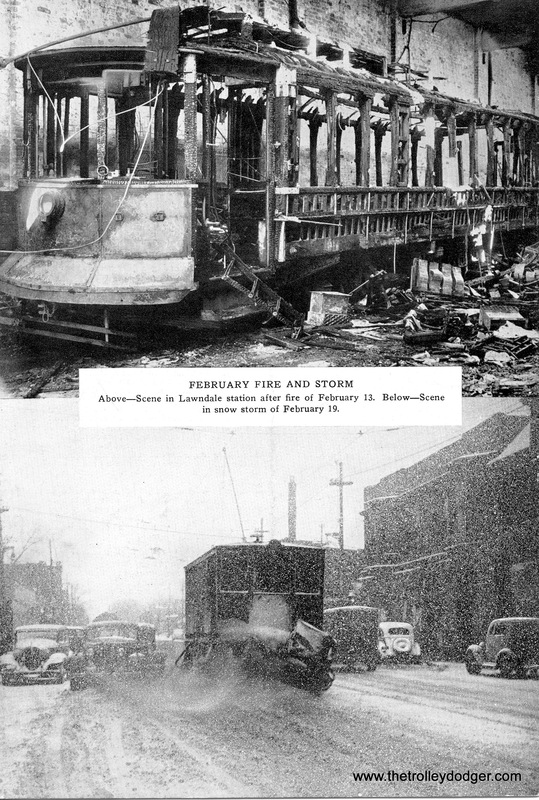 This led to a more rapid switch from streetcar to bus than might have been the case otherwise. 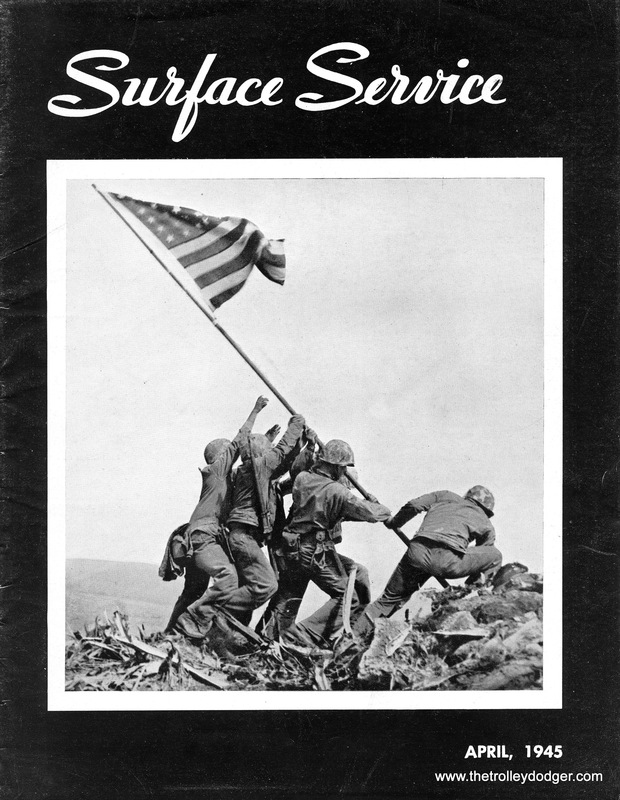 The difficulty in abandoning lightly-used lines also worked against CSL, and to some extent CSL and CRT competed with each other. 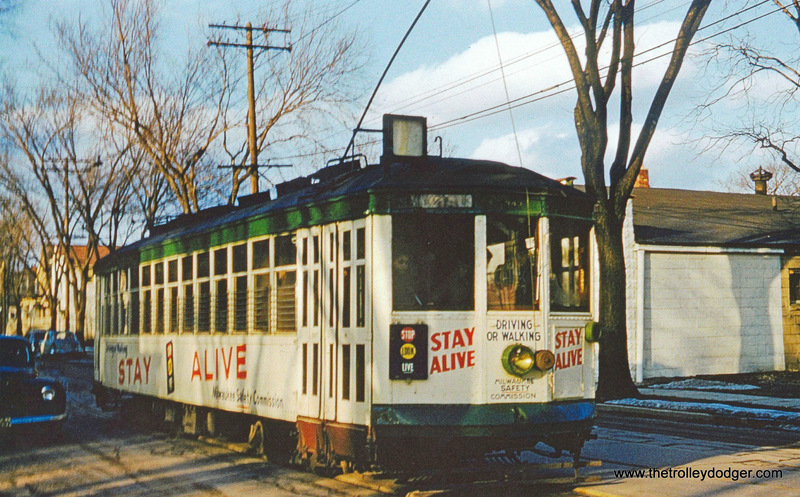 Once CTA took over, they could rationalize both systems to work better together. 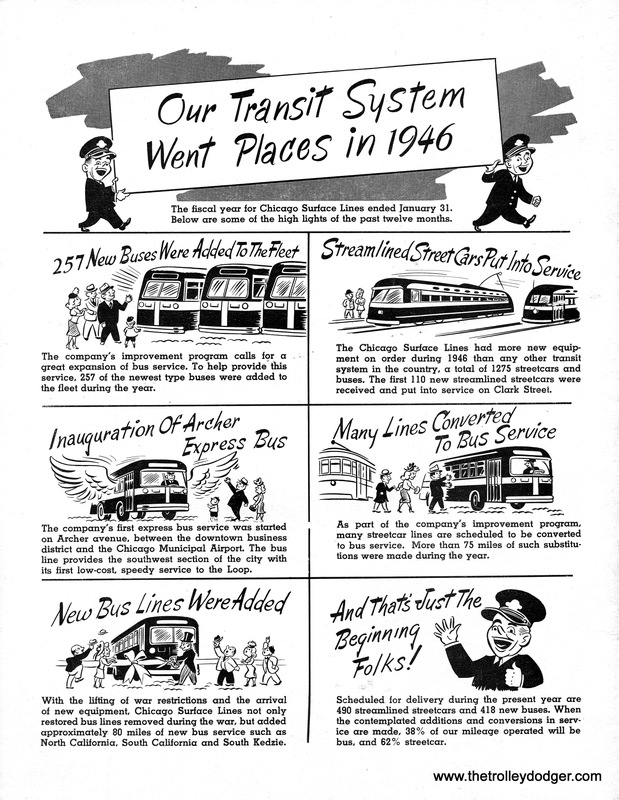 Still, even as late as 1949, CTA was at least considering purchasing 200 more PCCs, and retaining service on as many as 11 streetcar lines. 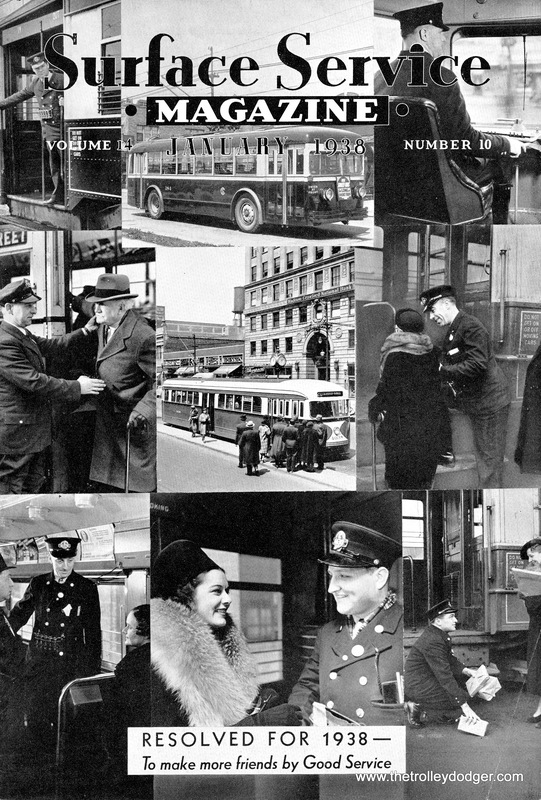 The 600 PCCs were brand new, and the 83 prewar cars plus the 100 Sedans could have provided good service for many years to come. Around that time, however, a number of factors were already at work against the surface system in general. 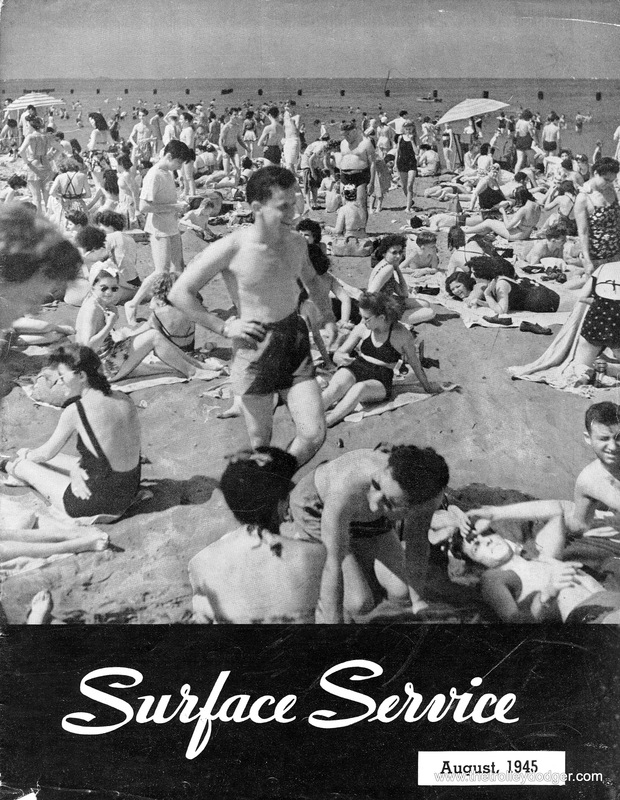 First, along with increased car ownership and frequent fare increases, there was a serious drop-off in surface system ridership, to the point where it was eventually decided that buses could do the job. 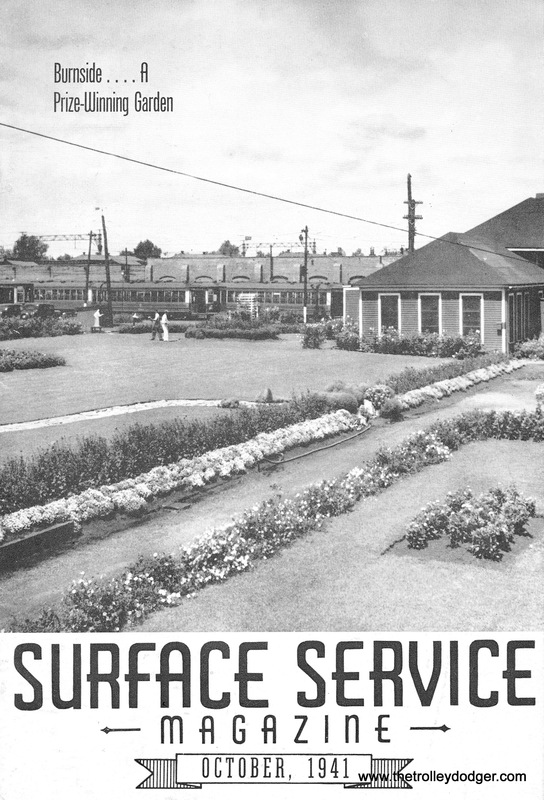 Second, the CTA changed its method of accounting, allocating a portion of surface system revenue to the rapid transit. 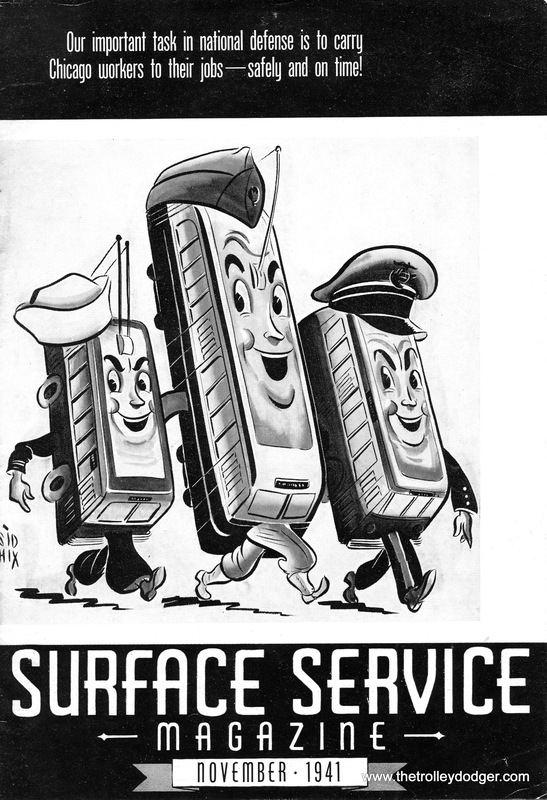 This meant that some service that were once considered profitable were suddenly seen as unprofitable. One thing that CTA did almost immediately was work to reduce their labor costs by eliminating as many employees as possible. 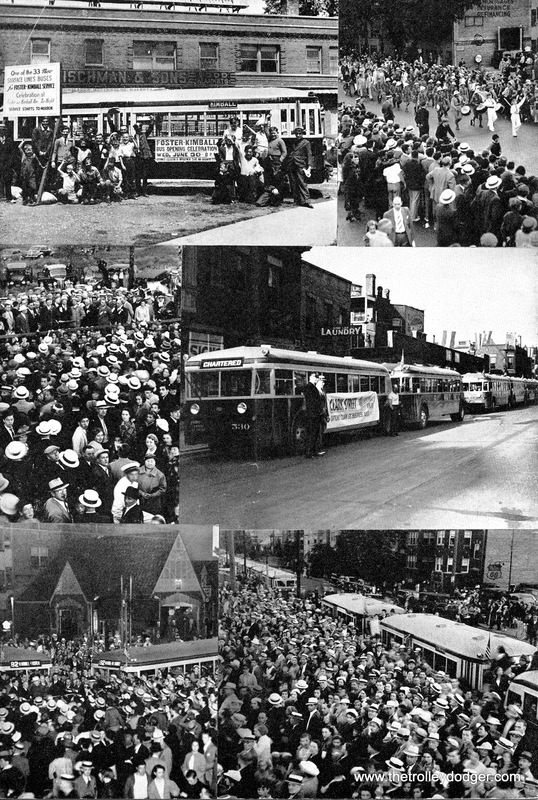 This became even more important in the inflationary postwar period as unionized workers demanded better pay and benefits. 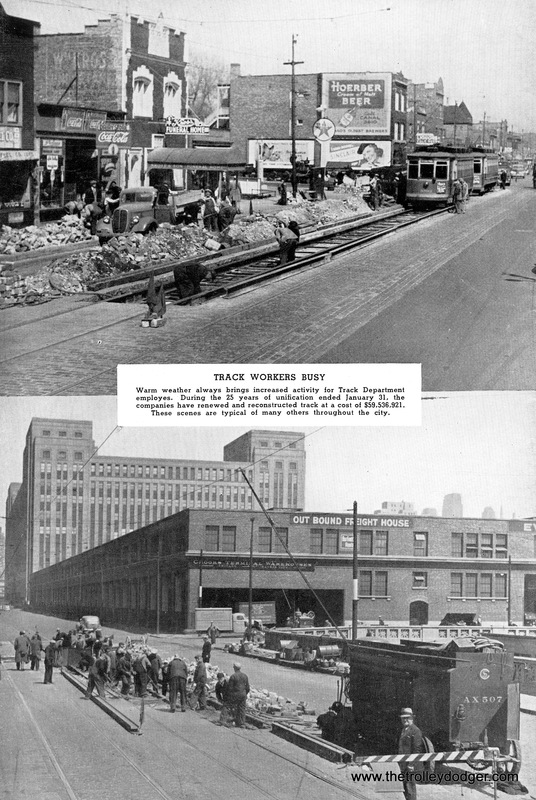 CTA had a chronic manpower shortage and was thus in a weak position to hold the line. 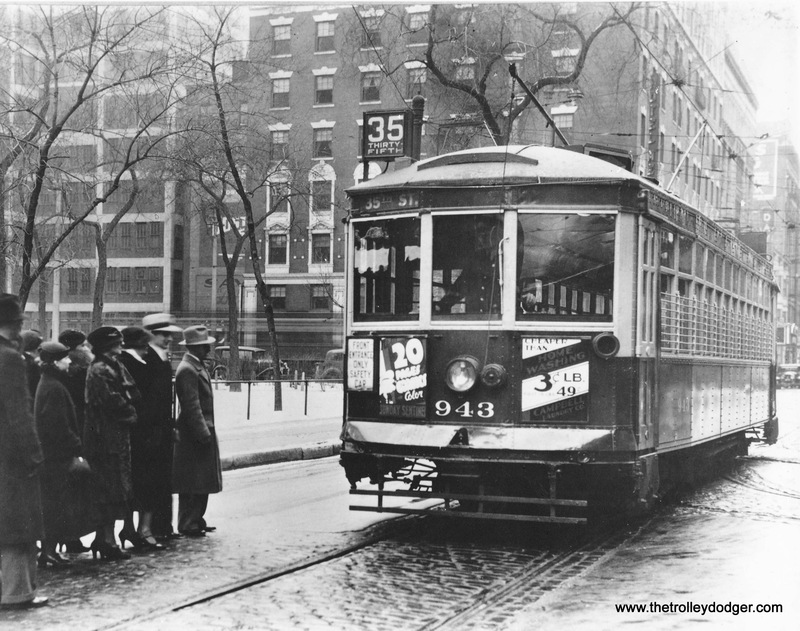 Since most streetcars were two-man, they were easy targets for substitution by one-man buses. 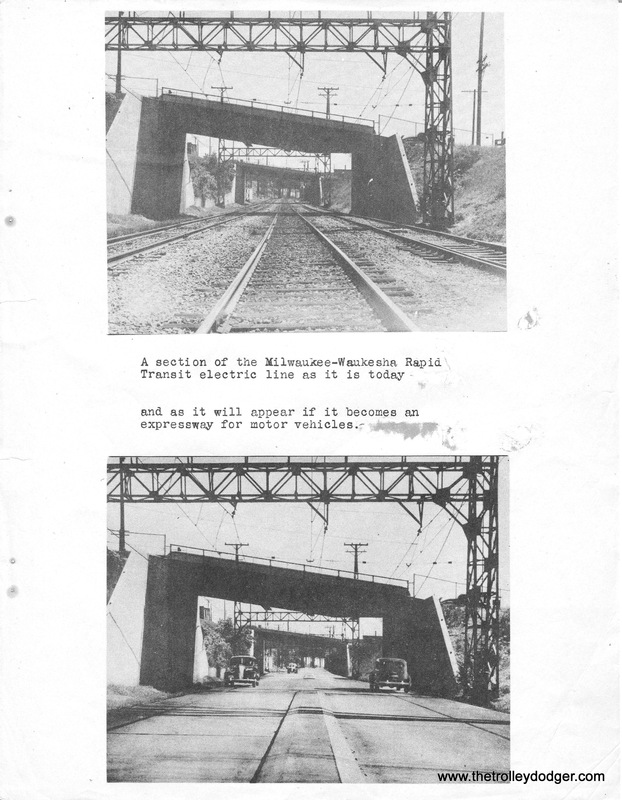 A 1951 consultant’s report proposed that CTA retain the PCCs, convert them to one-man, and stop purchasing electric vehicles for the surface system due to the supposedly high cost of electric power purchased from Commonwealth Edison. 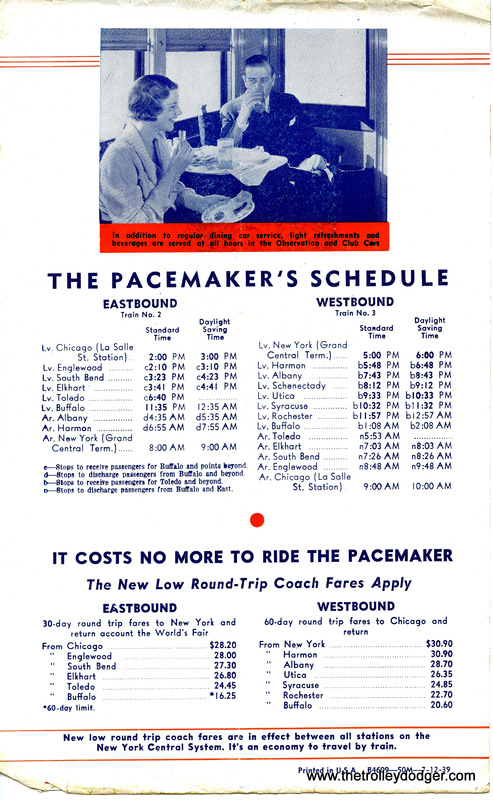 By the 1950s, CTA had become convinced that maintaining ridership was a matter of providing faster service. 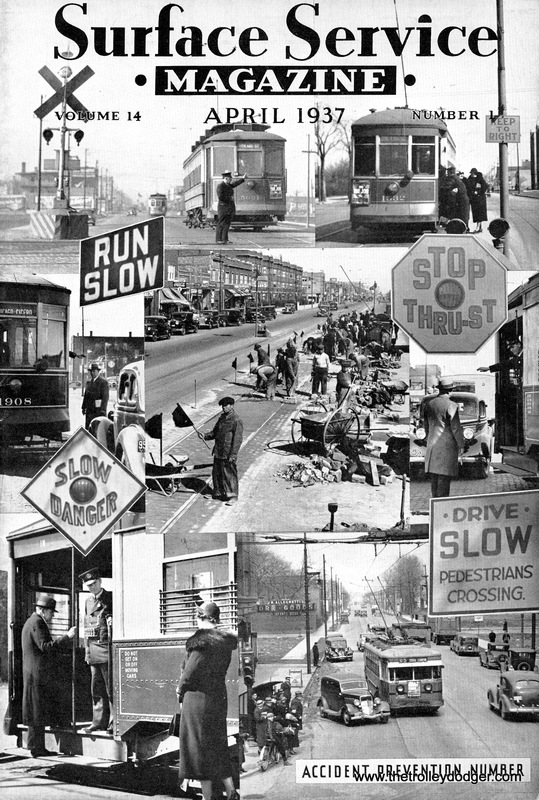 Faster service could not easily be provided on city streets, with increasing competition from cars and trucks, but there were ways to speed up service on the rapid transit system. 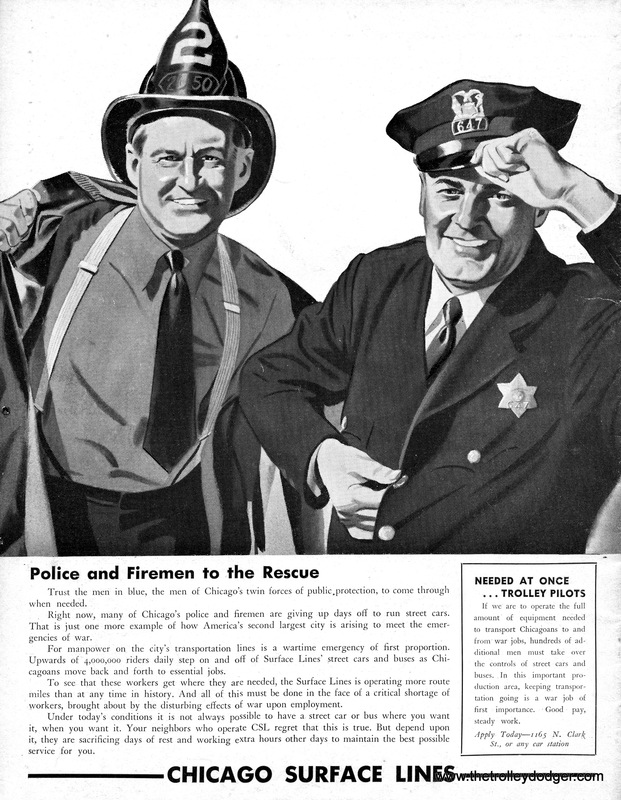 The so-called PCC Conversion Program was mainly public relations. 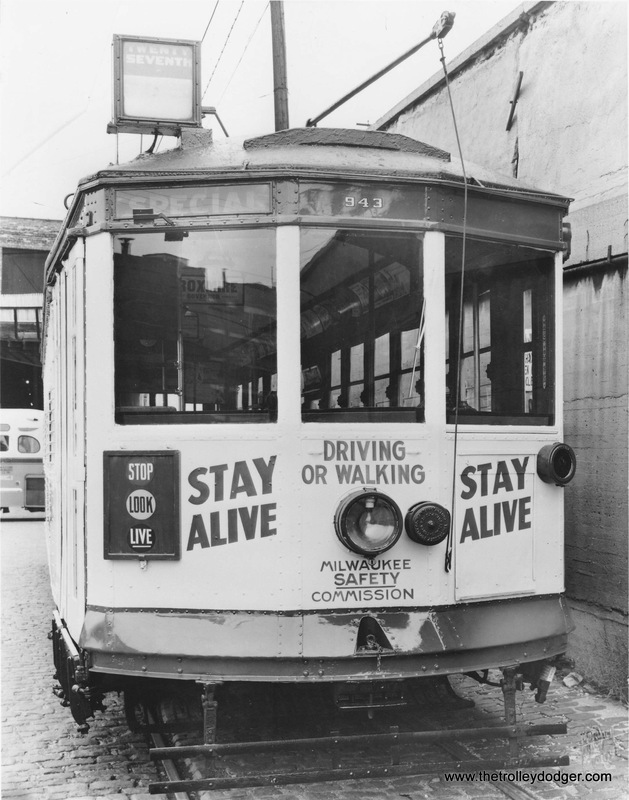 The CTA had decided it no longer wanted to operate streetcars, yet had 600 that were just a few years old, with an expected 20-year life and attendant depreciation. The main purpose of the program was to take these cars off the books in a way that would not show a loss on paper. 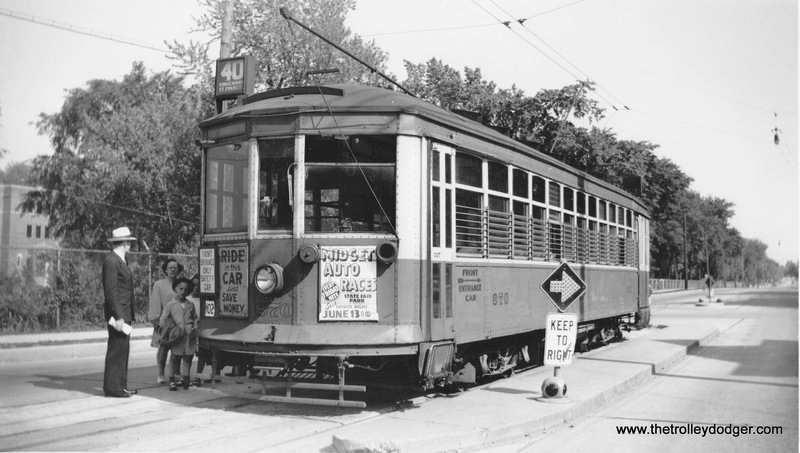 While frequent claims were made that supposedly the program was yielding $20,000 or more per streetcar, CTA actually received $11,000 for each of the 570 cars sold to St. Louis Car Company. In addition, there were thousands of dollars in additional costs involved with adapting and reconditioning parts. 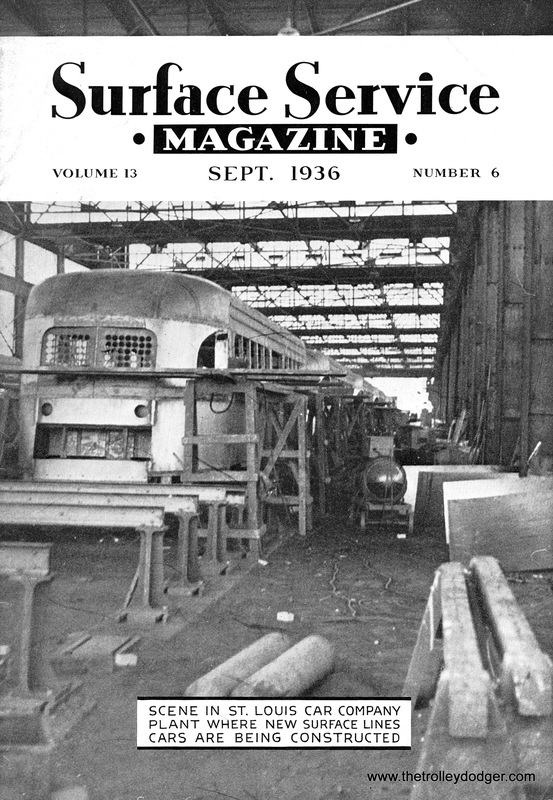 Over the five years or so of the program, the amount of costs increased, to the point where, by 1958, CTA admitted it was receiving no more than scrap value for each PCC sold. 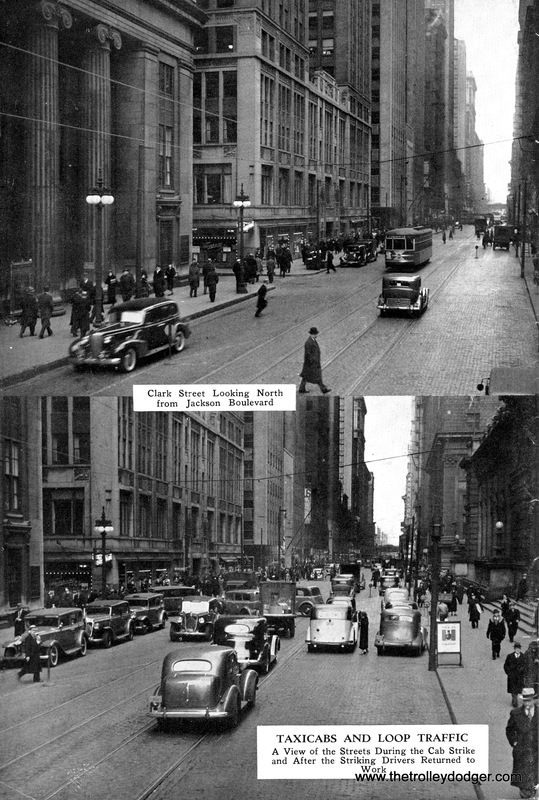 But since these were non-standard cars, there was no market for reselling them to another city. 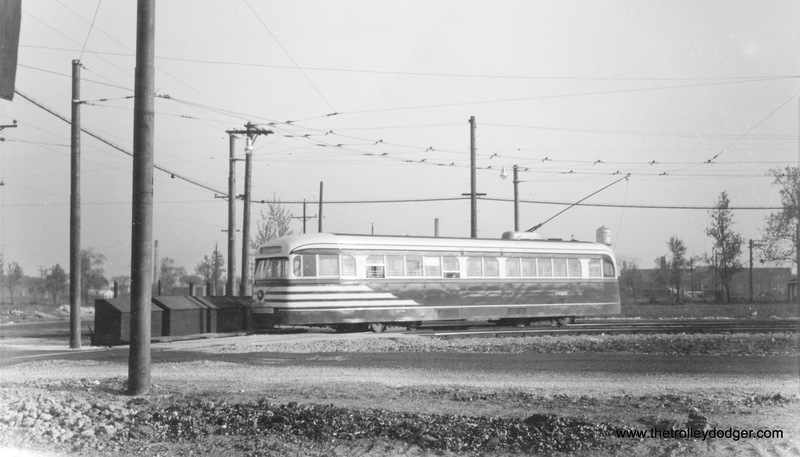 The Conversion Program only made sense if you believed that PCC streetcars, which were state-of-the-art and just a few years old, had absolutely no future value as transit vehicles, even though the 1951 consultant report indicated that the tracks and wire were in good shape and were worth keeping. 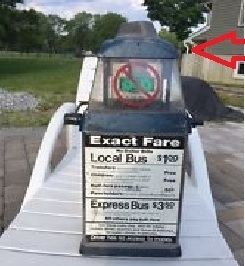 The consultant thought that the cost of replacing the service with bus was more than the cost of keeping what they had. 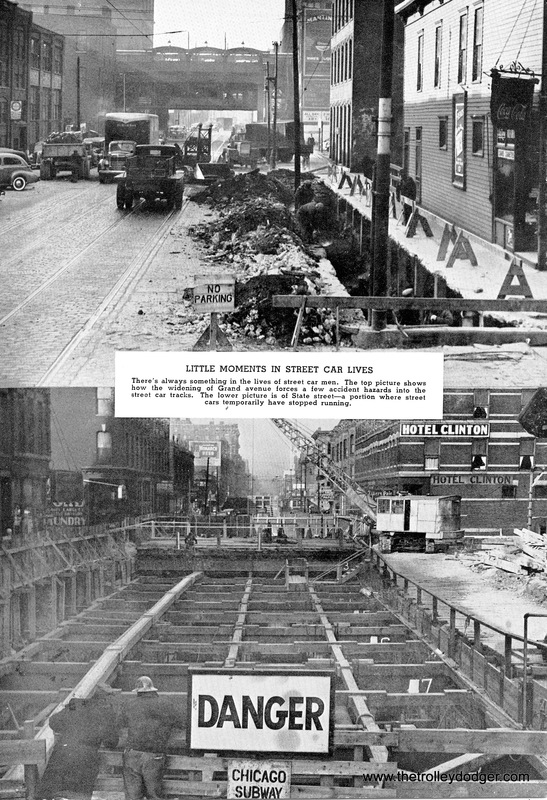 CRT was in such bad shape that within a few short years, CTA decided to devote 70% of its investments in upgrading it, even though in 1947 it only had a market share of less than 20% of local ridership. 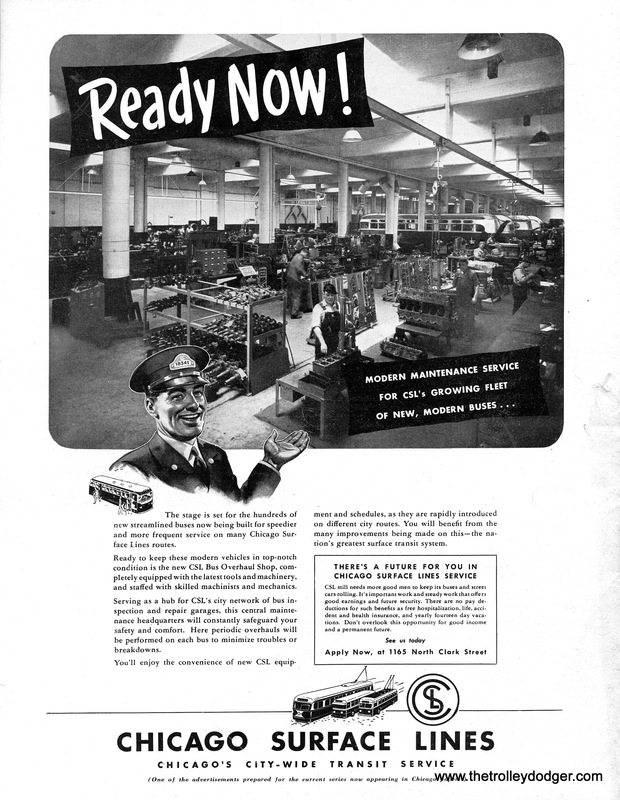 As a consequence, some might argue that the surface system got the “short end of the stick,” especially after October 1, 1952 when CTA purchased the assets of the competing Chicago Motor Coach Company. 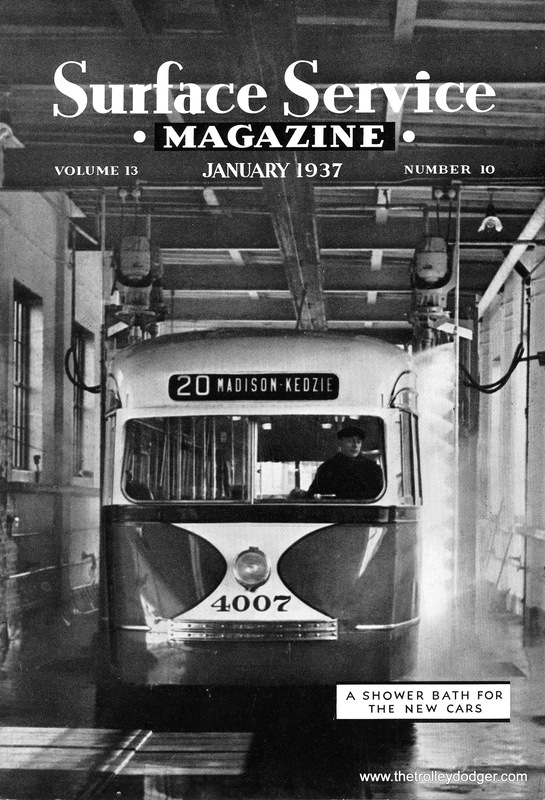 Perhaps not coincidentally, this was also the date when the CTA, having eliminated its last remaining competitor, announced the Conversion Program that spelled the end of streetcars in Chicago. 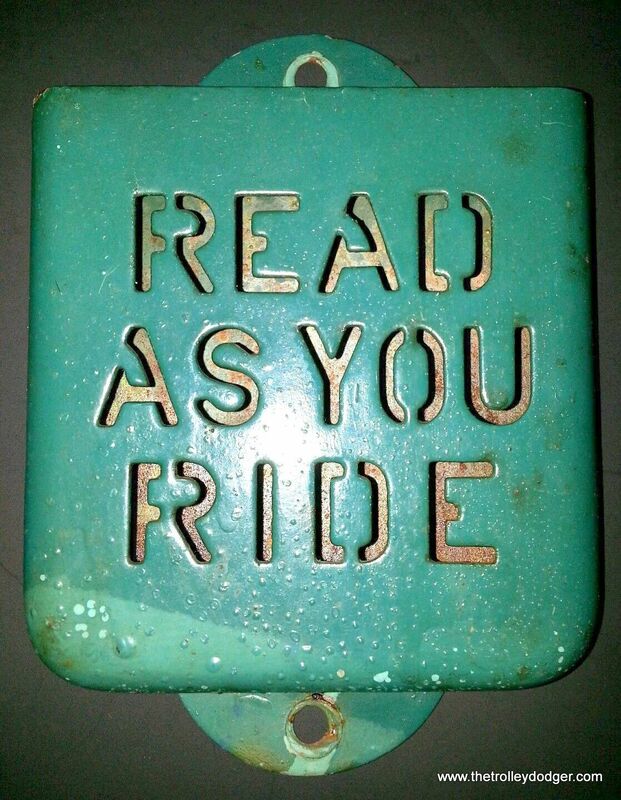 It was no longer necessary to offer a “premium service” that could compete with CMC for riders. 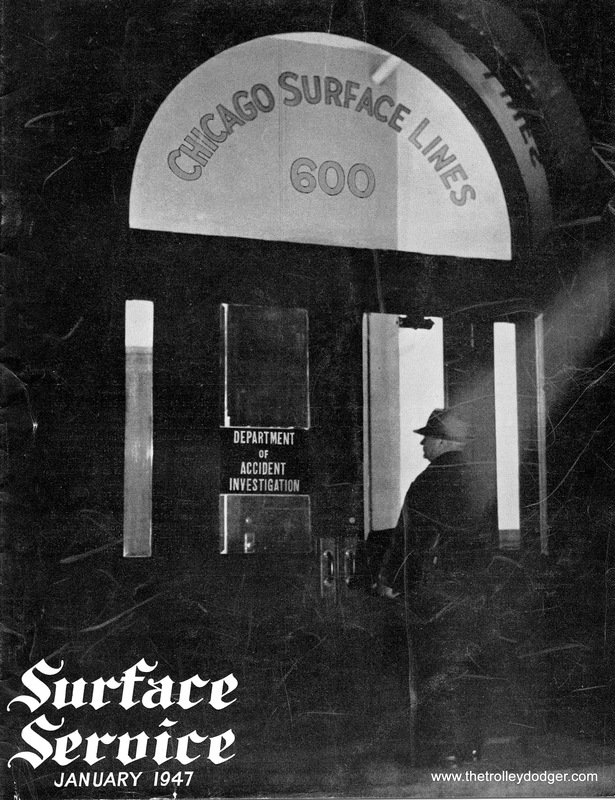 As for a history of CSL, it would be hard for anyone to better the Chicago Surface Lines book by Alan R. Lind, especially the third edition published in 1979. 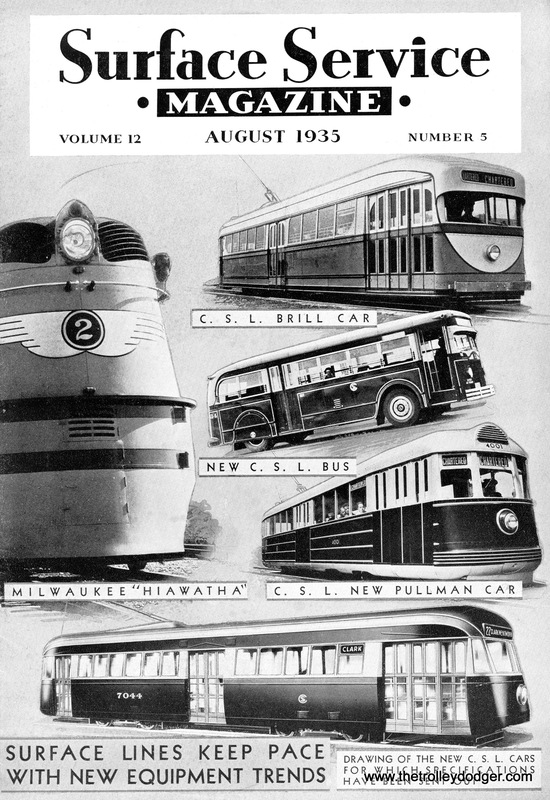 The subject is of sufficient complexity to demand a series of books, of which Chicago Streetcar Pictorial: The PCC Car Era, 1936-1958 (published as Bulletin 146 of the Central Electric Railfans’ Association in 2015), at 448 pages, including several hundred photos in color, forms an important part. I am proud to have been a co-author of that book. 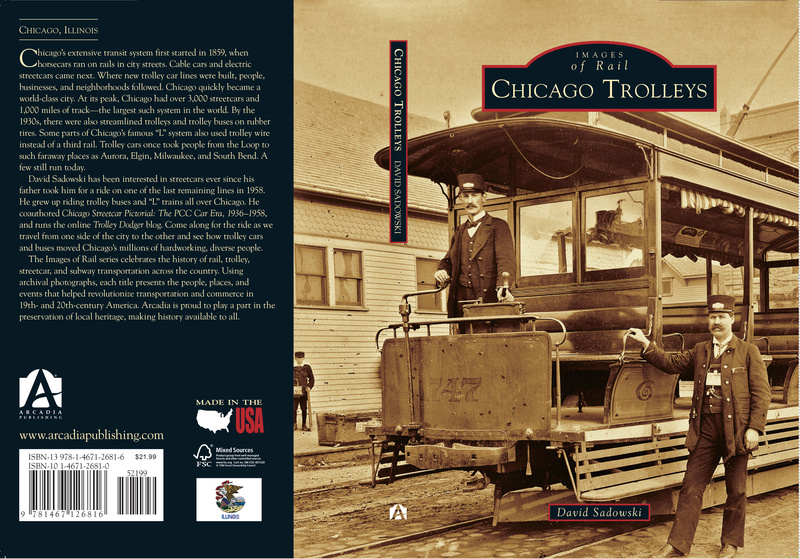 My upcoming book Chicago Trolleys, although a much more modest 128 pages, will be another addition to that field. 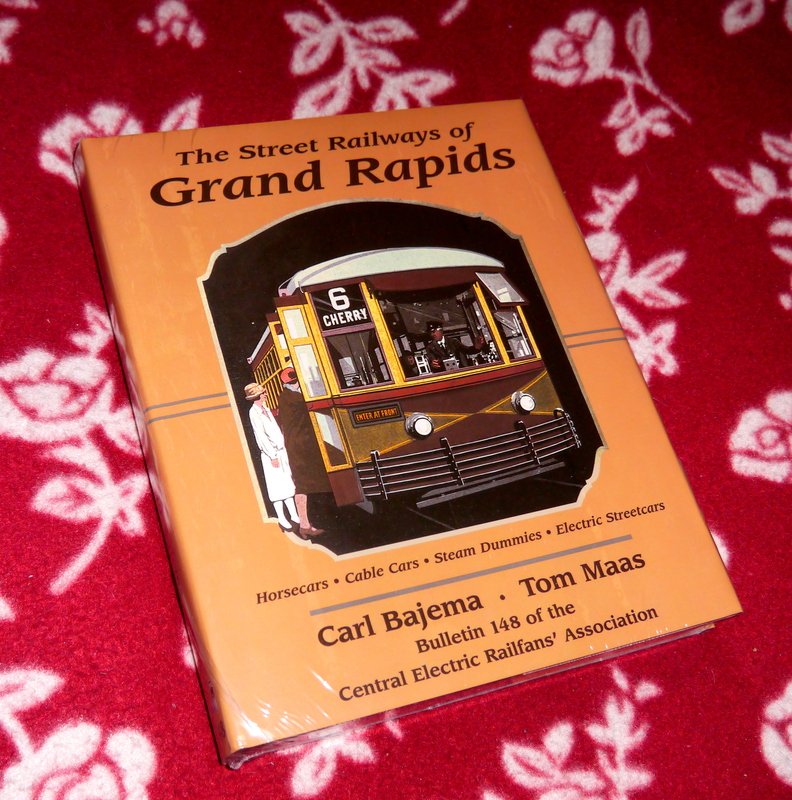 This is our 190th post, and we are gradually creating a body of work and an online resource for the benefit of all railfans, everywhere. 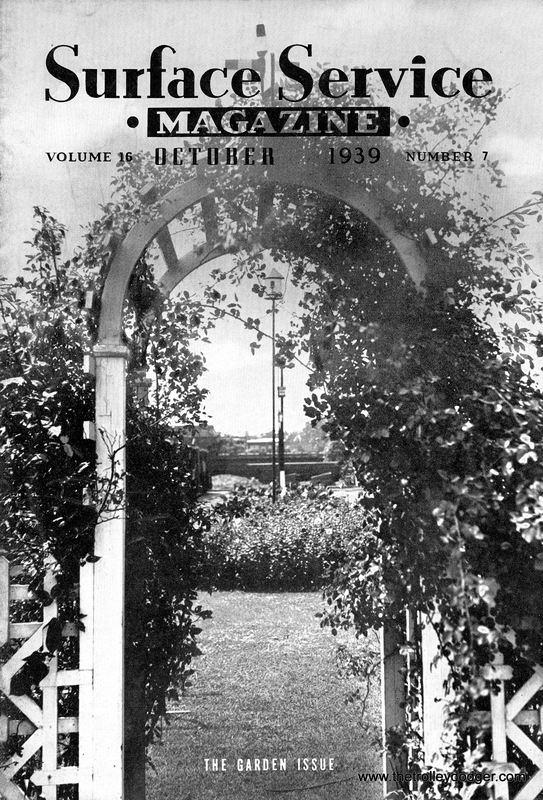 To date, we have received over 307,000 page views, for which we are very grateful. 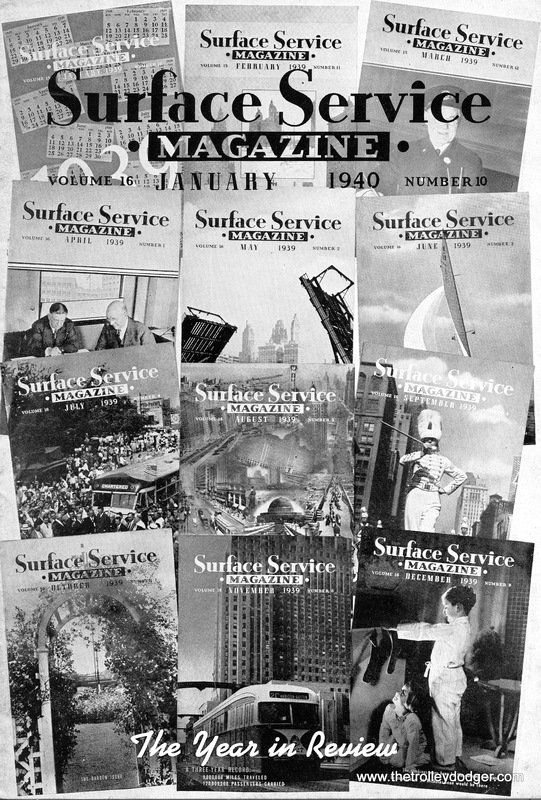 Surface Service is full of interesting tidbits of information on CSL operations. Many individual employees are mentioned, especially old-timers and retirees. 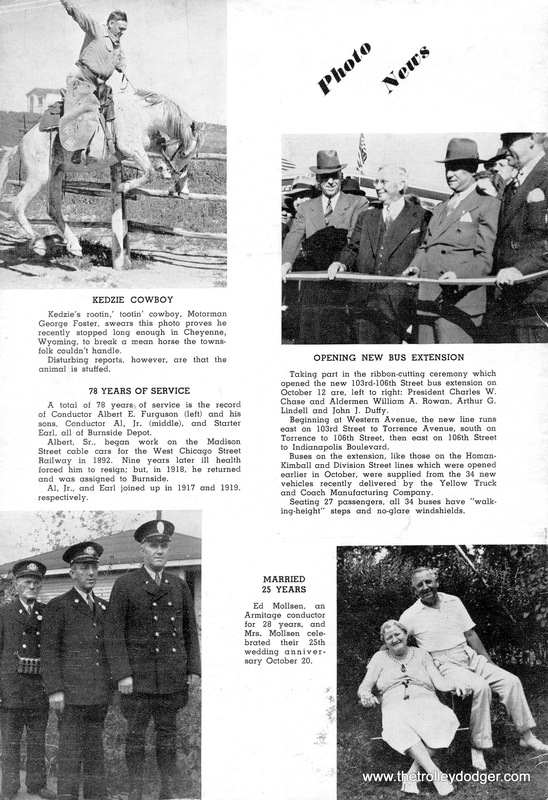 They frequently ran old photos sent in by current or former employees. 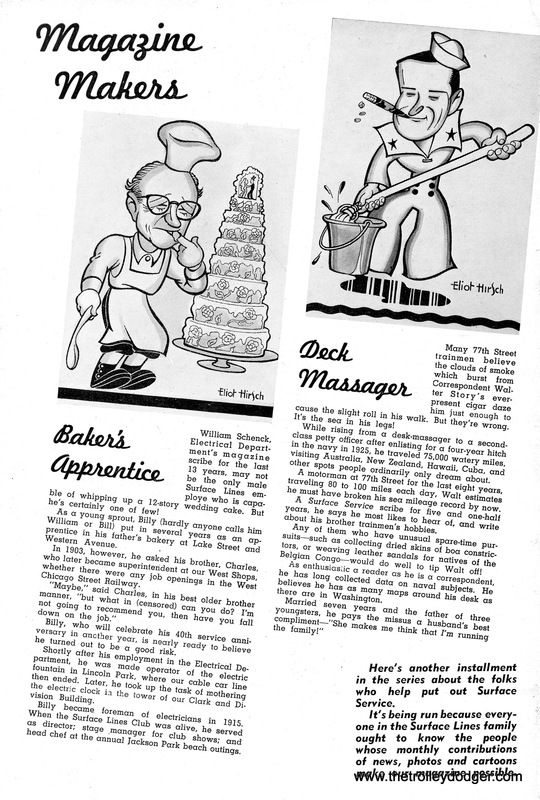 Back in CSL days, there was no mandatory retirement age, and some employees worked well into their 70s. 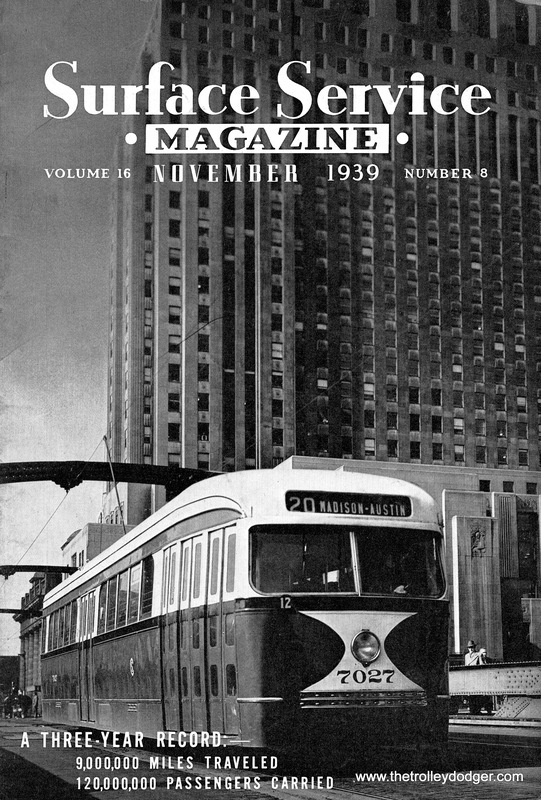 There are perhaps 700 pages of material in these 41 issues, and all this is being added to our E-book Chicago’s PCC Streetcars: The Rest of the Story, available in our Online Store. 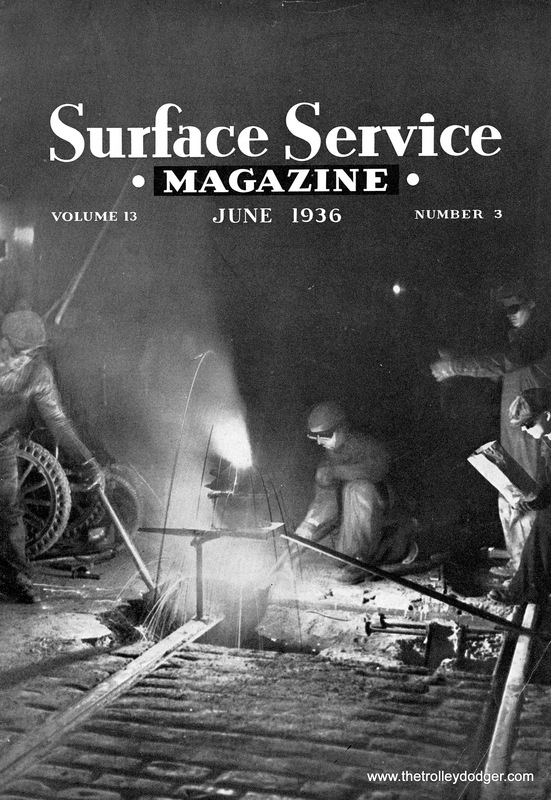 This joins 34 issues of Surface Service that we had previously scanned. 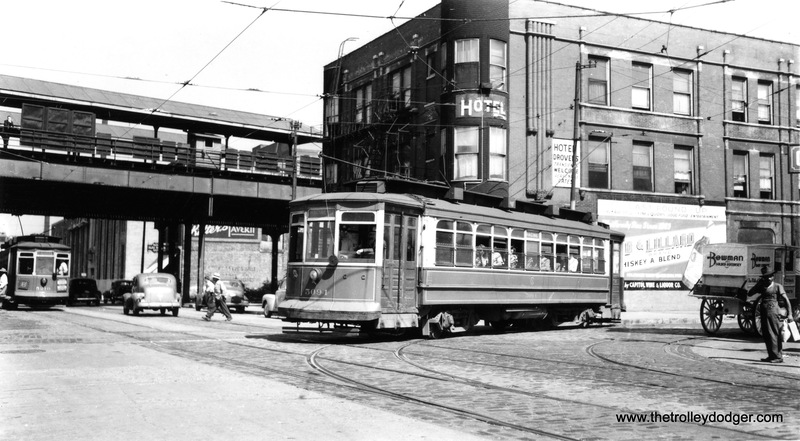 In addition, this post features more recent photo finds, and another great batch of classic Chicago Aurora & Elgin pictures courtesy of Jack Bejna. 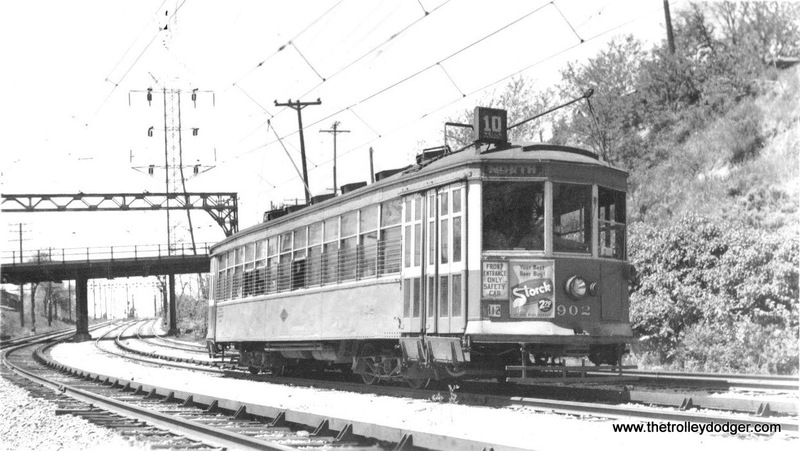 I would say this photo of prewar PCC 4047 was taken circa 1948, when the loop at 63rd Place and Narragansett was brand new. 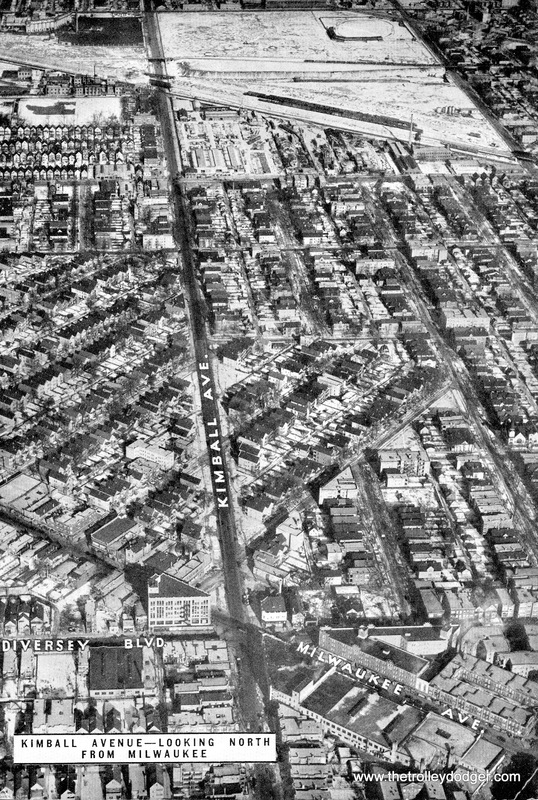 Formerly, double-ended cars ran to Oak Park Avenue a half-mile west of here. 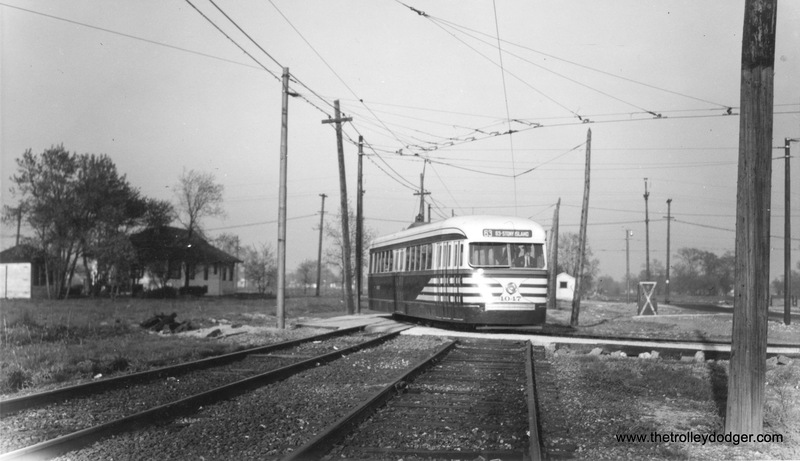 CTA 4019 is westbound on private right-of-way on 63rd Place, near the Narragansett loop. 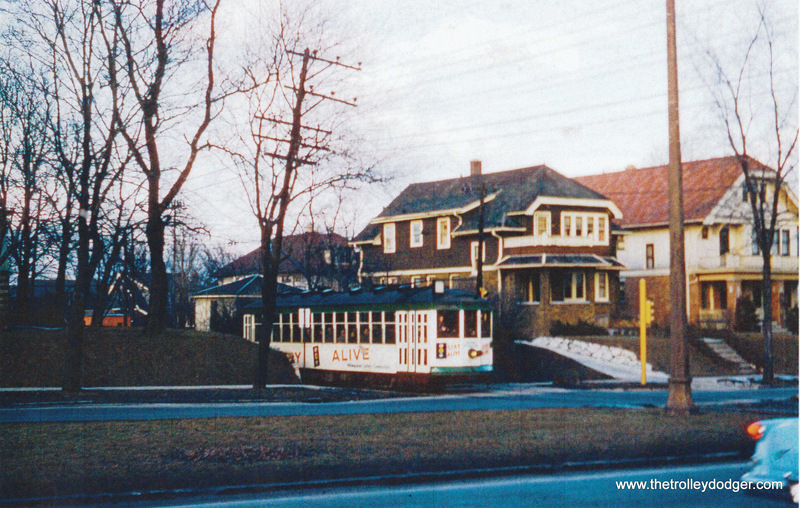 You would hardly recognize the location today, as it is in the middle of a quiet residential neighborhood. This prewar PCC, in “tiger stripes,” still has a CSL logo on it. CTA 4023 at 63rd and Narragansett. 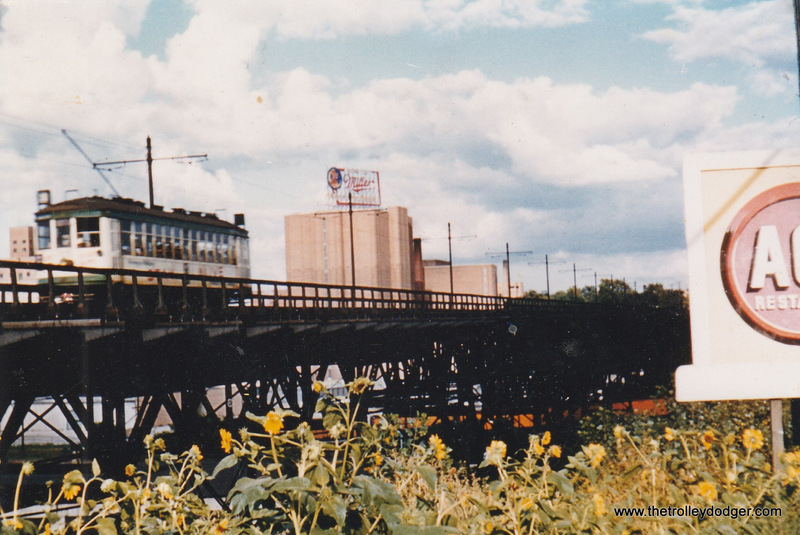 CTA postwar PCC 7261 at the west end of the 63rd Street line (63rd Place and Narragansett). 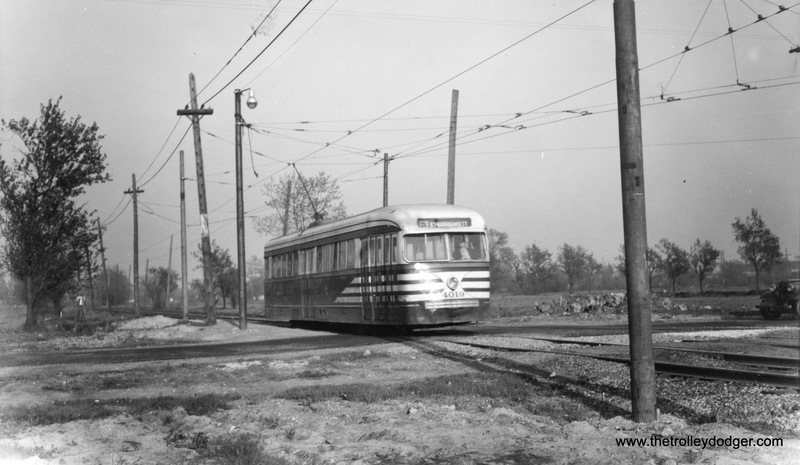 This picture (and the previous one) appears to have been taken in the latter days of streetcar service on 63rd. 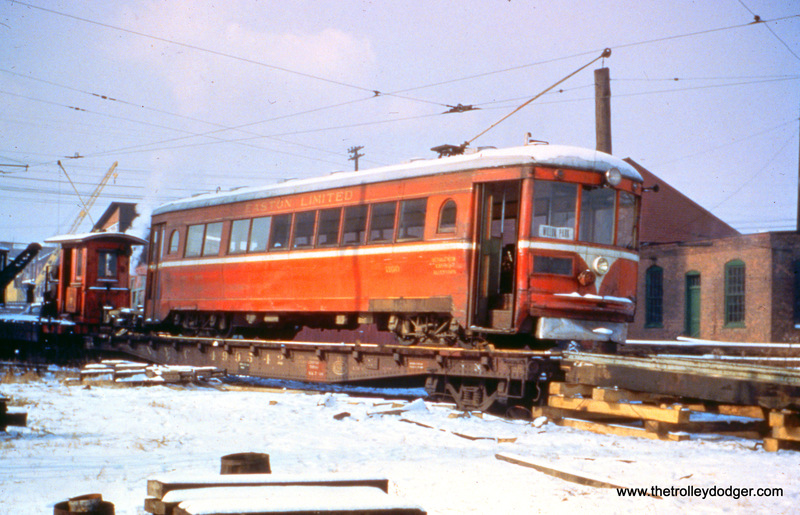 By then, most service was provided by red Pullmans, but some two-man postwar PCC cars were there too (such as 7261, seen here). 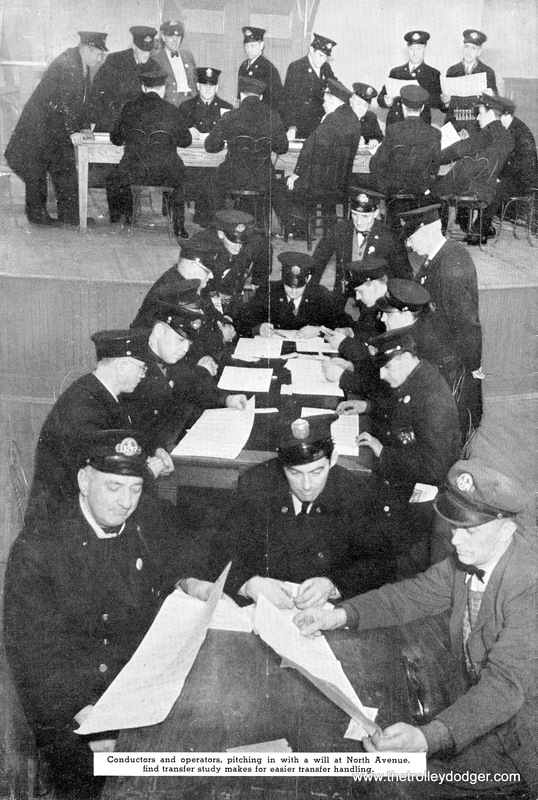 The prewar PCCs had by this time been converted to one-man and were moved over to Cottage Grove. 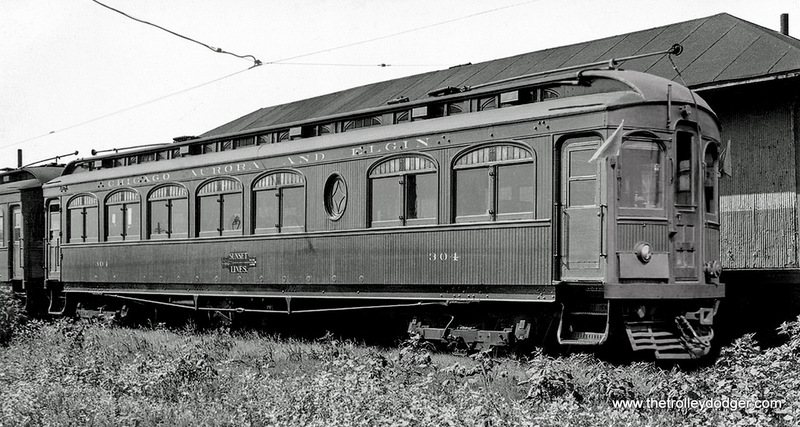 Here’s the latest, The Chicago Aurora & Elgin Railway ordered 10 cars to be built by the Niles Car Company in 1906, numbered 300-308 plus a parlor-buffet to be named Florence. 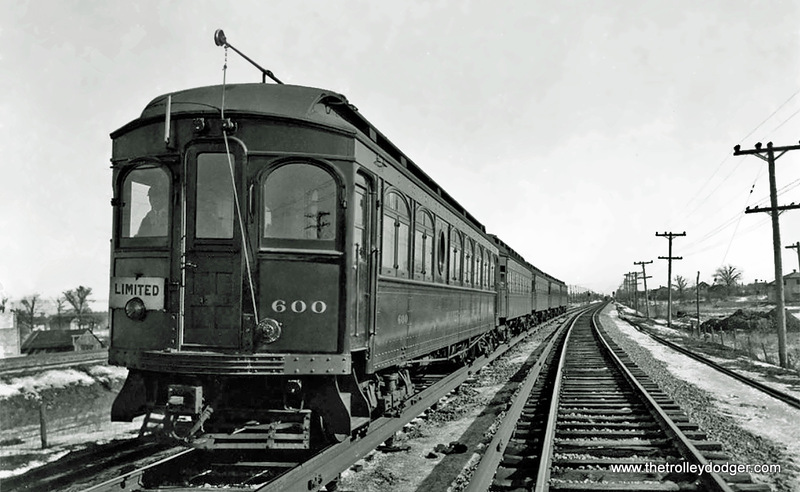 CA&E 305 was rebuilt as parlor-buffet 600 in 1929, later rebuilt again and renumbered 436 Florence Florence was rebuilt into parlor car 601 in 1923 no image found. 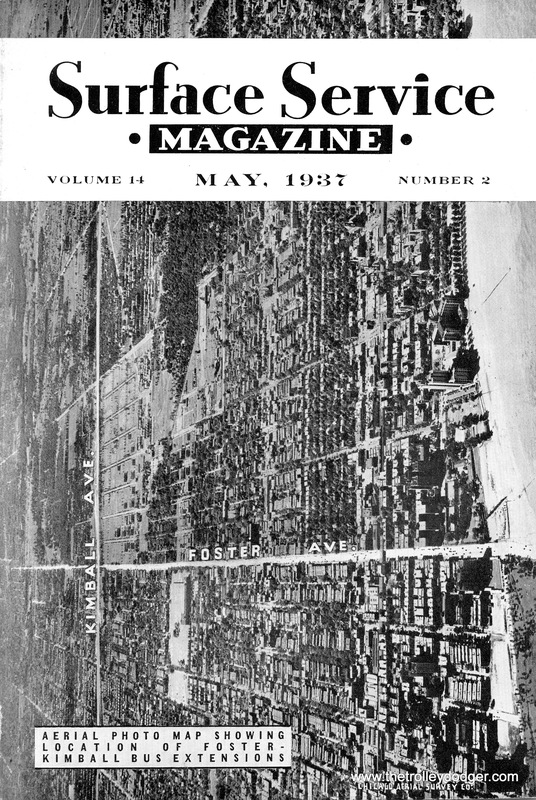 Florence was rebuilt again in 1929 and renumbered 435. 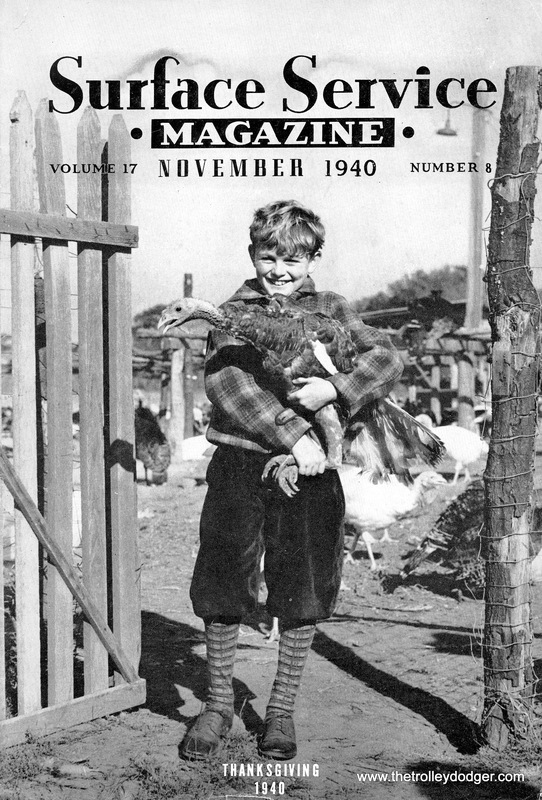 Thanks again for your website and all of the interesting stories within. 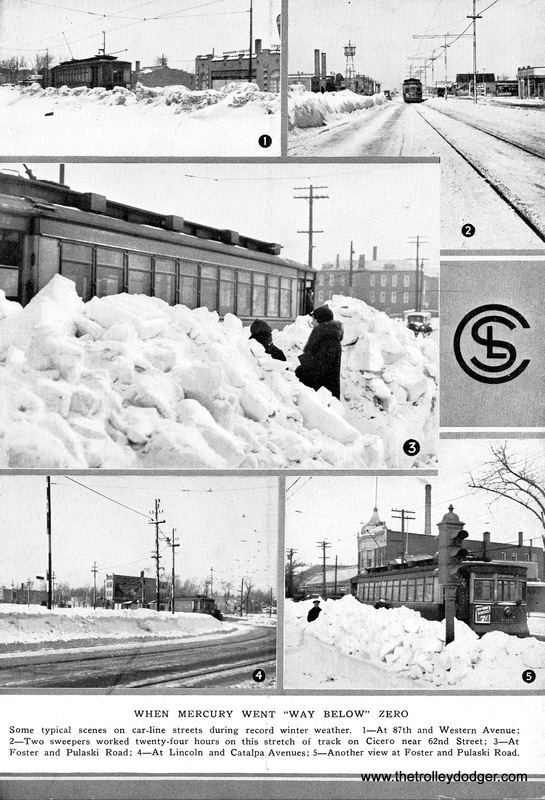 We are very appreciative of all the great pictures that Mr. Bejna shares with out readers. 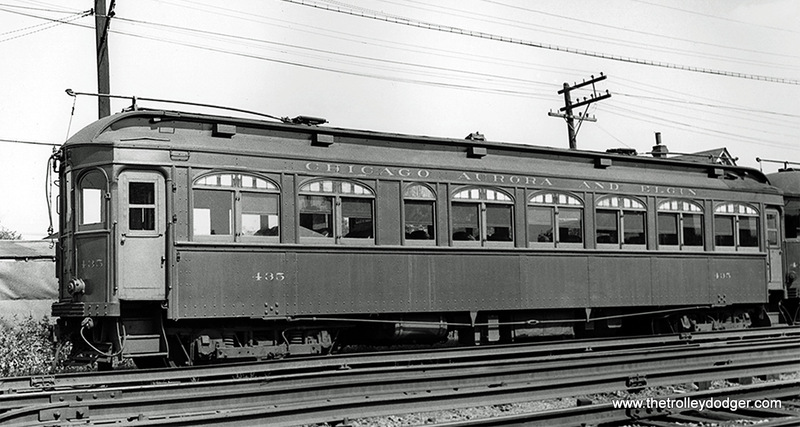 Car 436 at the Wheaton Shops (ex-car 600). 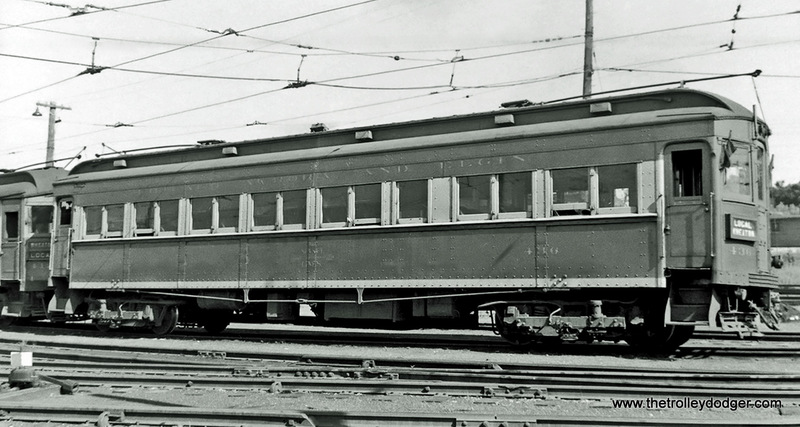 Car 435 at Wheaton Shops (ex-parlor car 601). 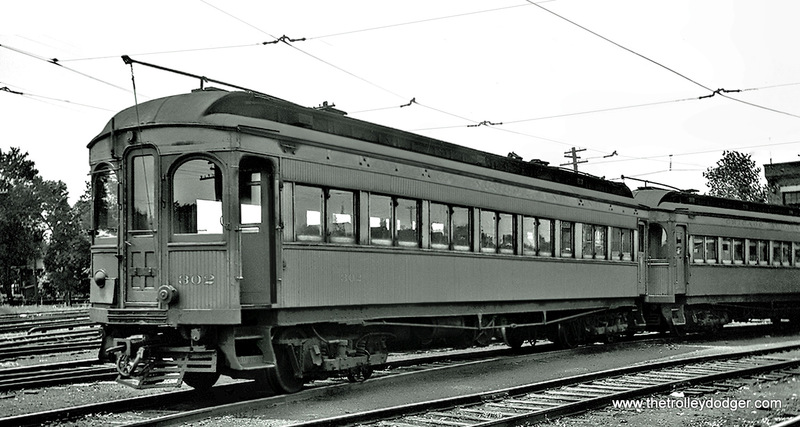 Car 308 (Niles, 1906). 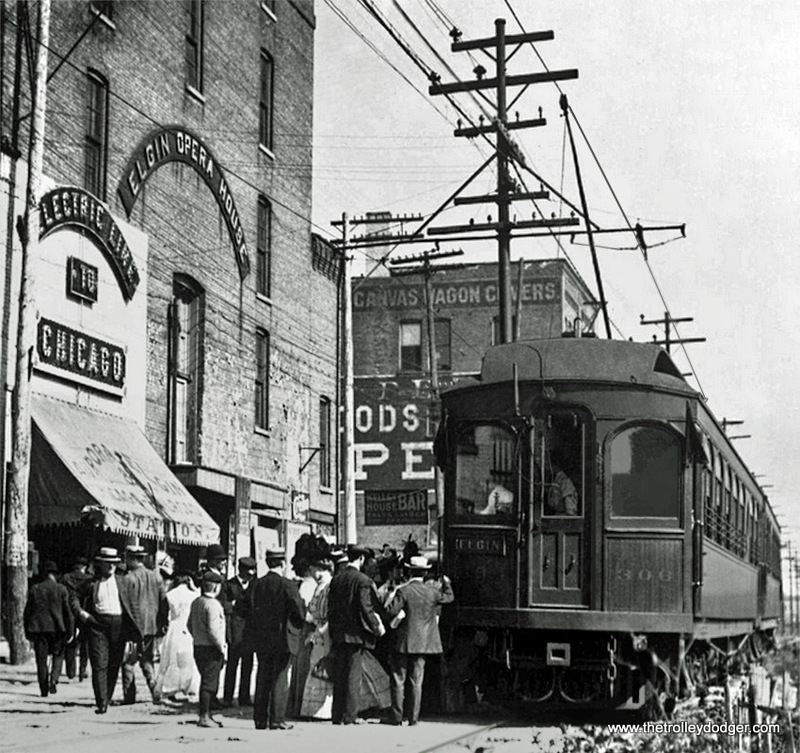 This picture looks like it was taken near Laramie on Chicago’s west side. 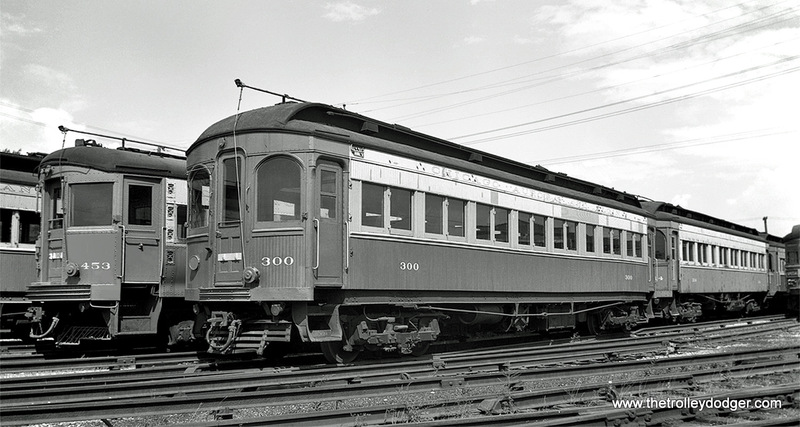 Car 306 (Niles, 1906) at the Elgin terminal. 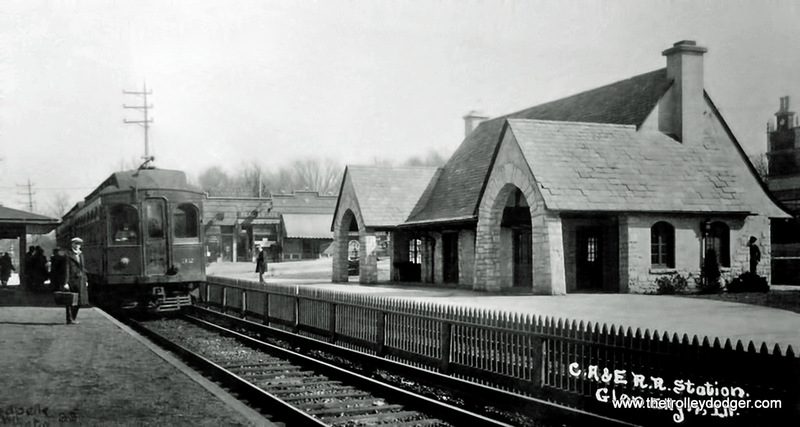 Car 32 (Stephenson, 1902) at Glen Ellyn. 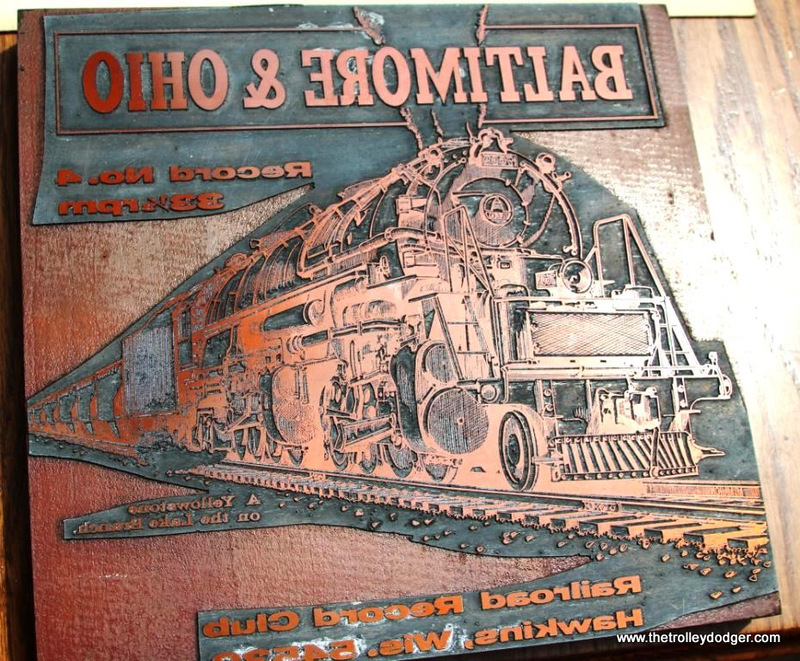 This is our 188th post, and we are gradually creating a body of work and an online resource for the benefit of all railfans, everywhere. 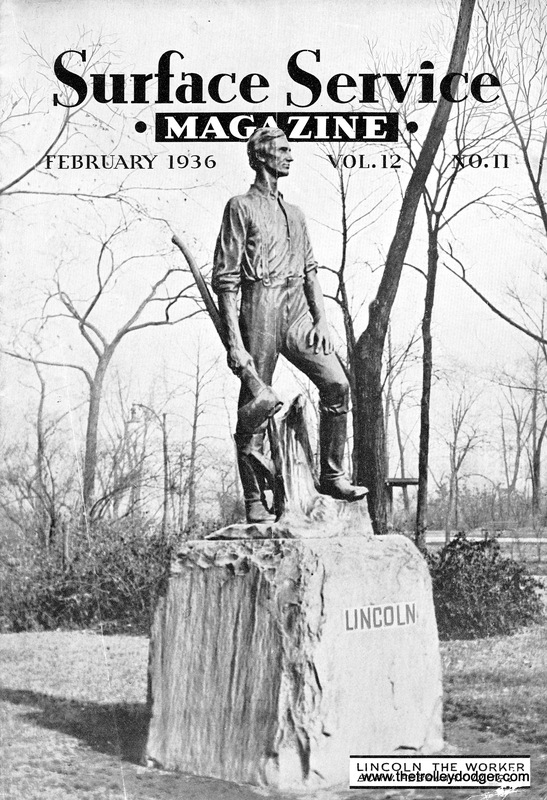 To date, we have received over 301,000 page views, for which we are very grateful.